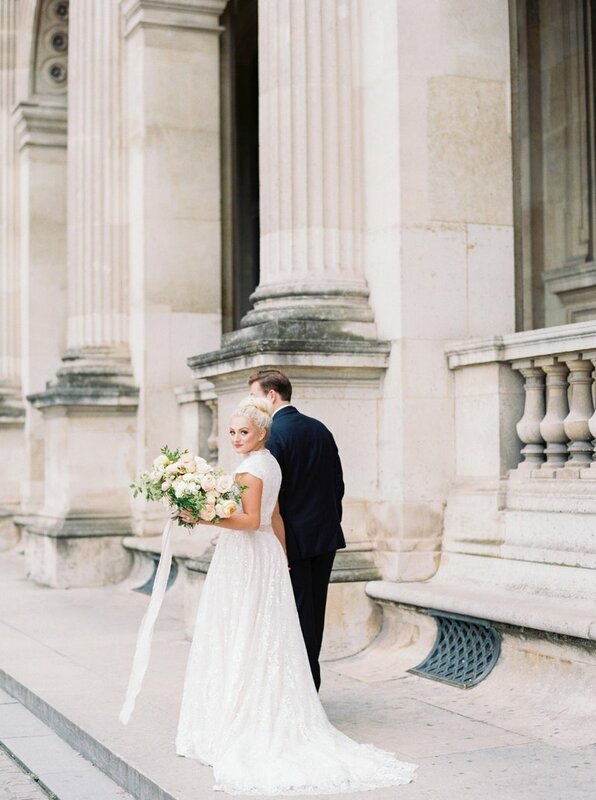 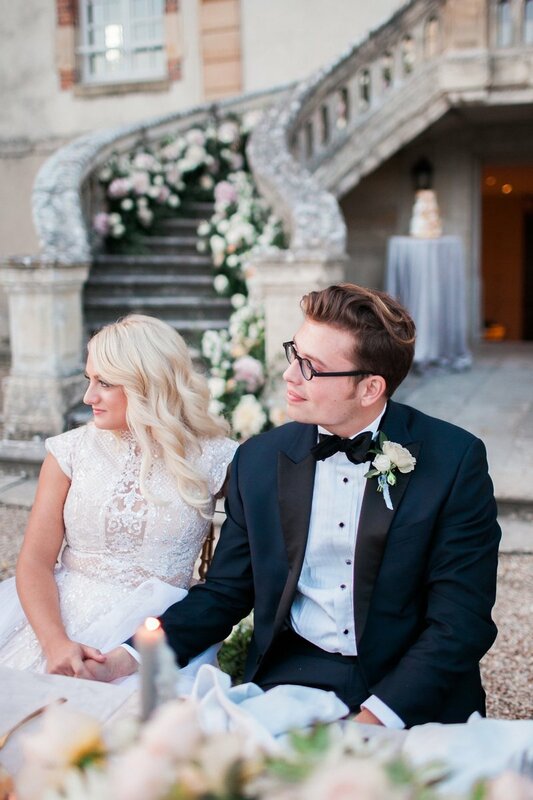 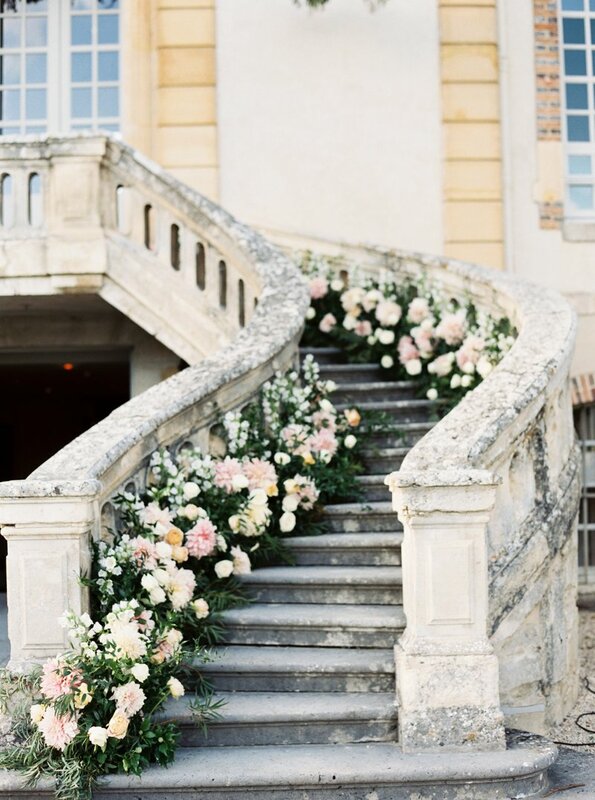 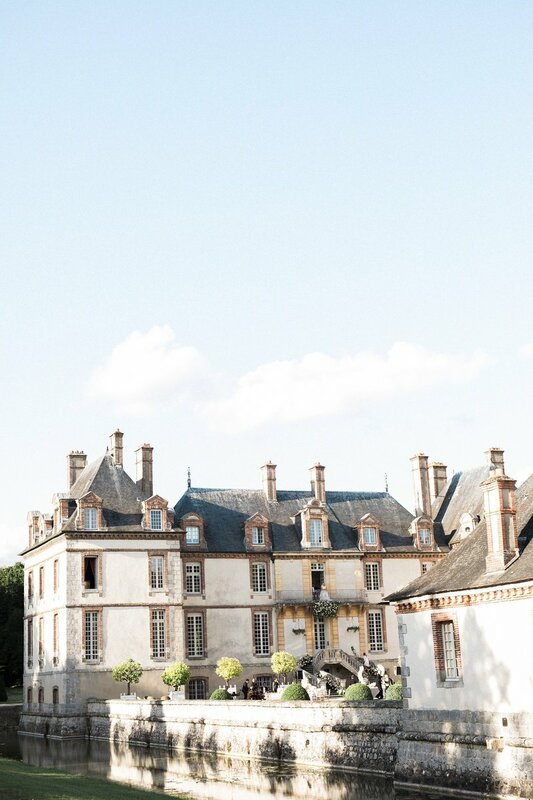 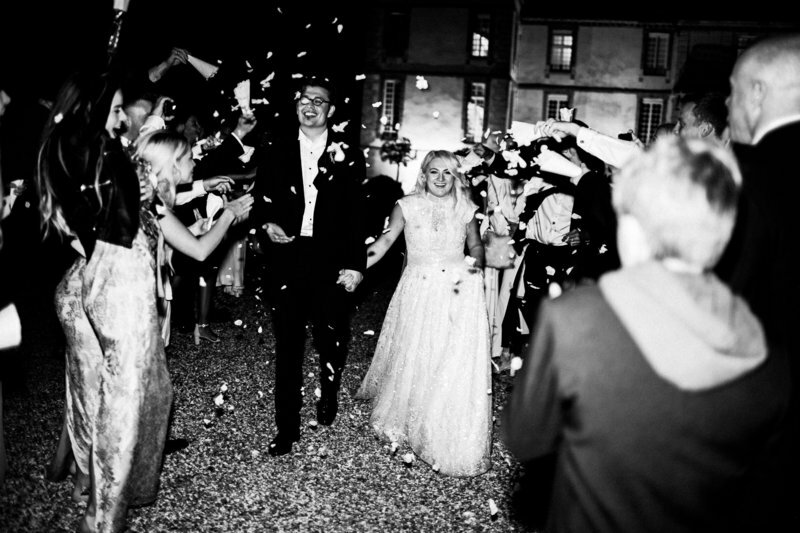 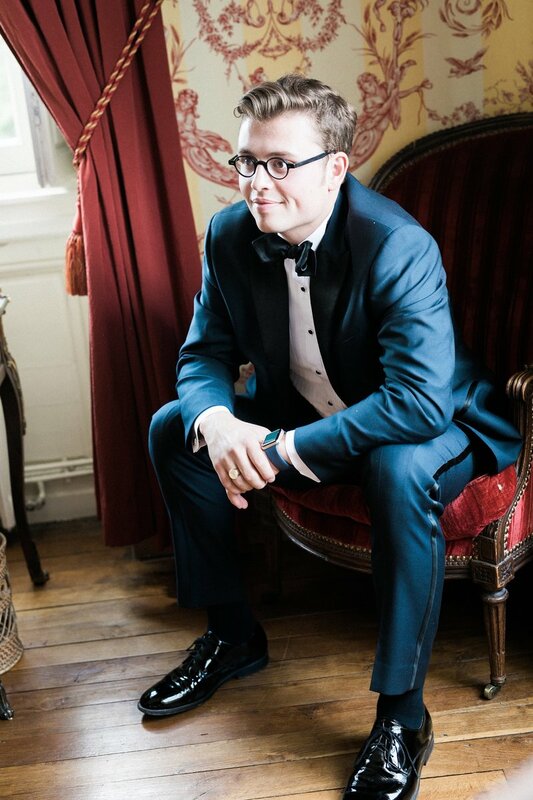 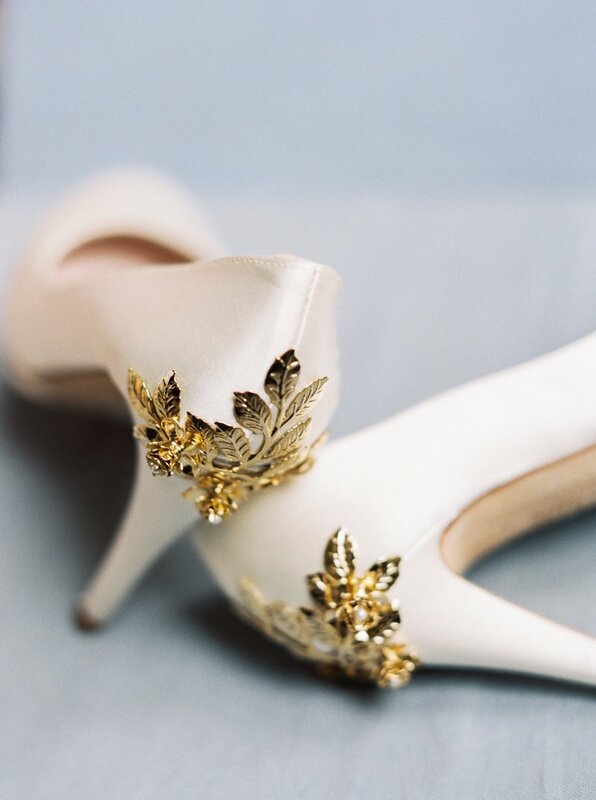 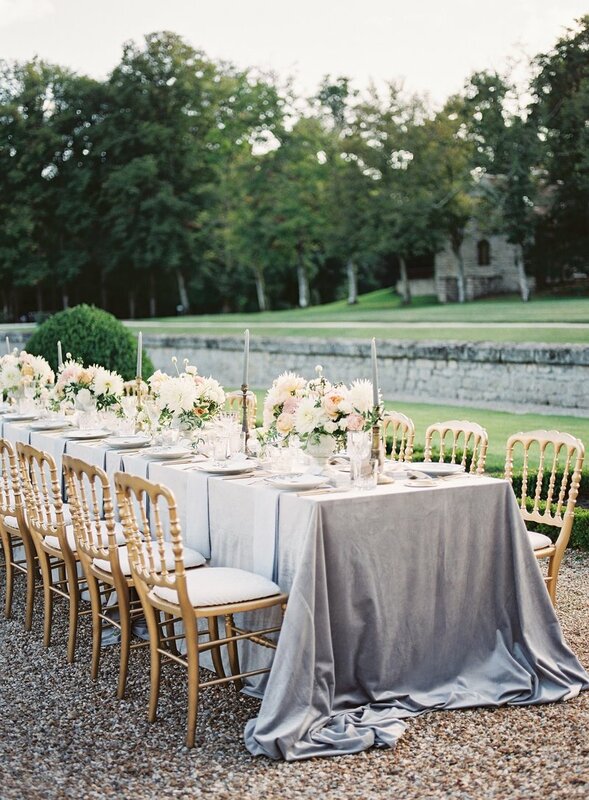 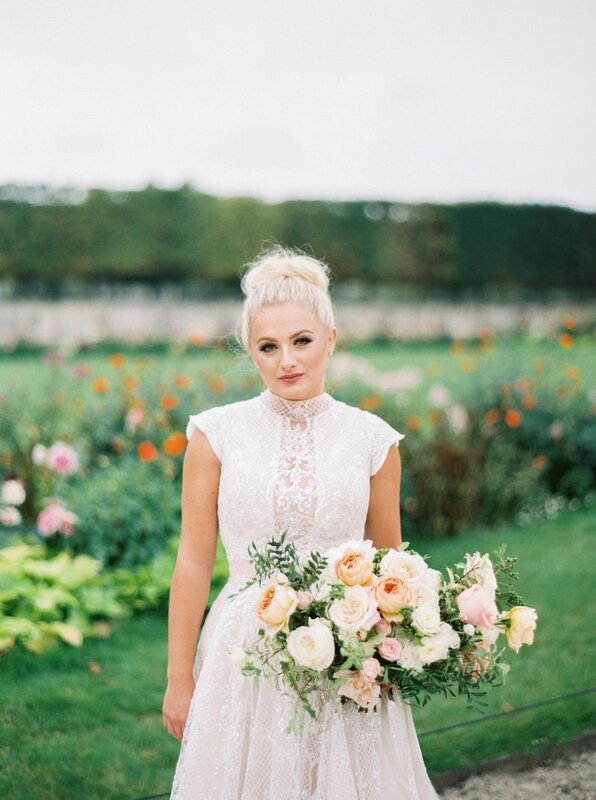 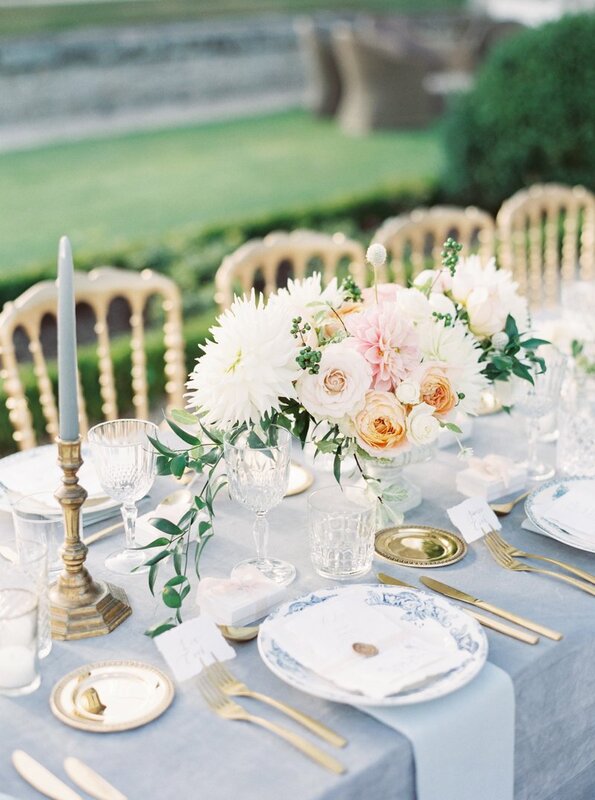 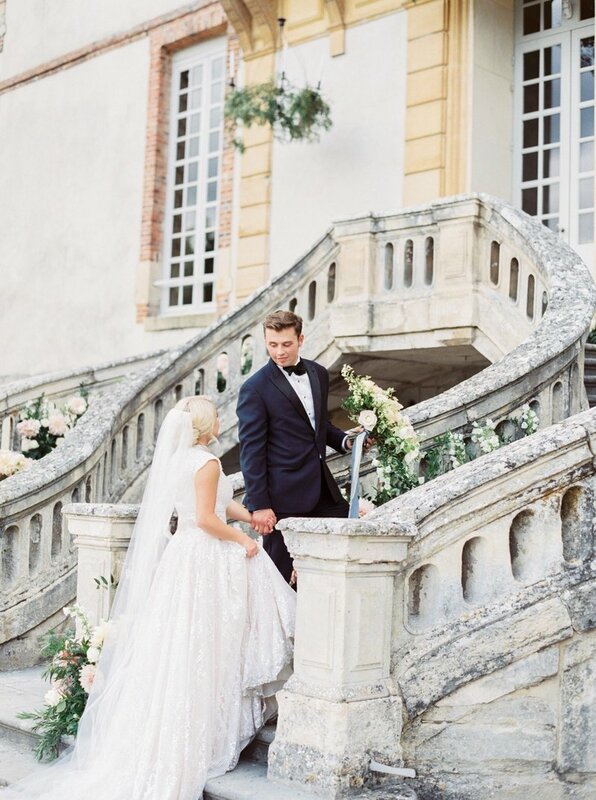 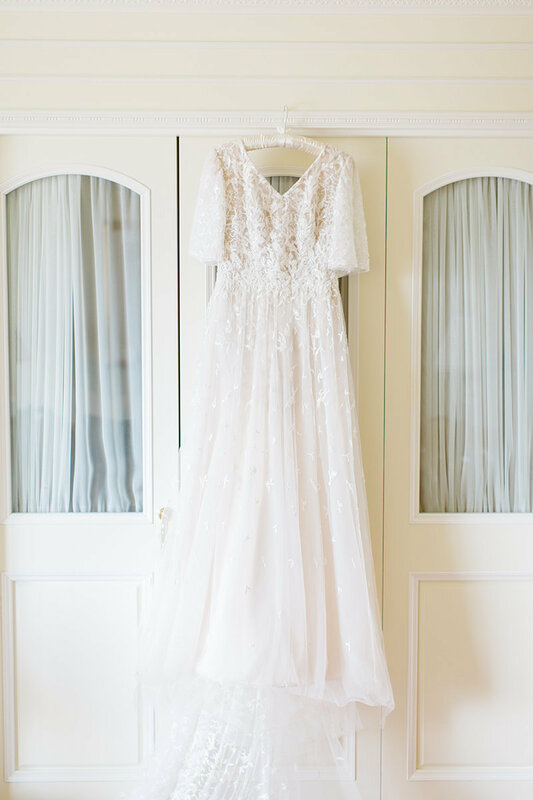 This romantic destination wedding took place in a 16th century French Château. 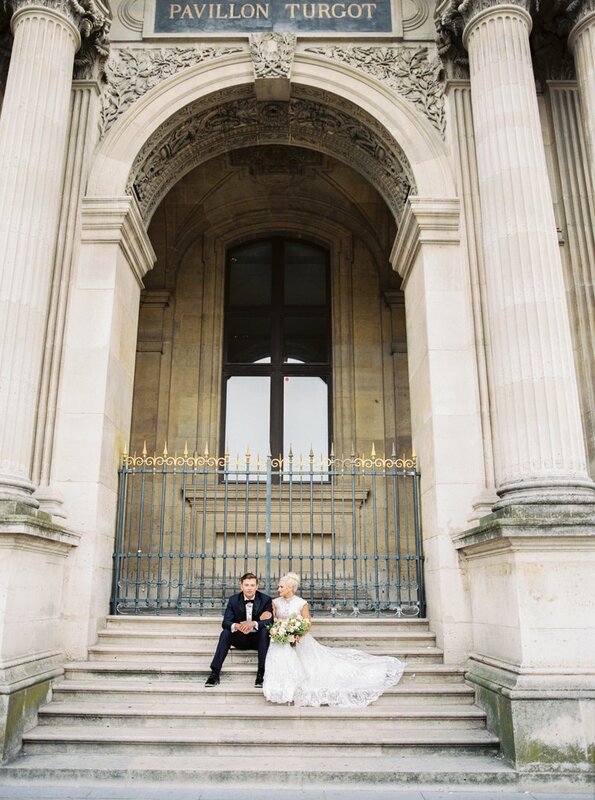 The couple welcomed guests with a dinner at the historic Le Train Bleu in Paris followed by their ceremony the next morning in Versailles, France. 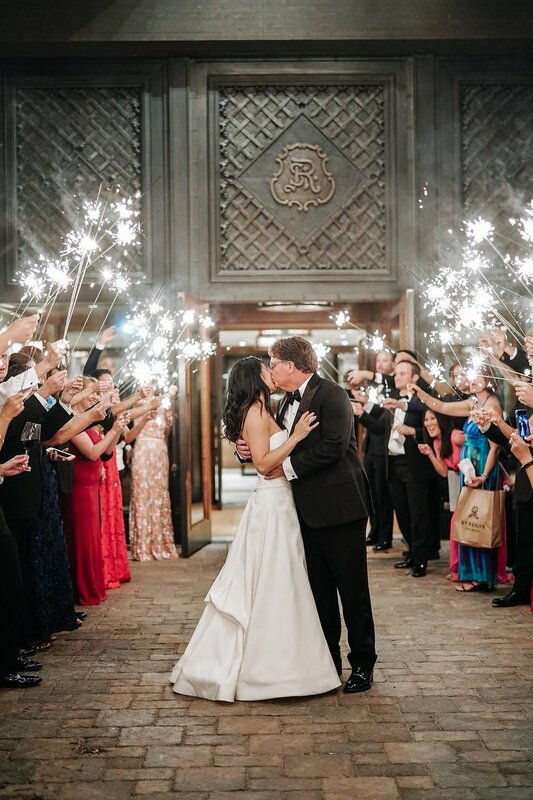 They group made their way to Fontainebleau for an evening of French cuisine, live jazz music, and fireworks. 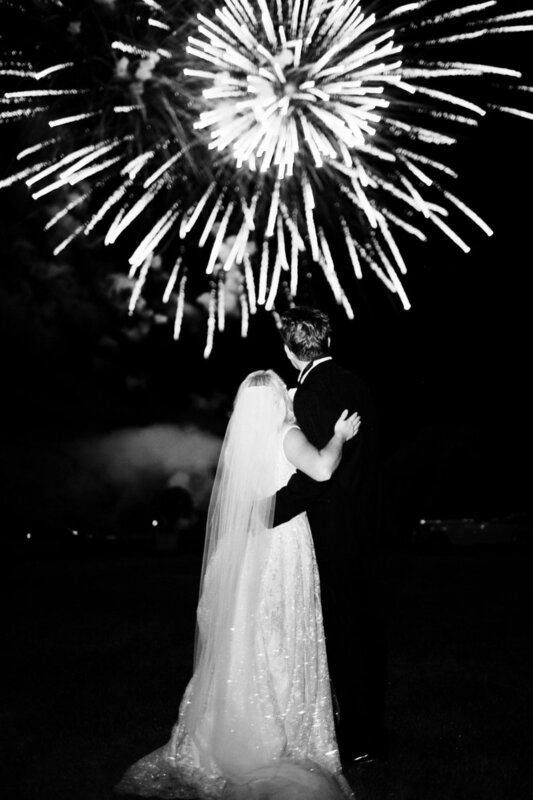 It was an unforgettable night! 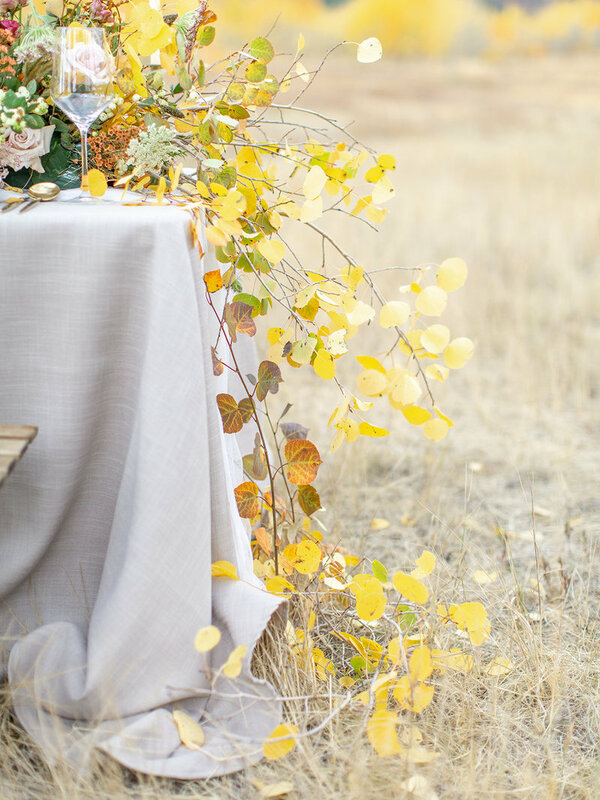 Inspired by the gorgeous golden hues of the changing seasons, for this design we focused on creating a natural, yet refined look. 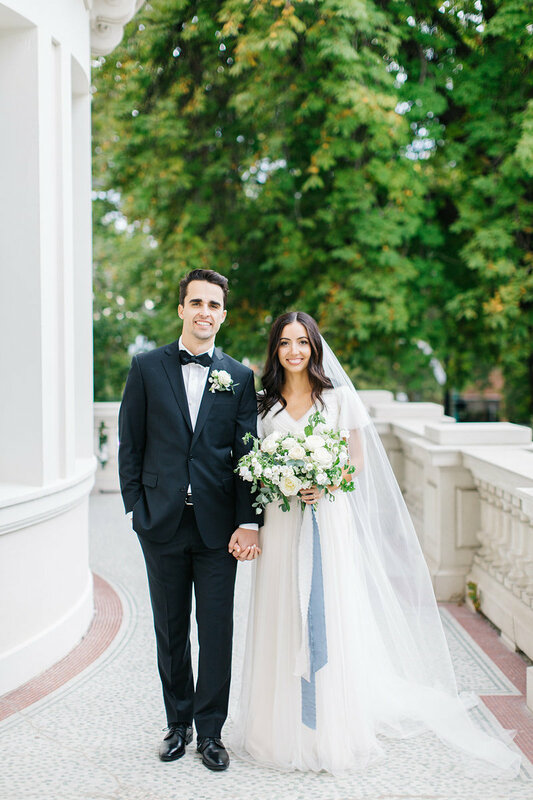 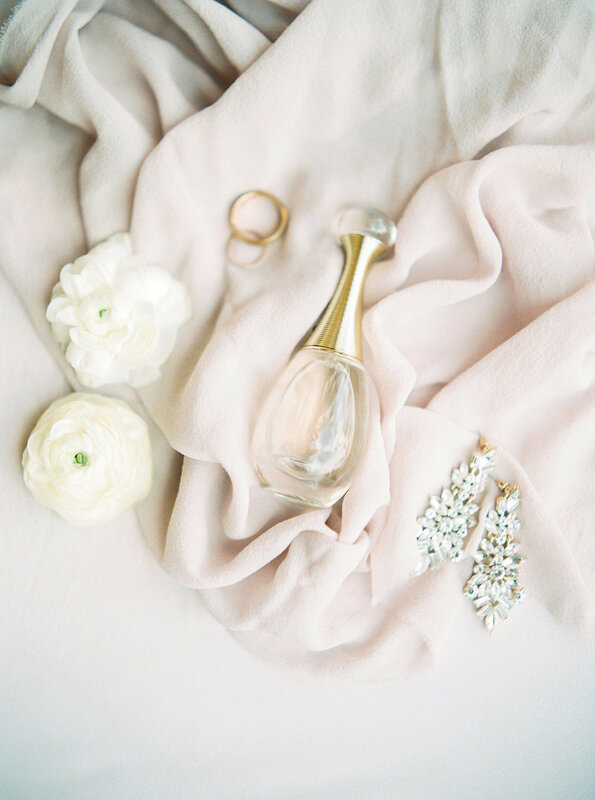 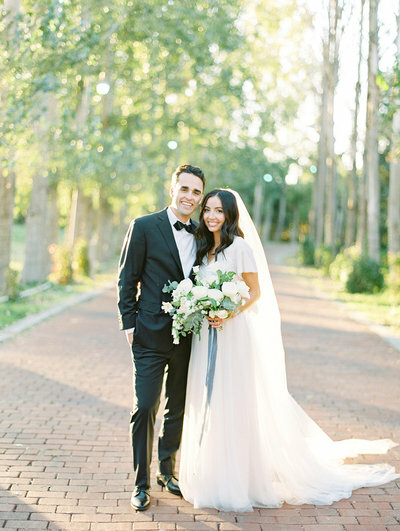 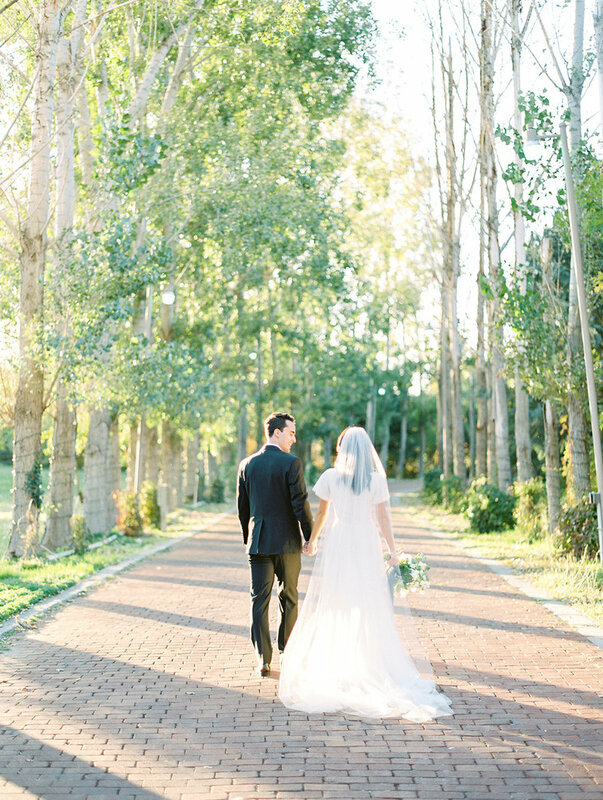 The bride donned a statement Alexandra Grecco cape and the groom in a neutral suit to balance the colors of the season. 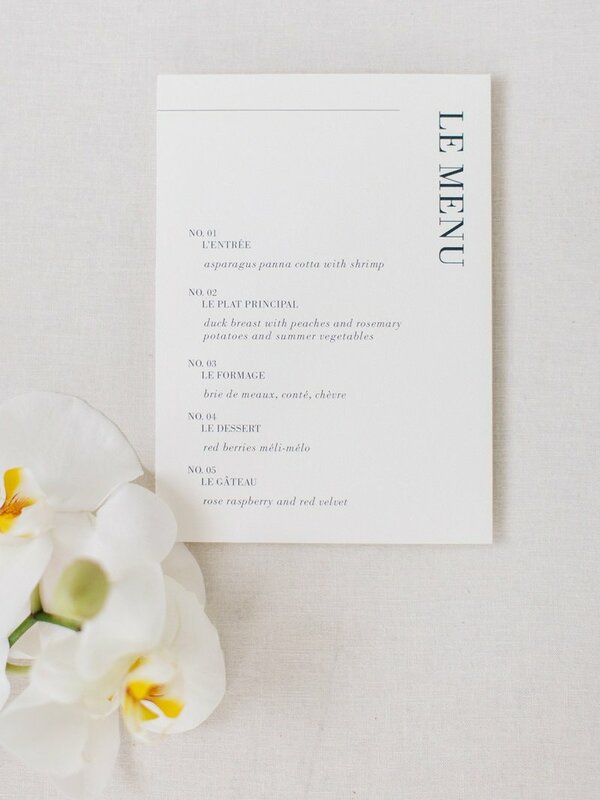 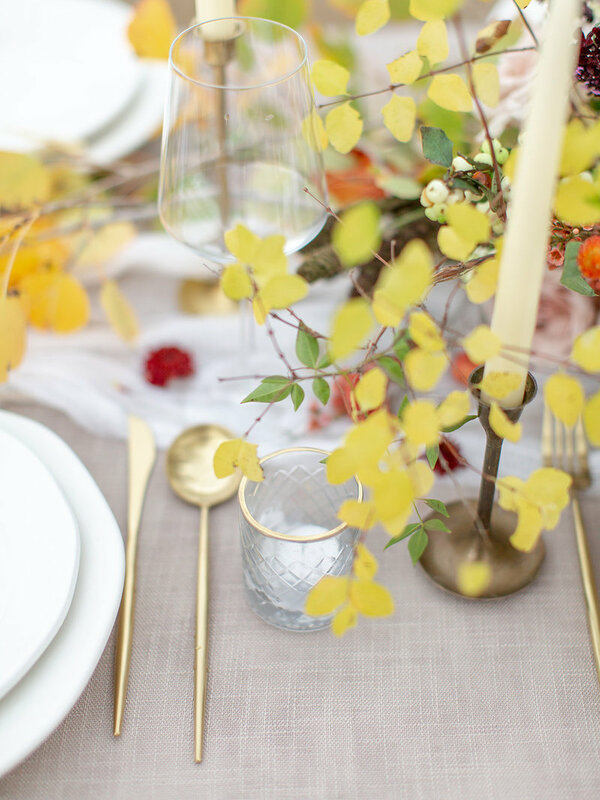 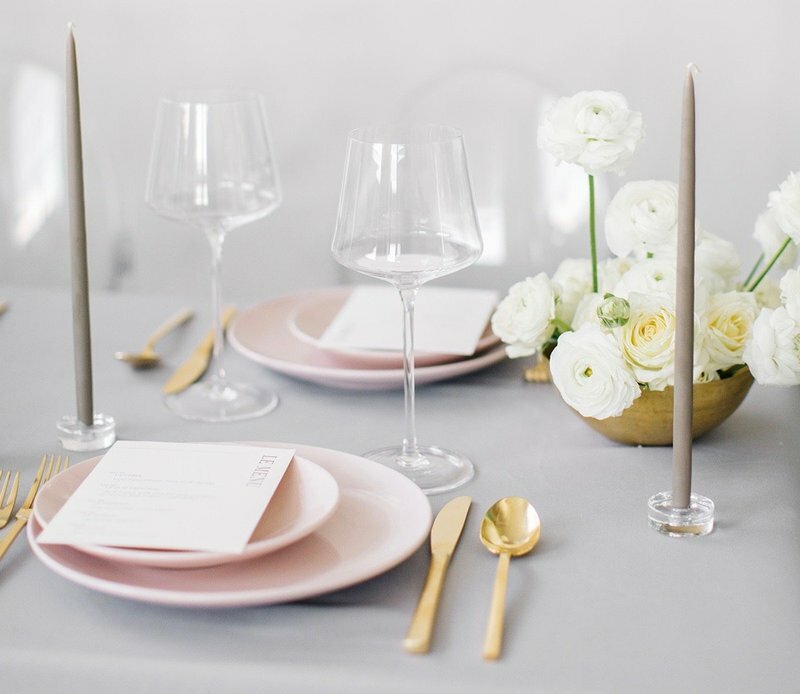 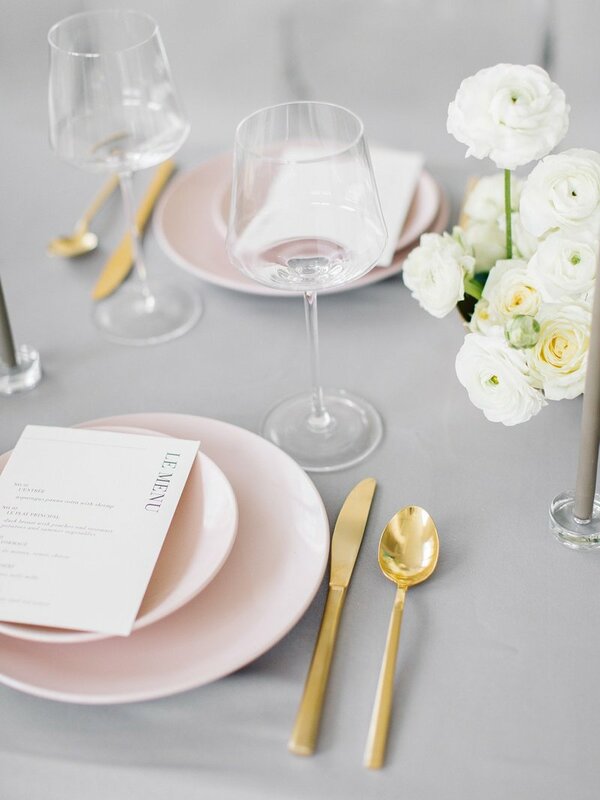 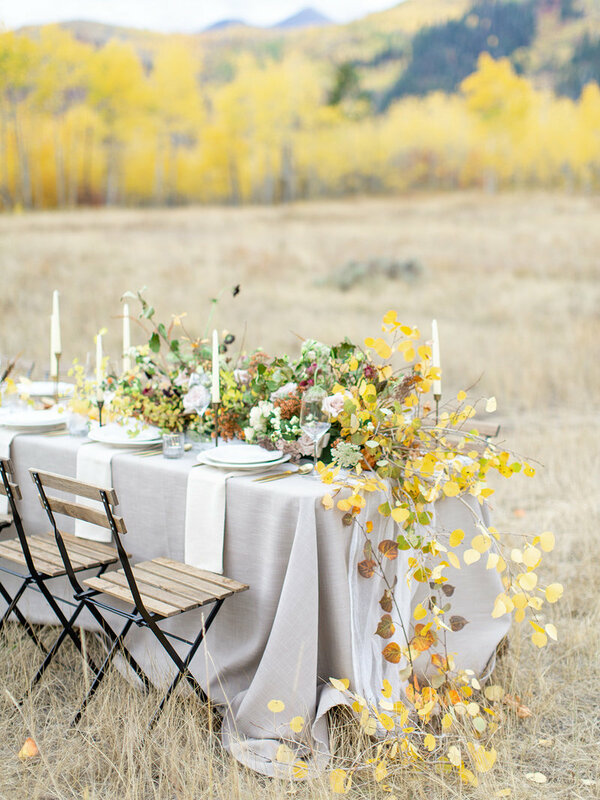 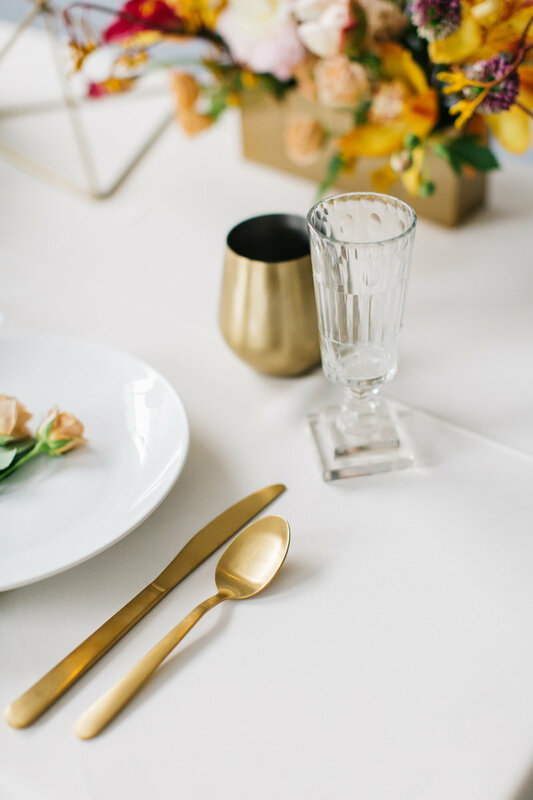 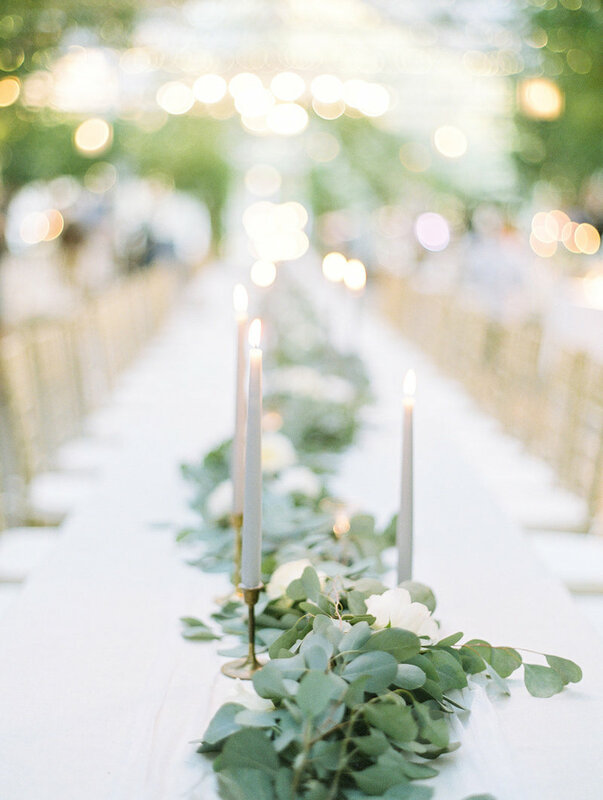 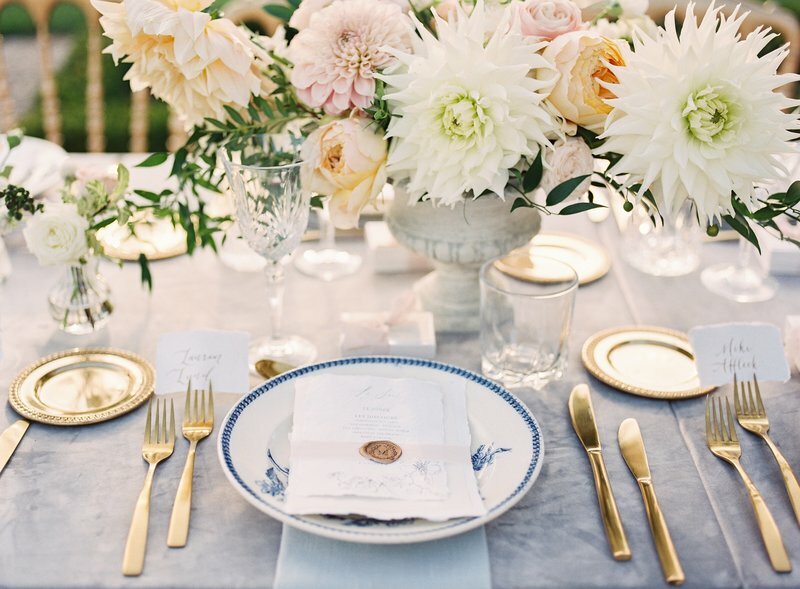 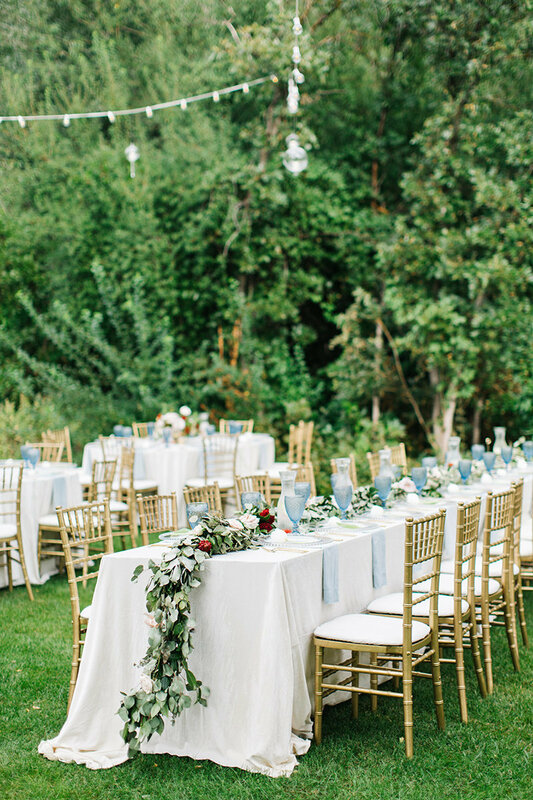 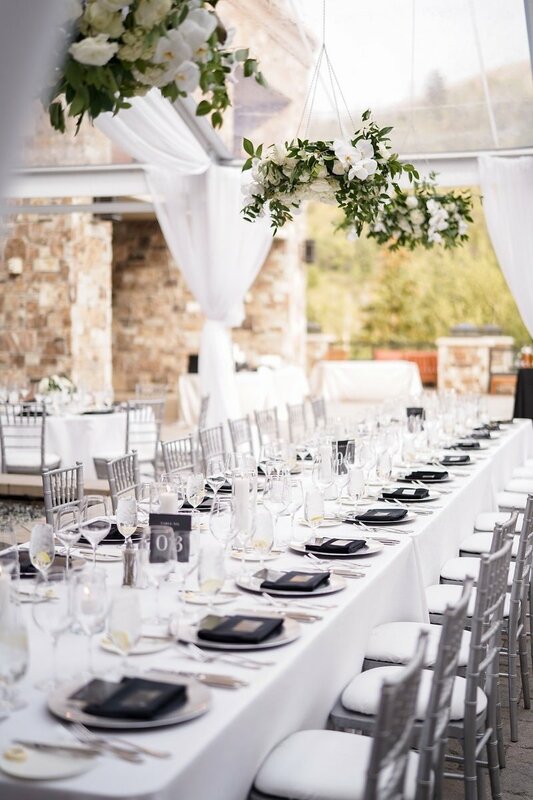 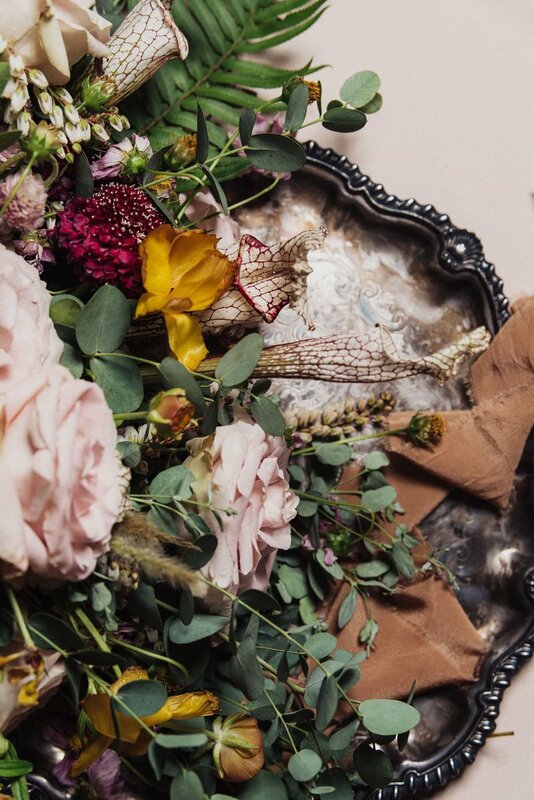 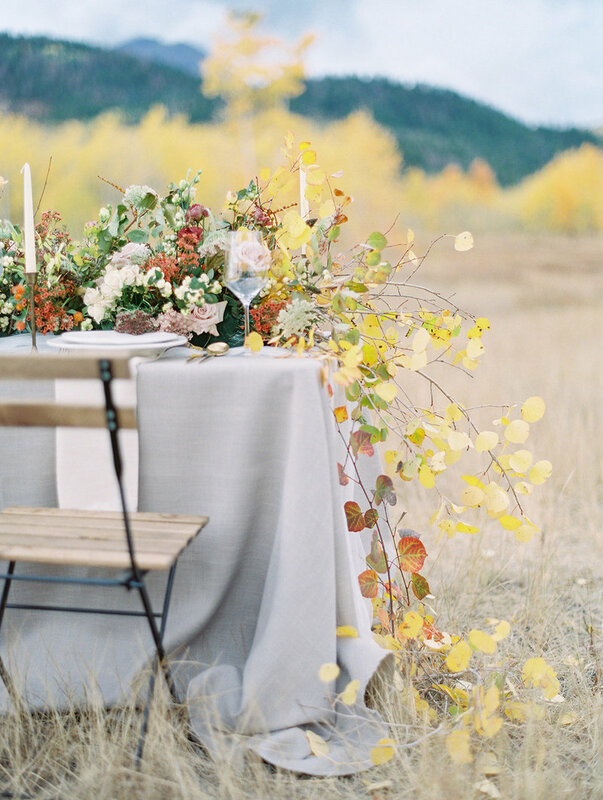 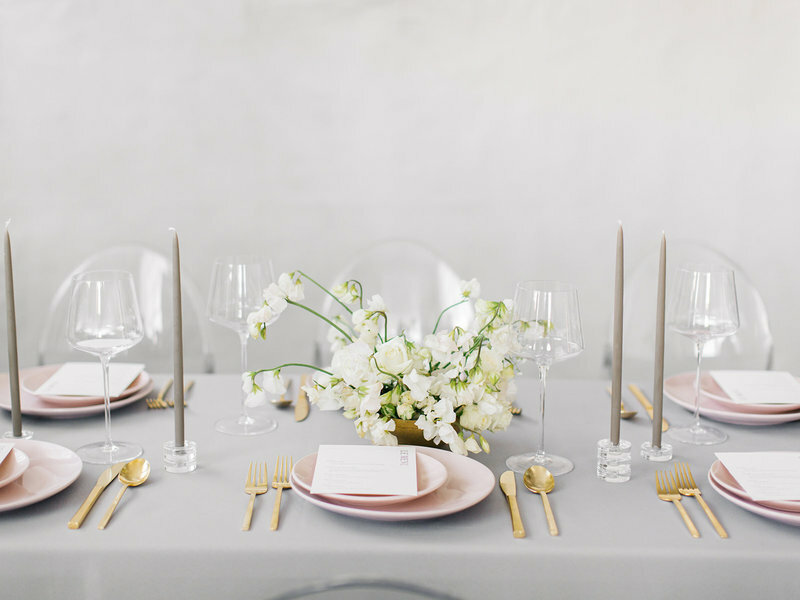 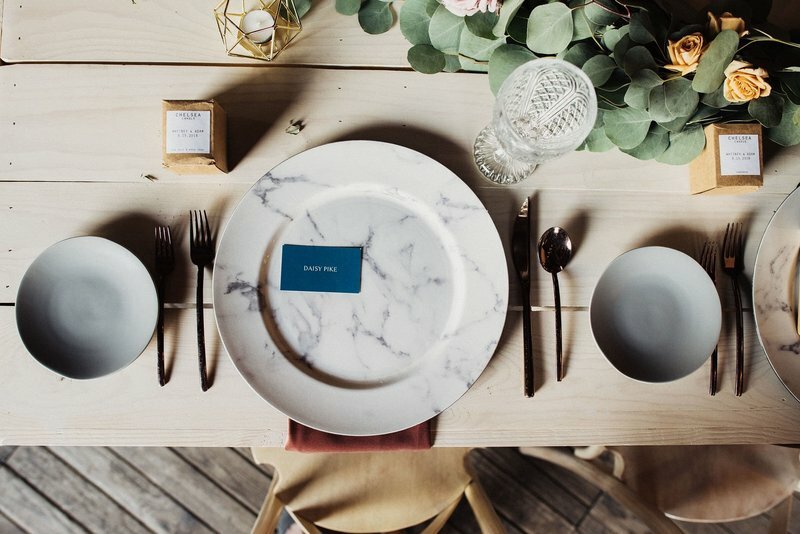 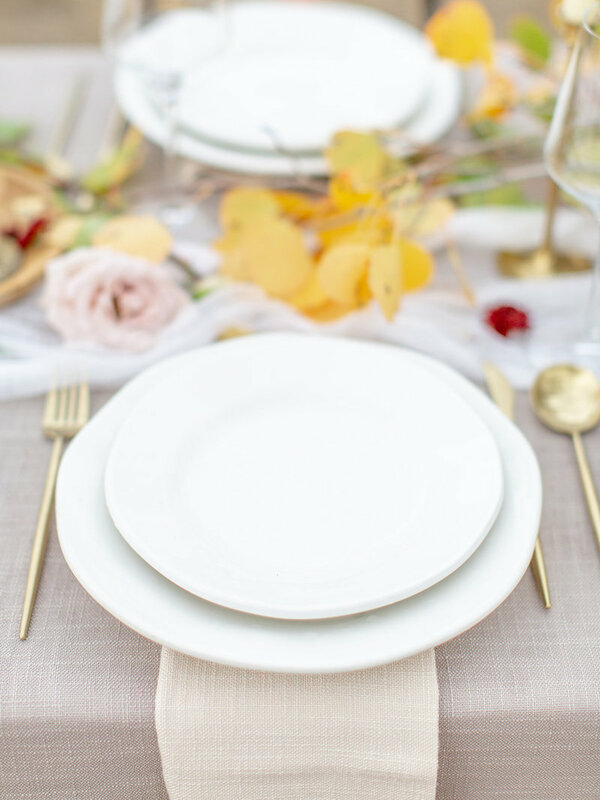 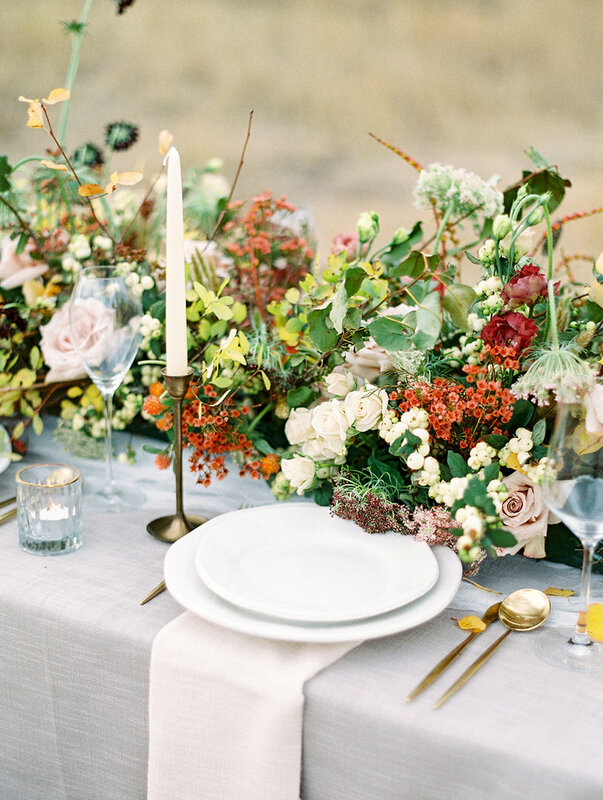 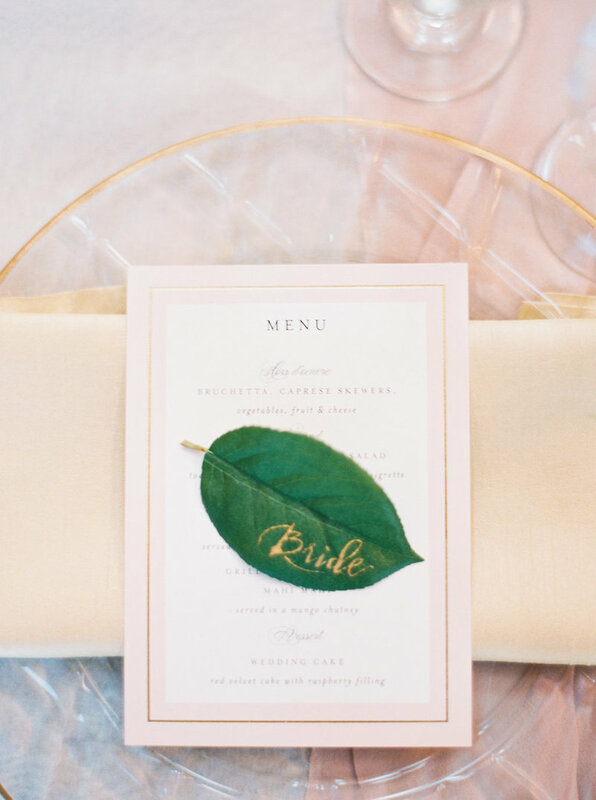 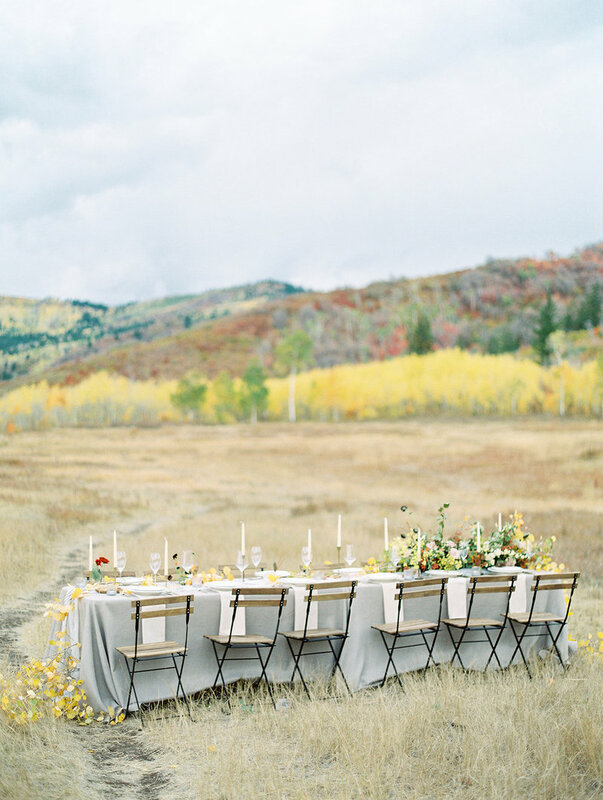 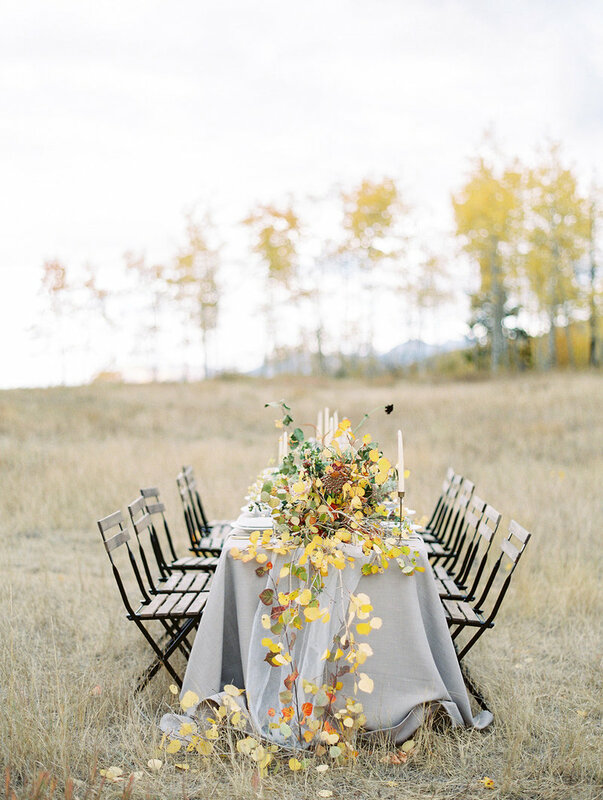 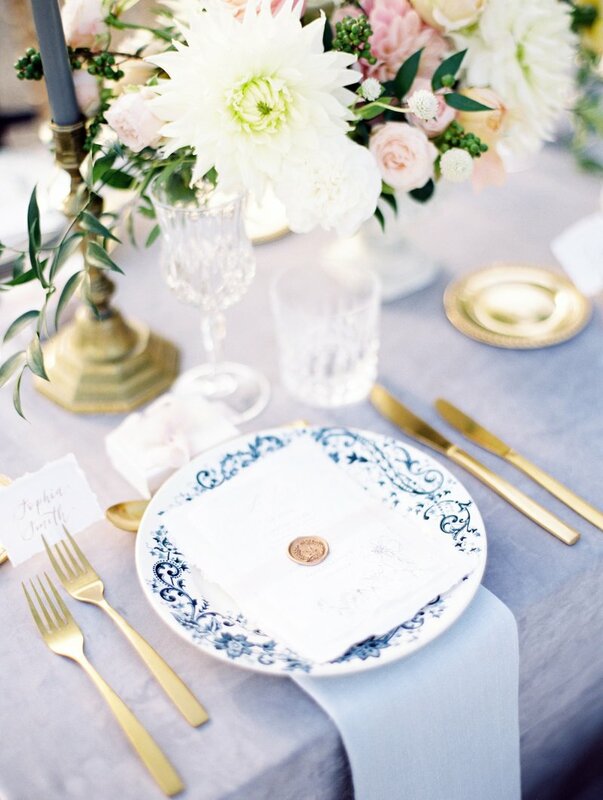 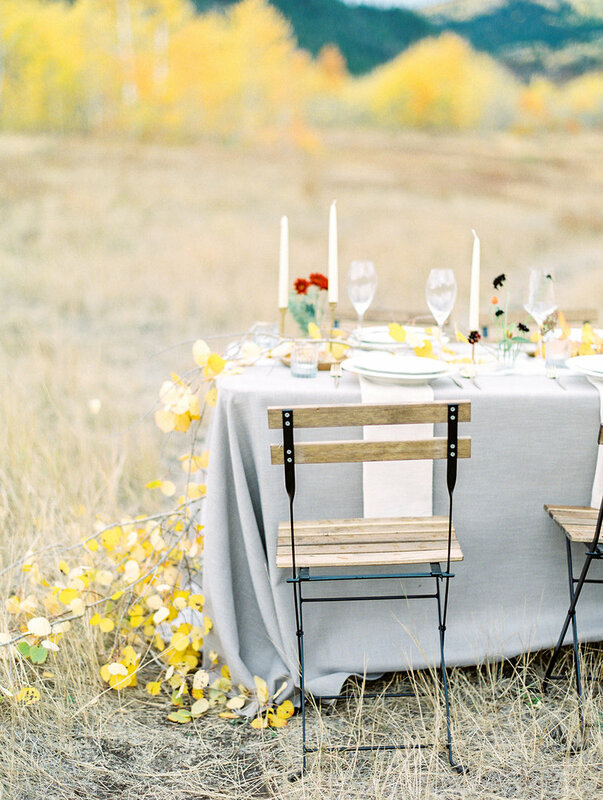 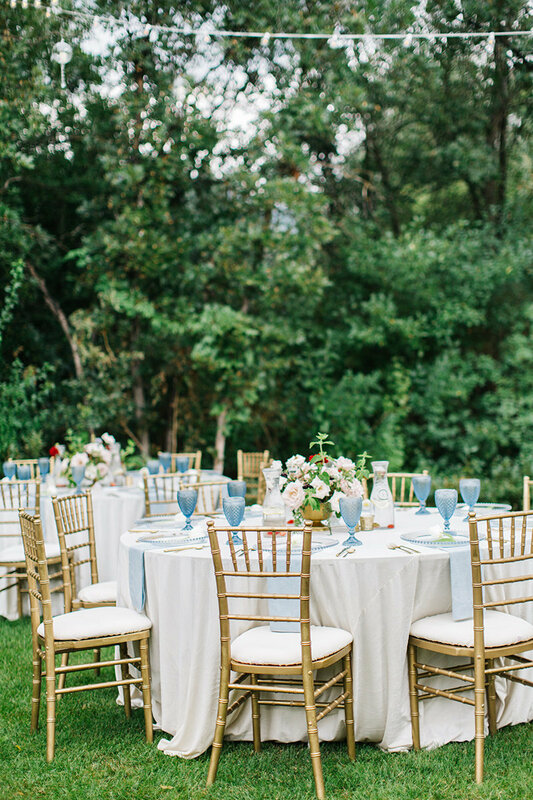 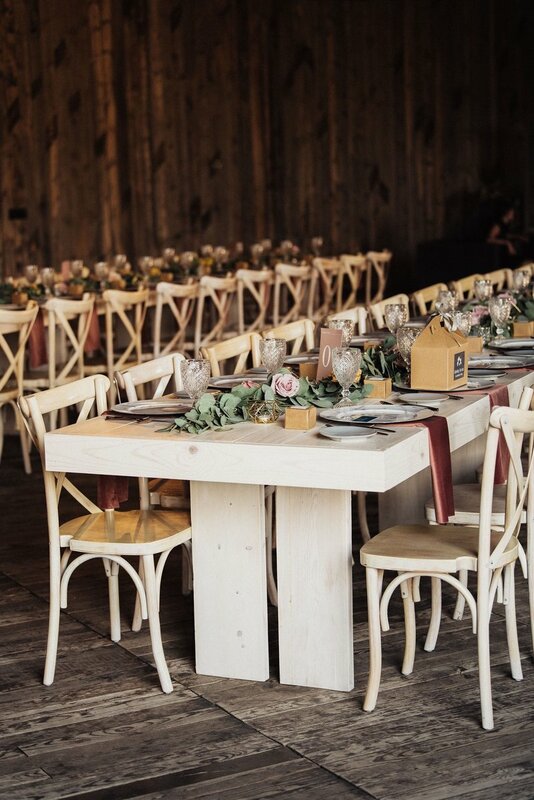 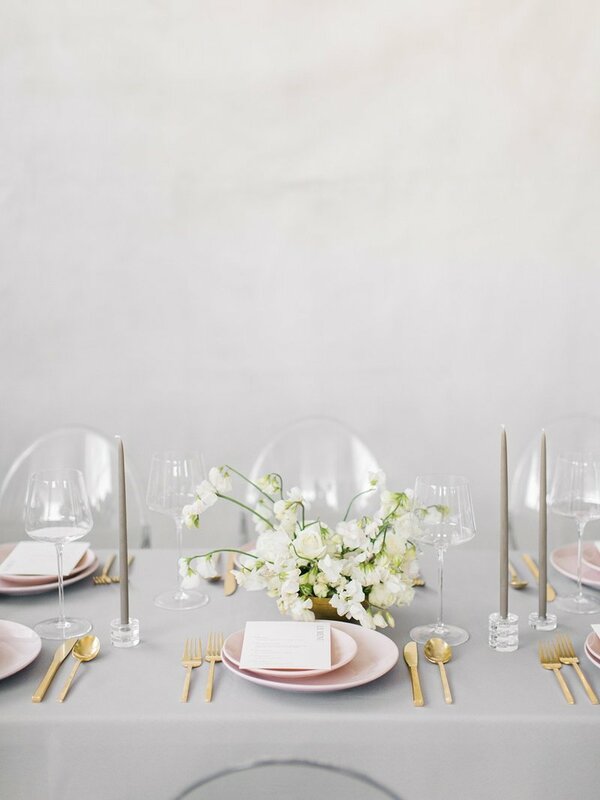 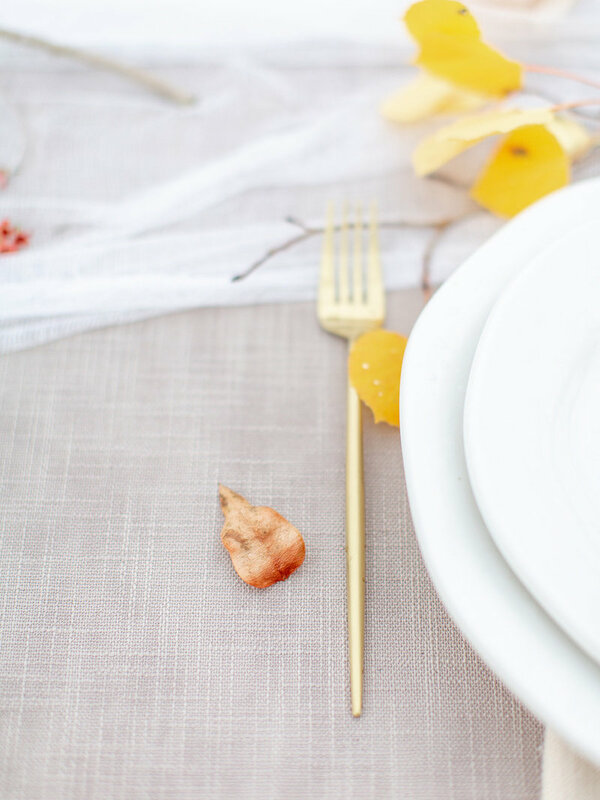 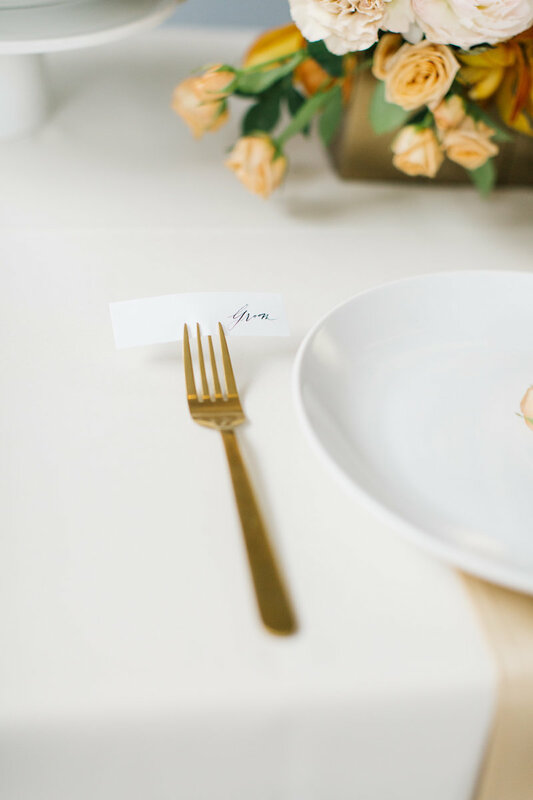 The details were luxe, yet maintained an organic feel with an intimate candlelit dinner in the mountains. 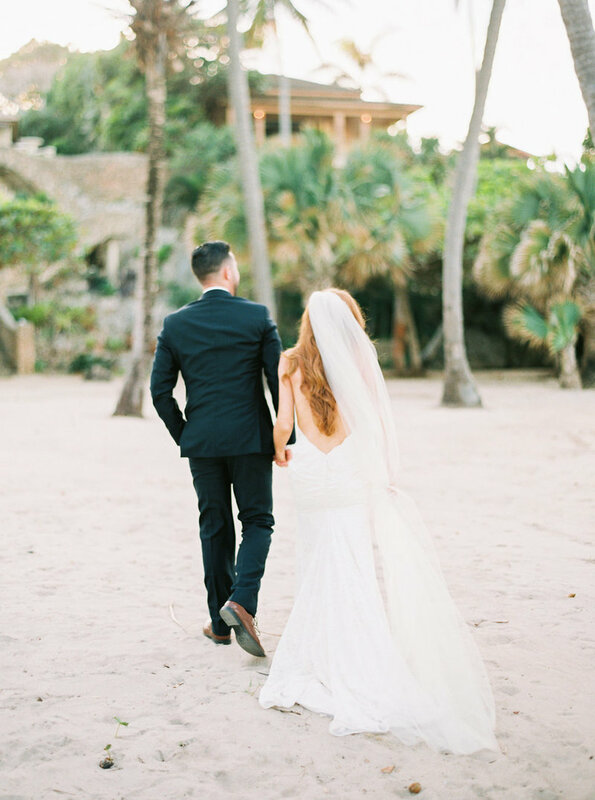 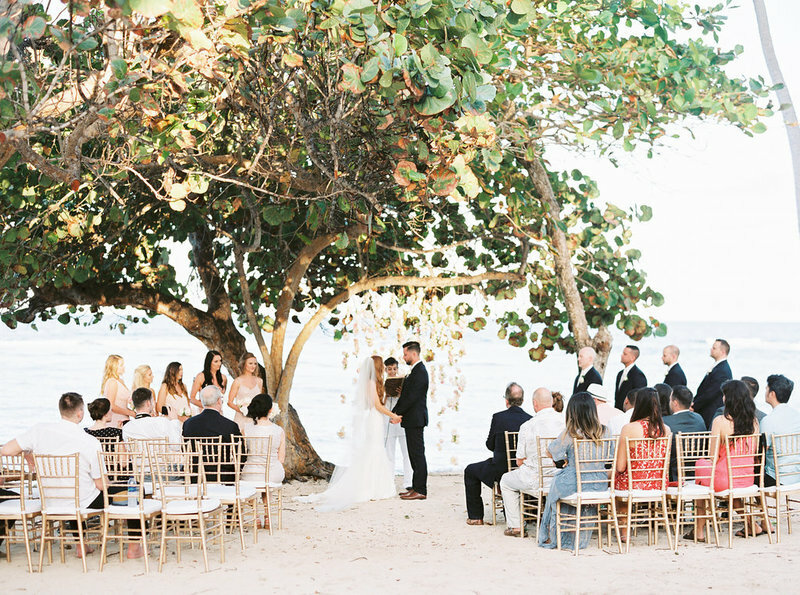 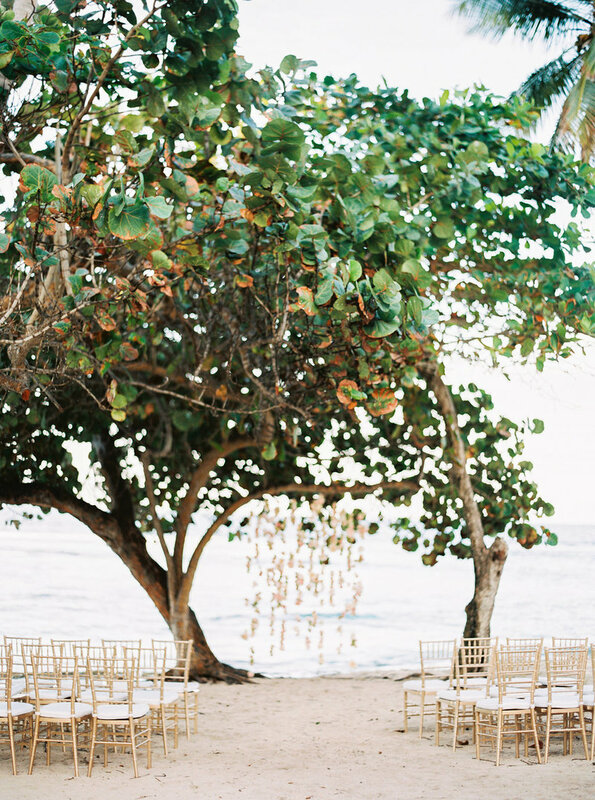 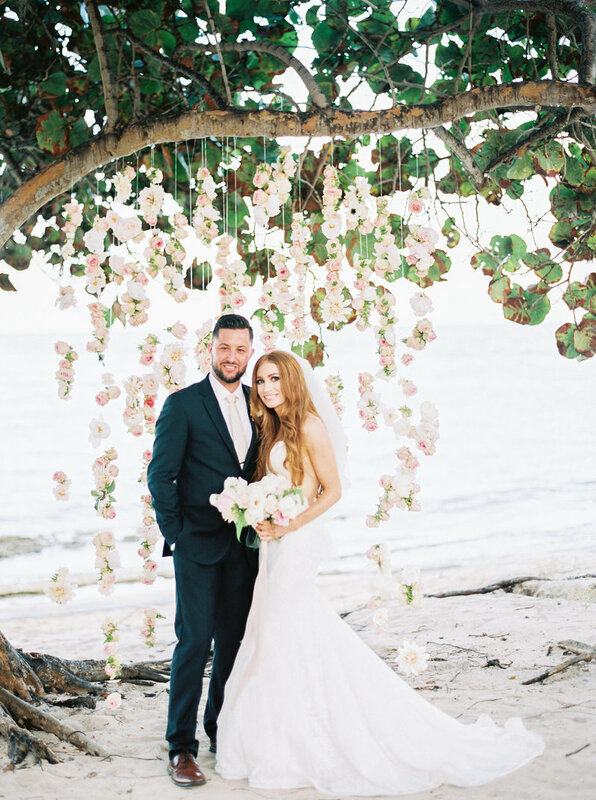 This gorgeous couple was wed deep in the jungle of the Dominican Republic on the beaches of Flor de Cabrera. 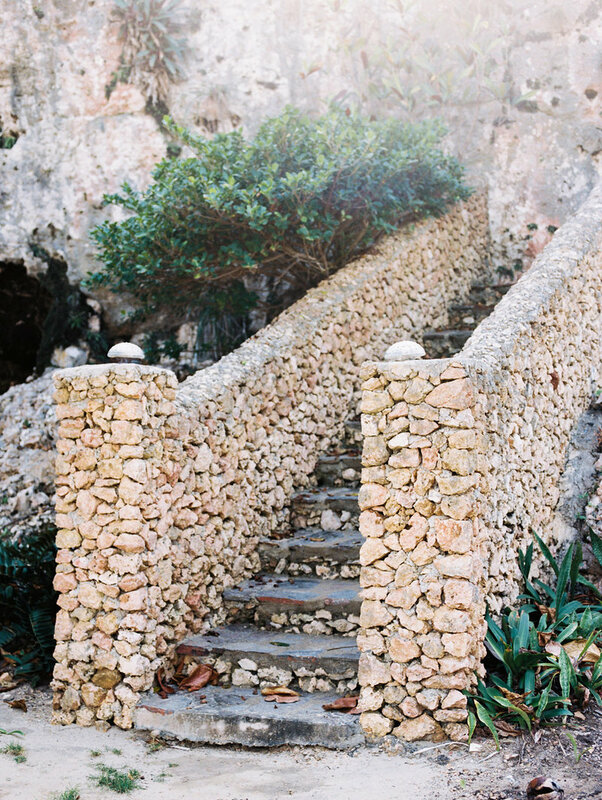 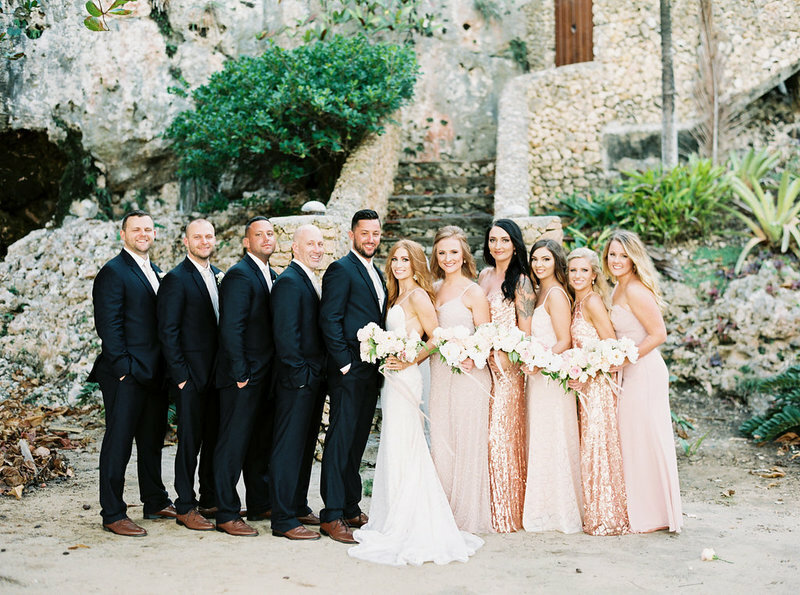 The venue donned hundreds of arching palm trees, ancient staircases, and a Spanish style villa where the group dined, danced, and celebrated into the night. 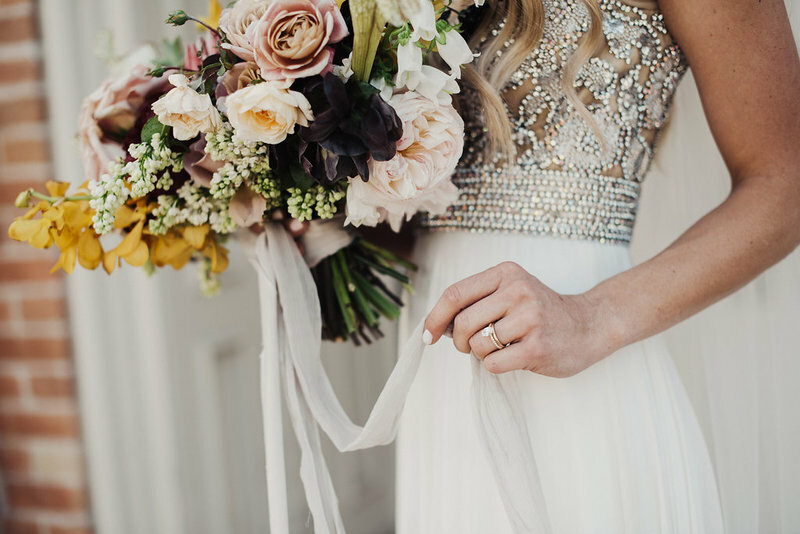 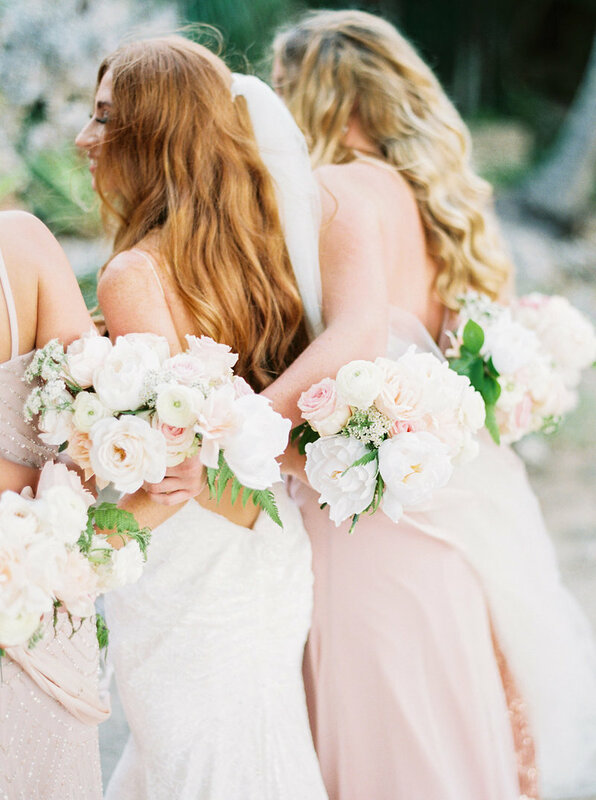 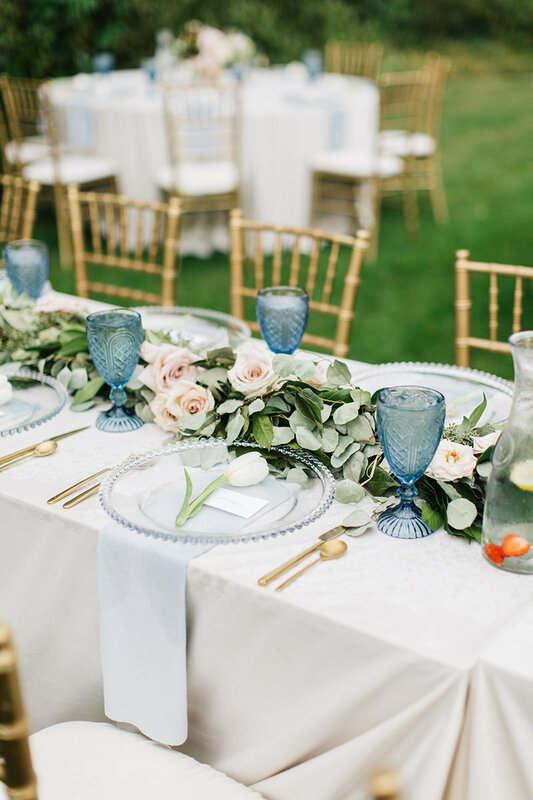 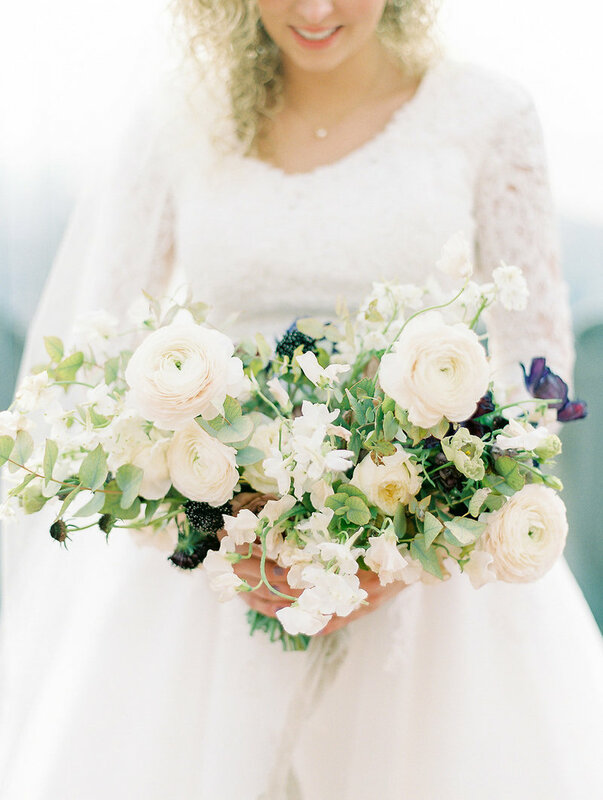 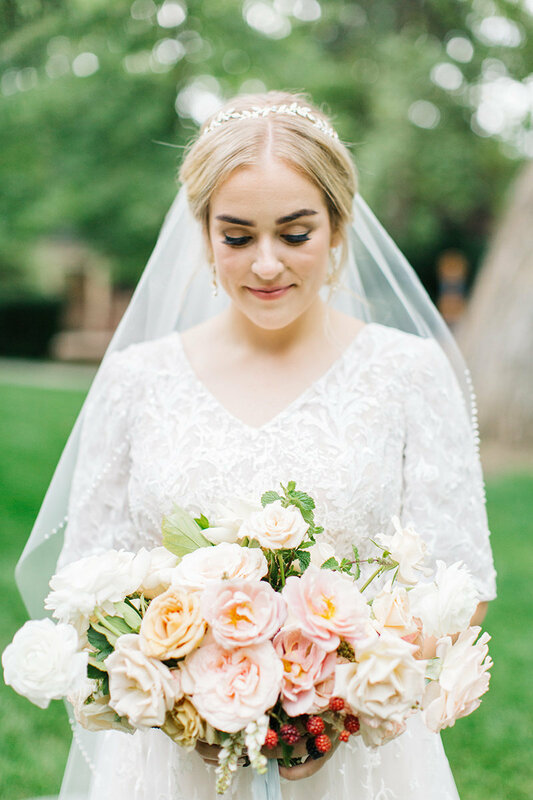 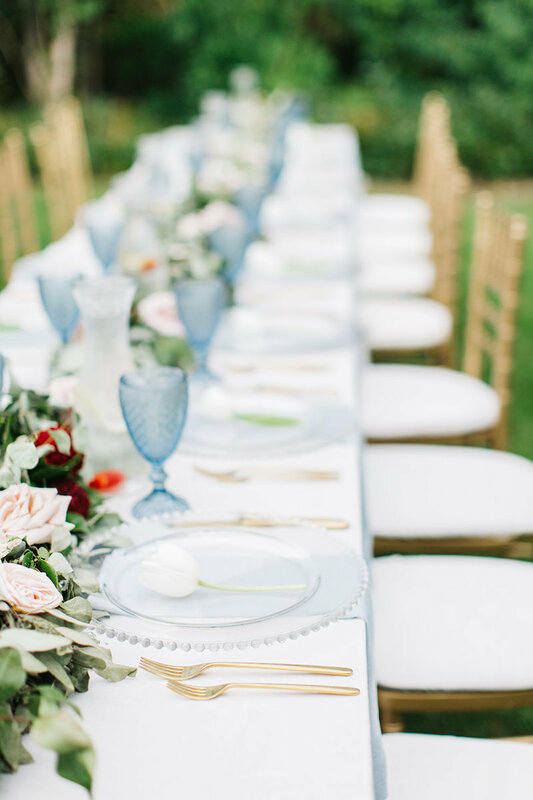 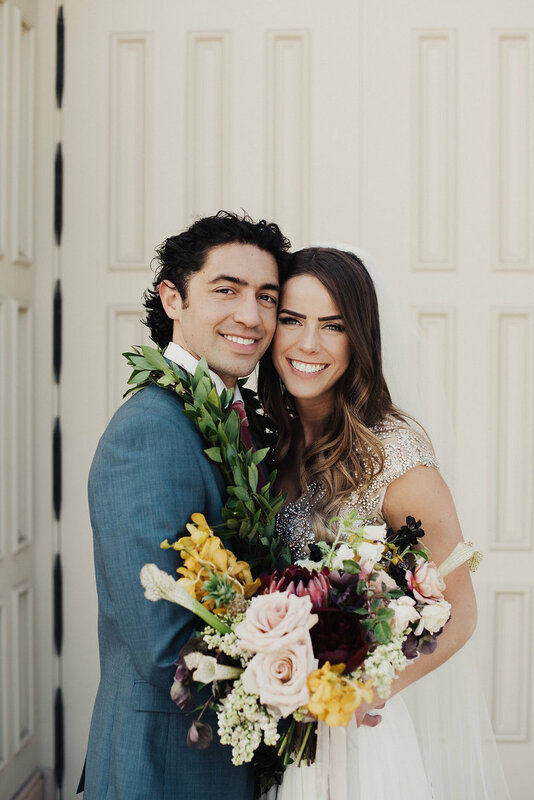 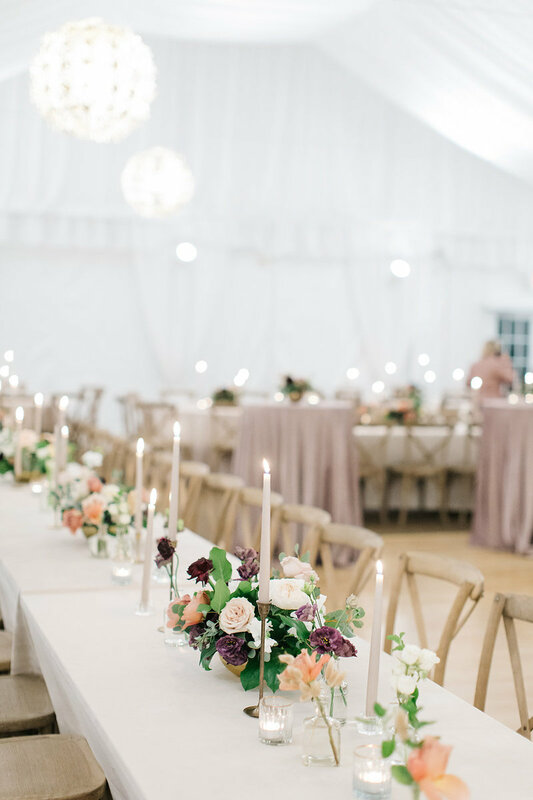 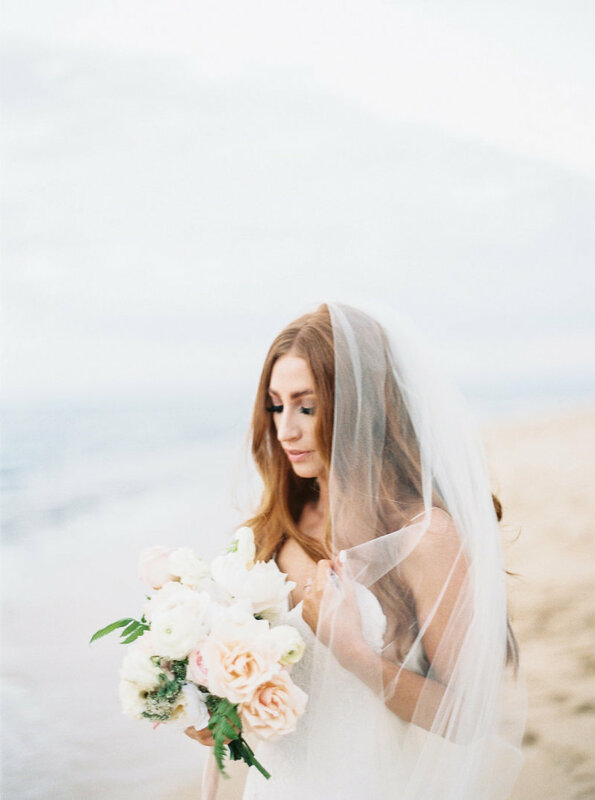 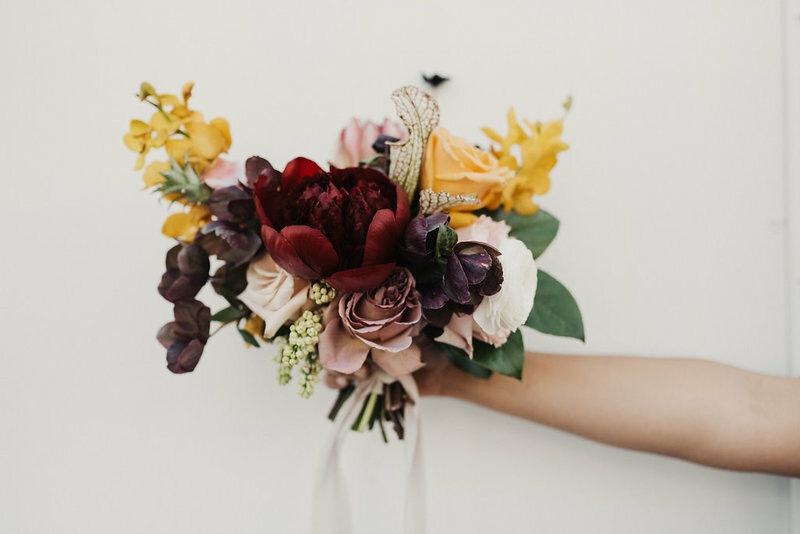 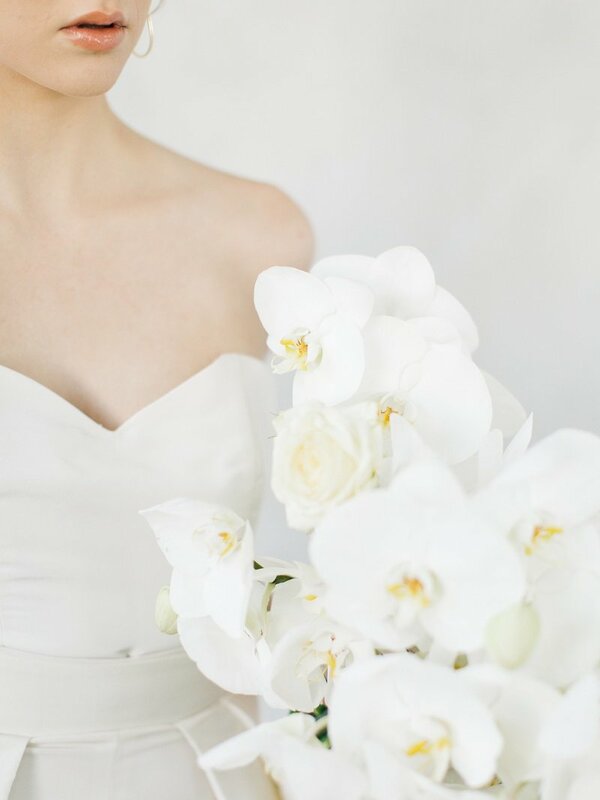 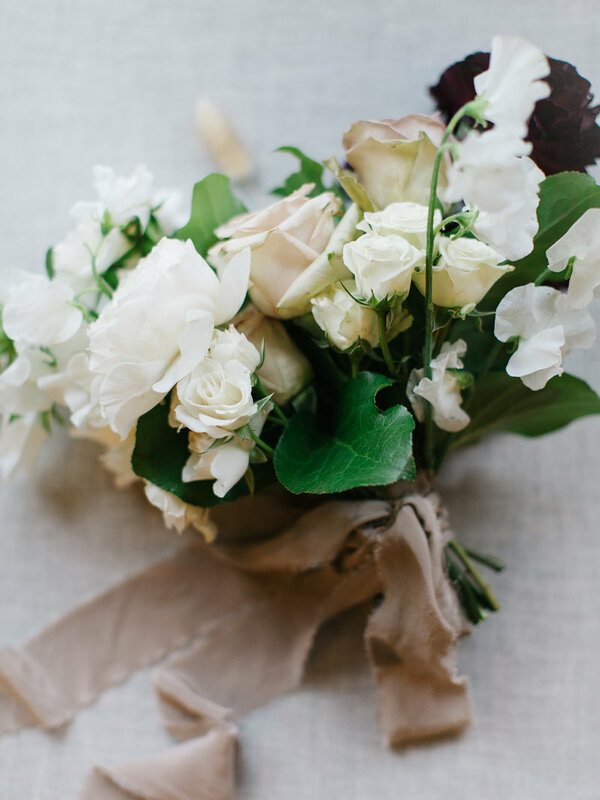 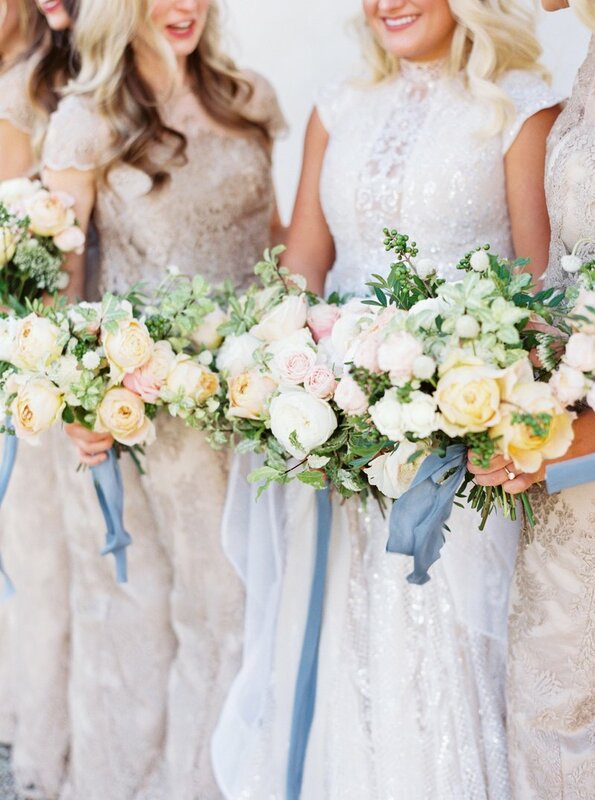 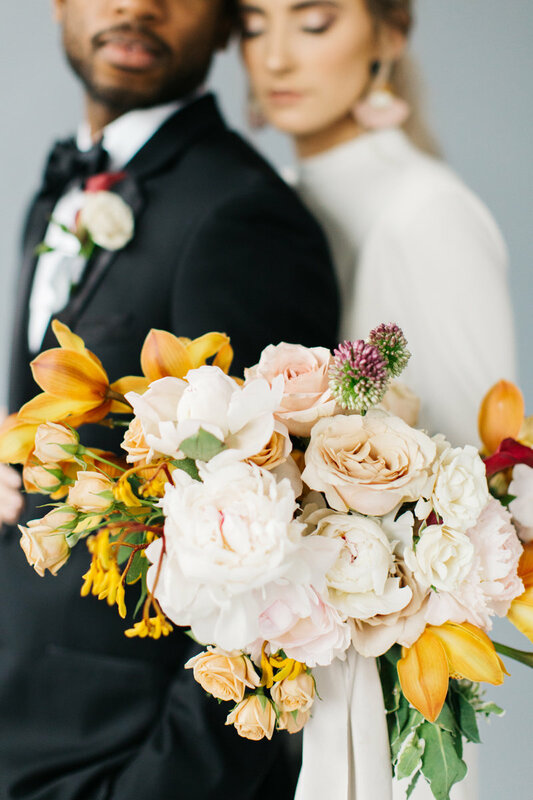 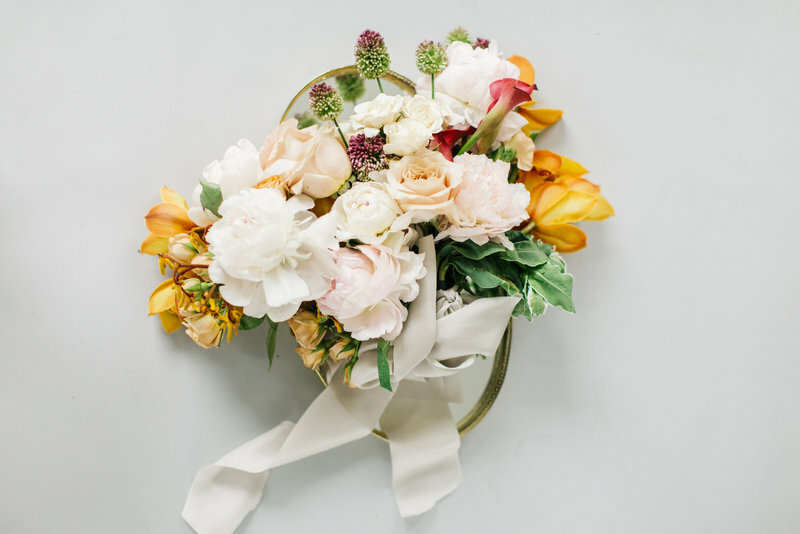 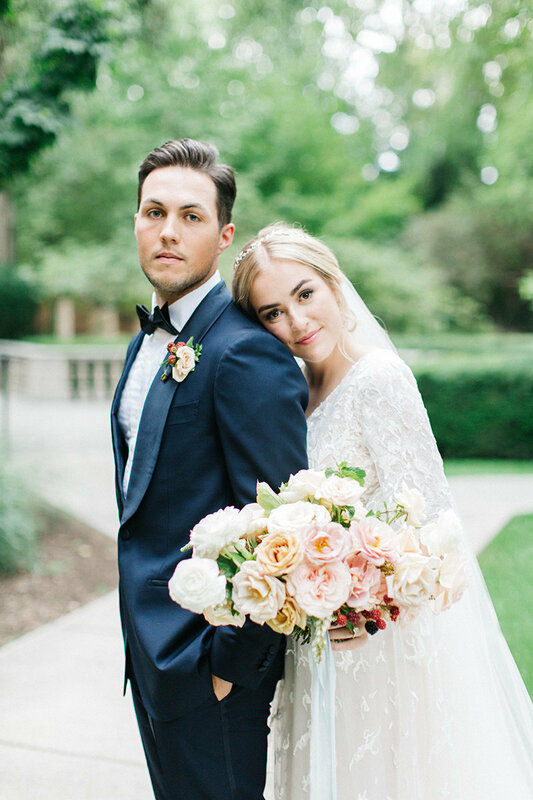 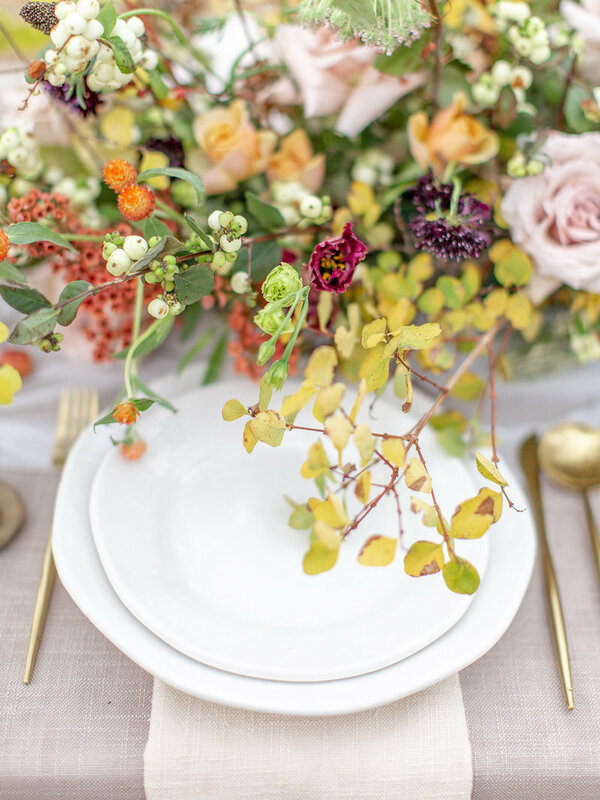 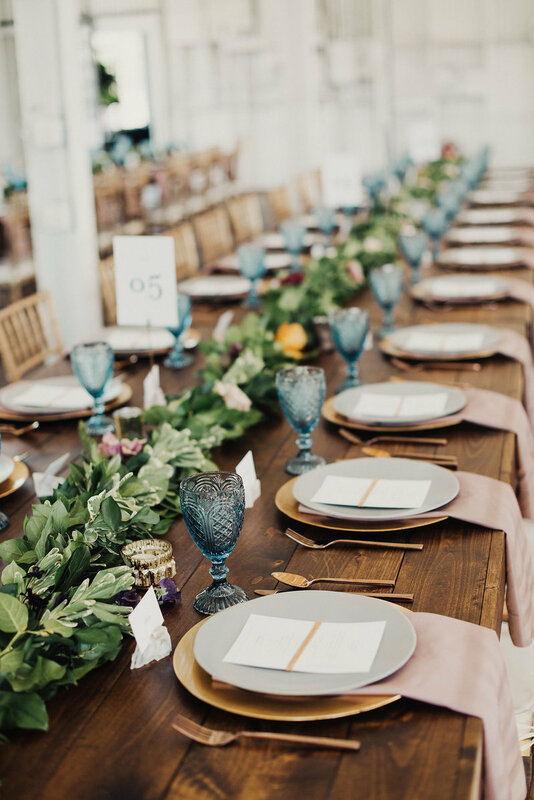 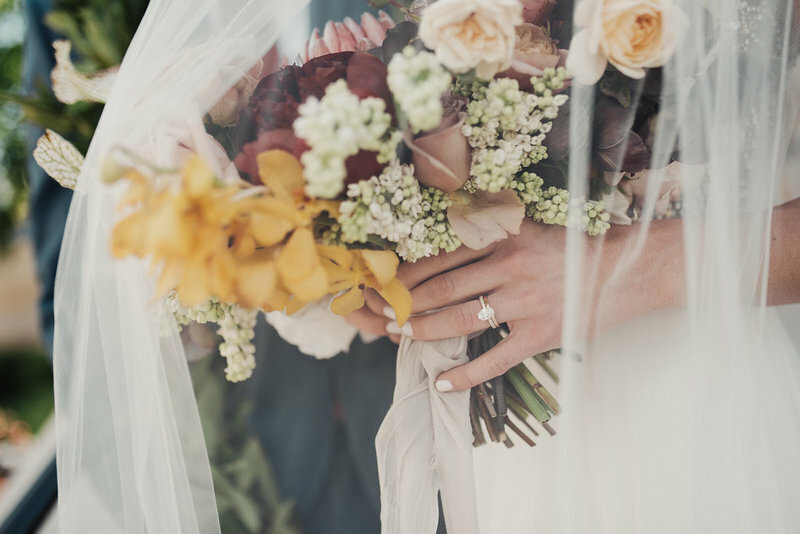 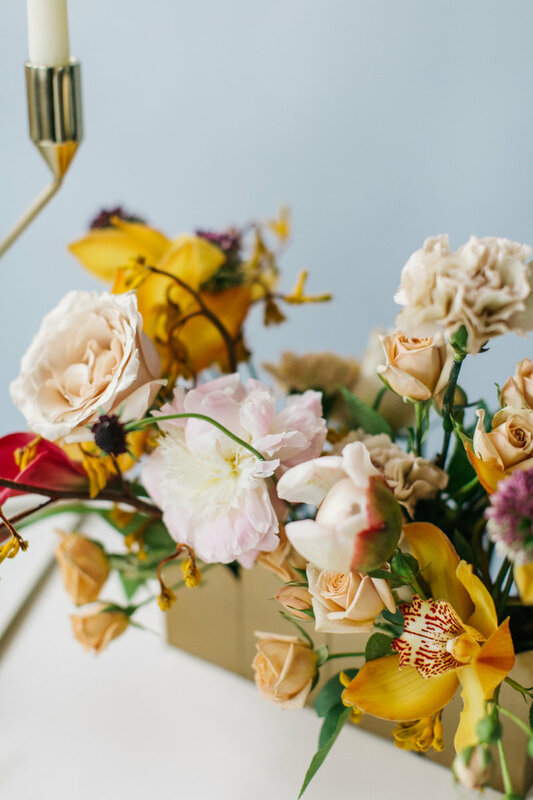 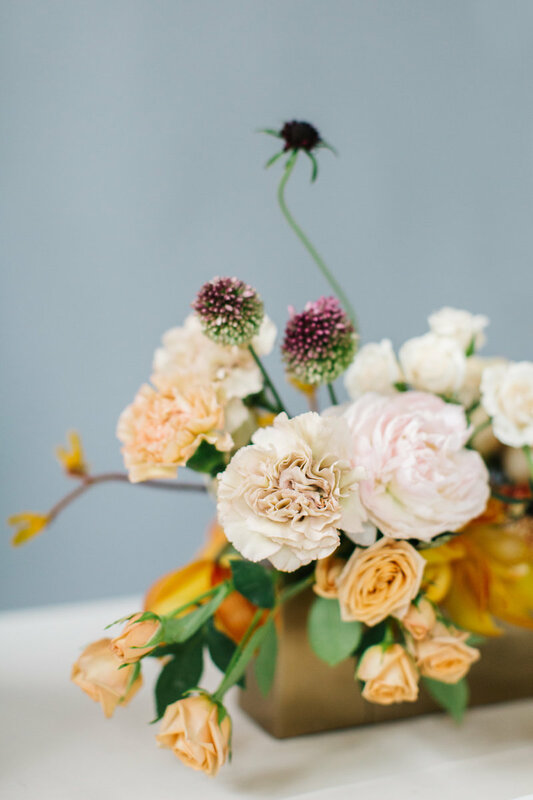 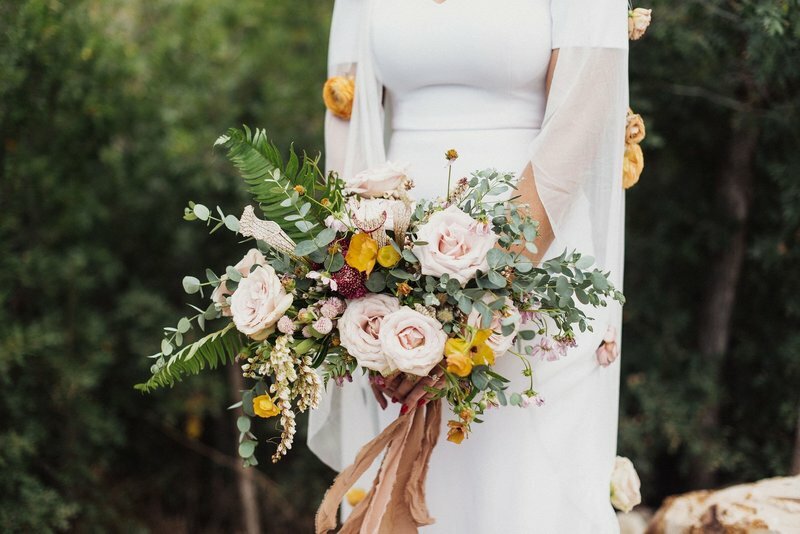 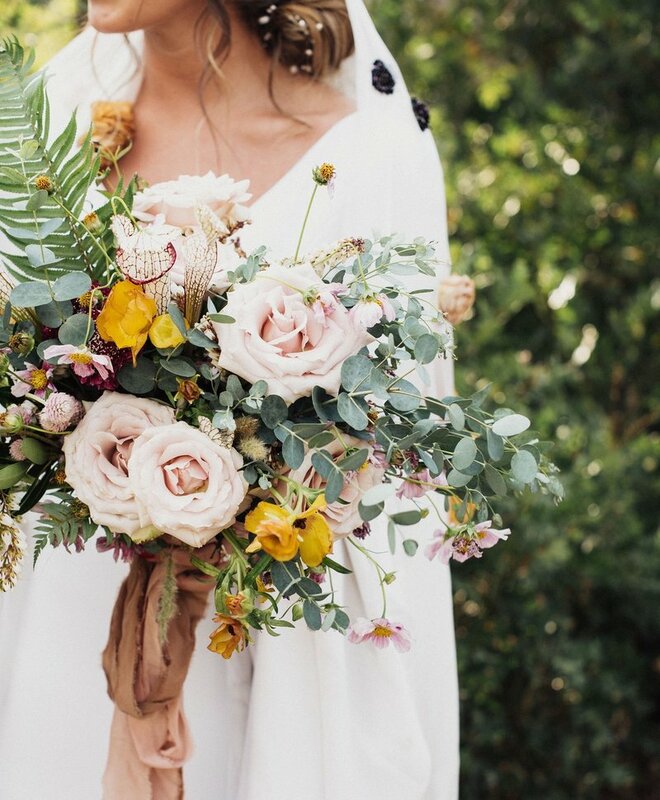 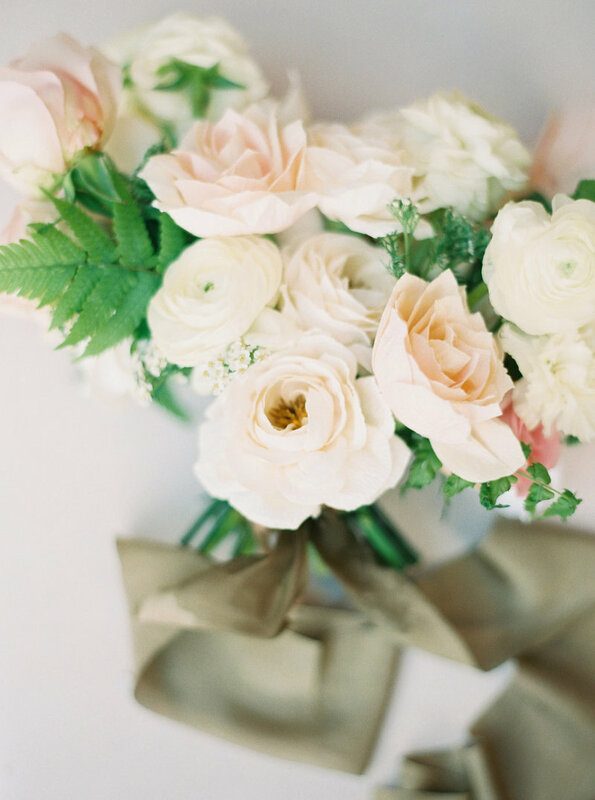 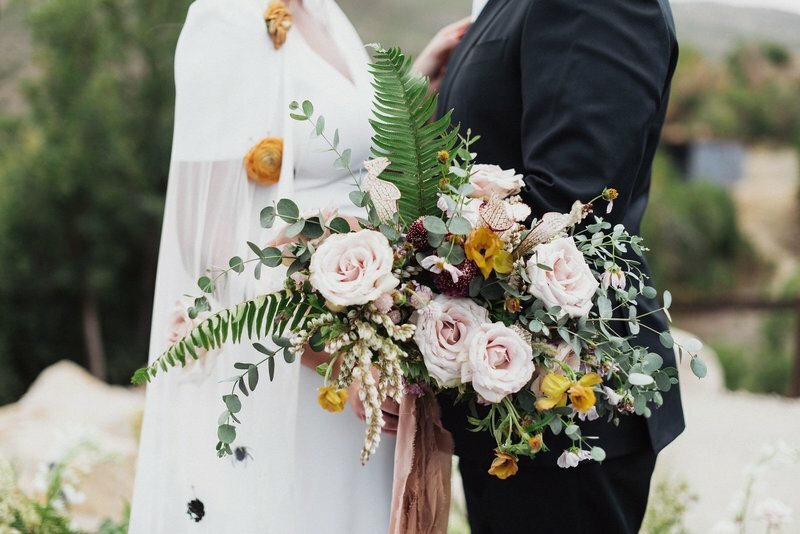 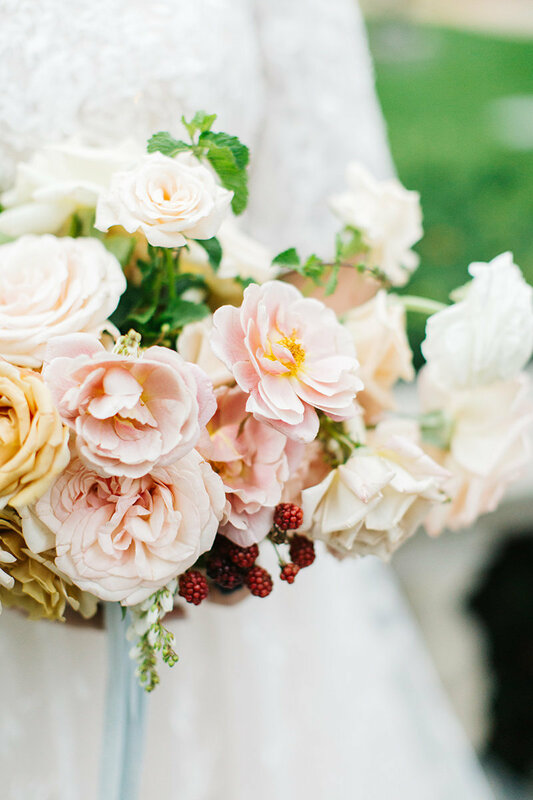 Cassidy requested a mix of romance and beach style achieved with classic and foraged blooms and a refined yet feminine color palette. 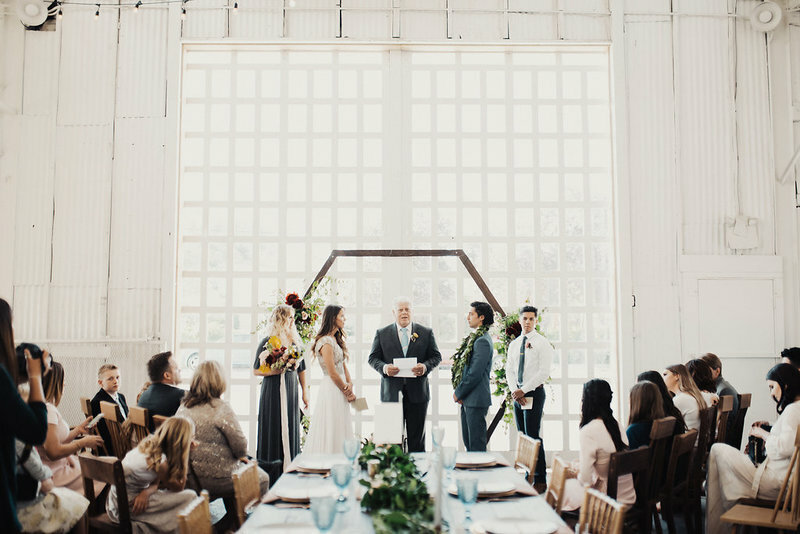 This couple wanted to celebrate the groom’s unique Maori culture with nods to his upbringing in New Zealand. 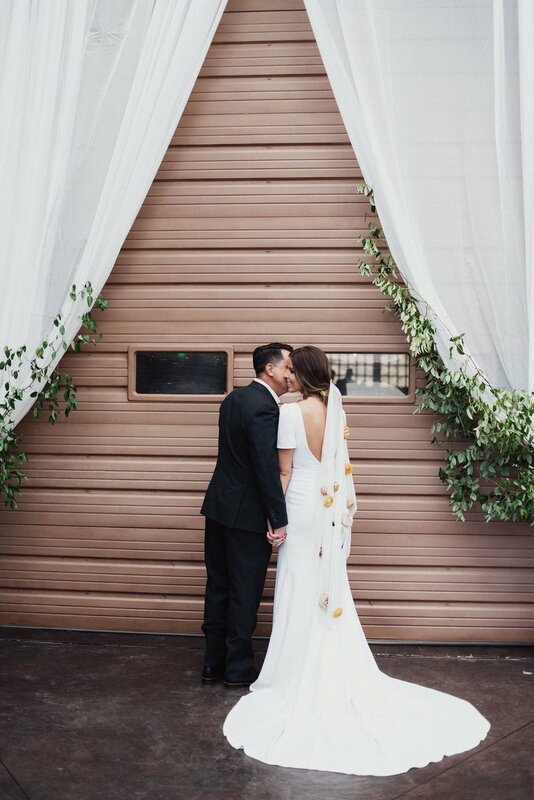 Pairing the brides signature boho style with tropical elements, we designed an event that was unique to their love. 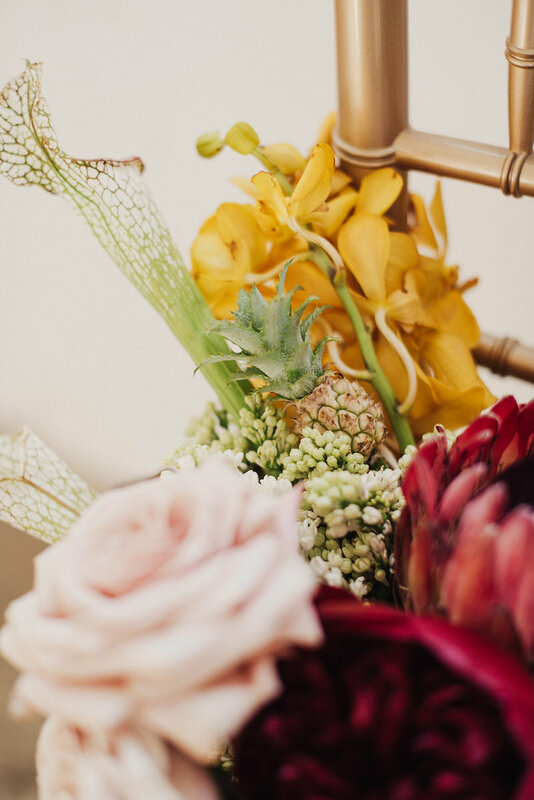 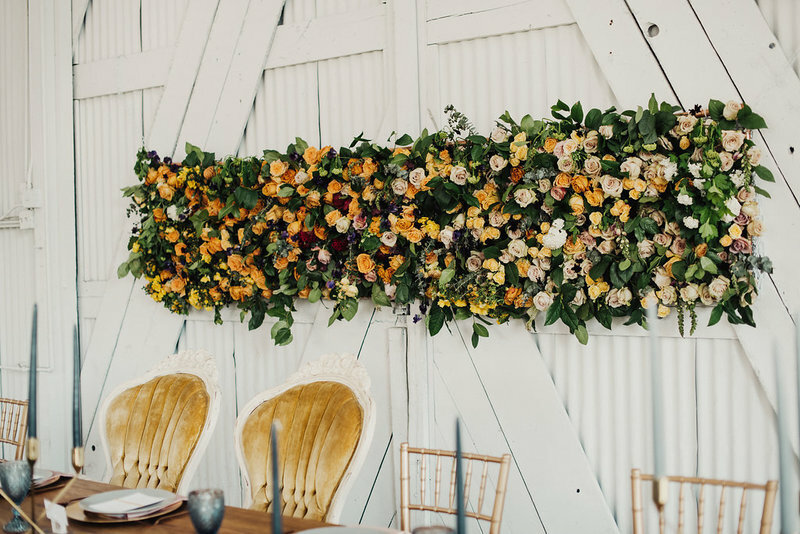 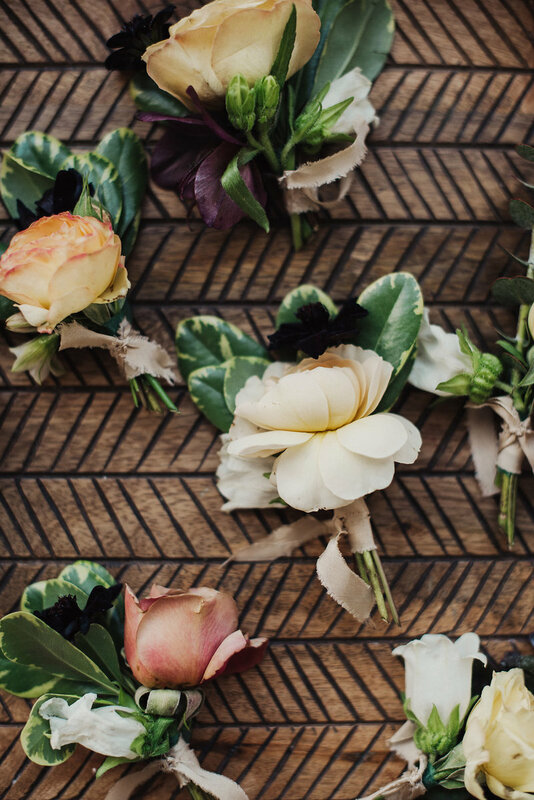 Some of our favorite details include the lush bouquets with tropical accents, the velvet ties, and the floral installation above the head table. 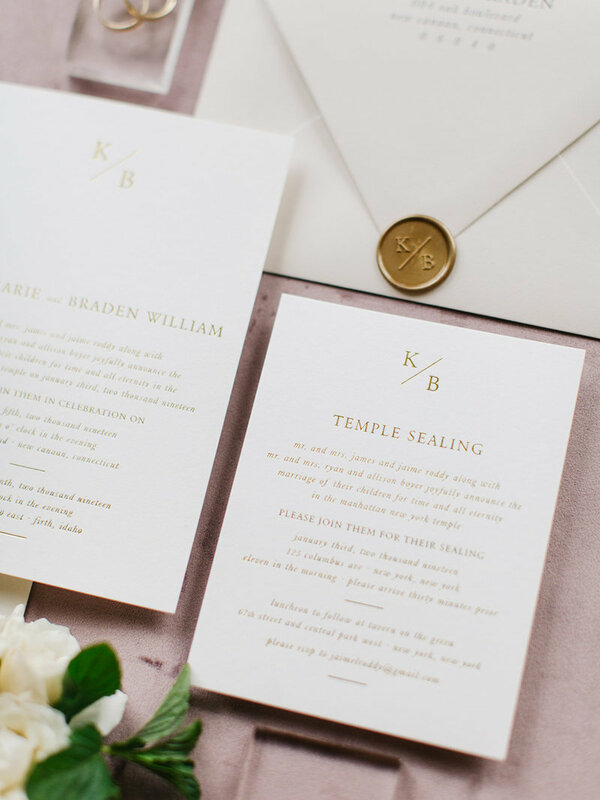 Chic minimalism paired with traditional elements make this design one of our favorites to date. 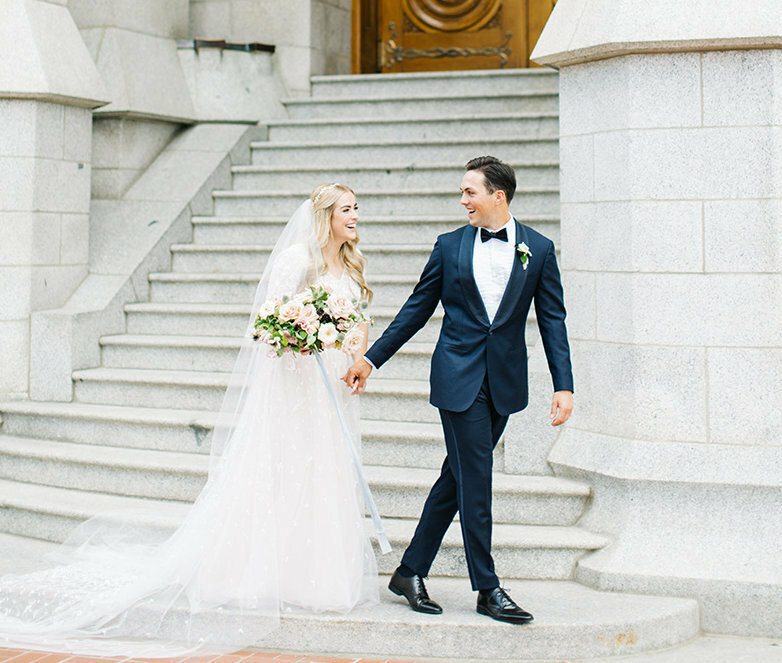 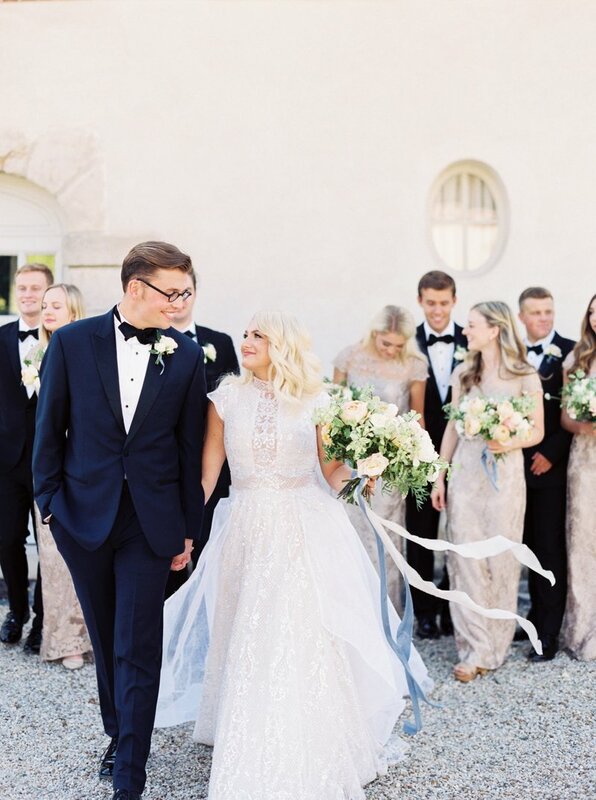 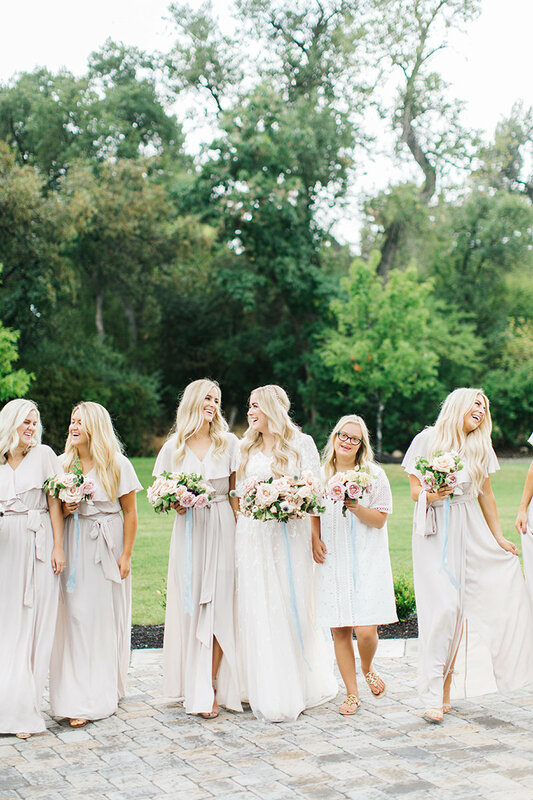 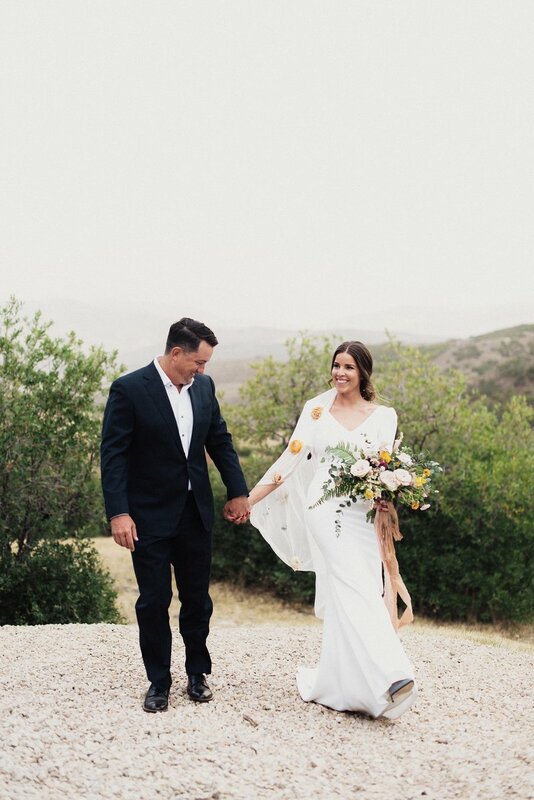 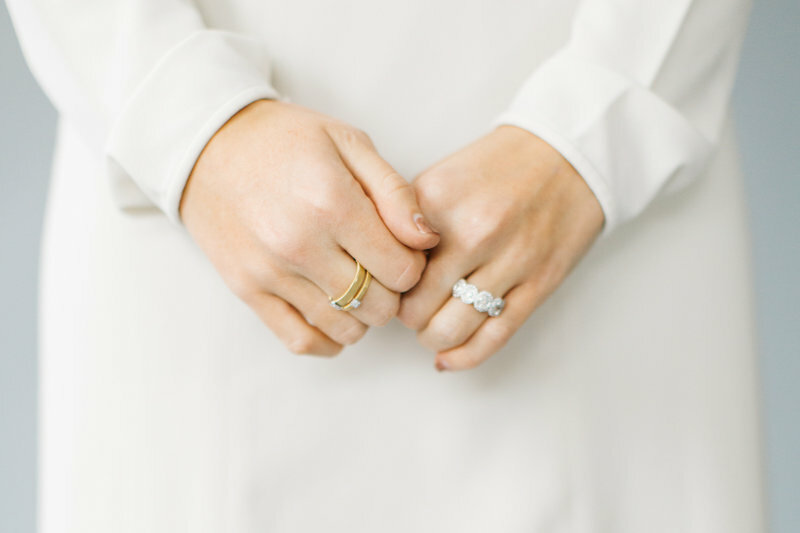 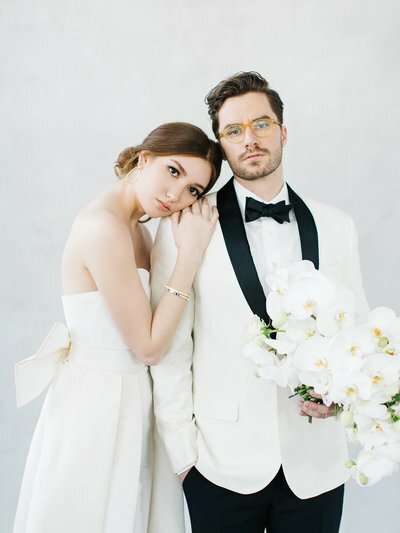 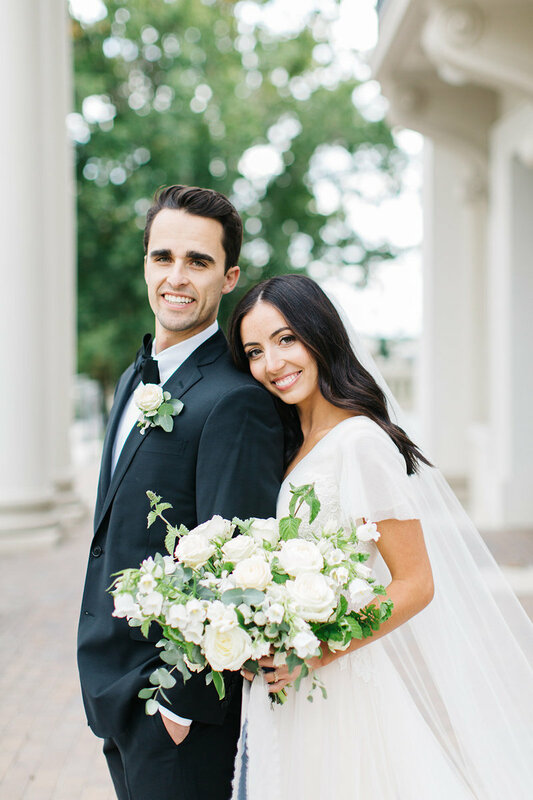 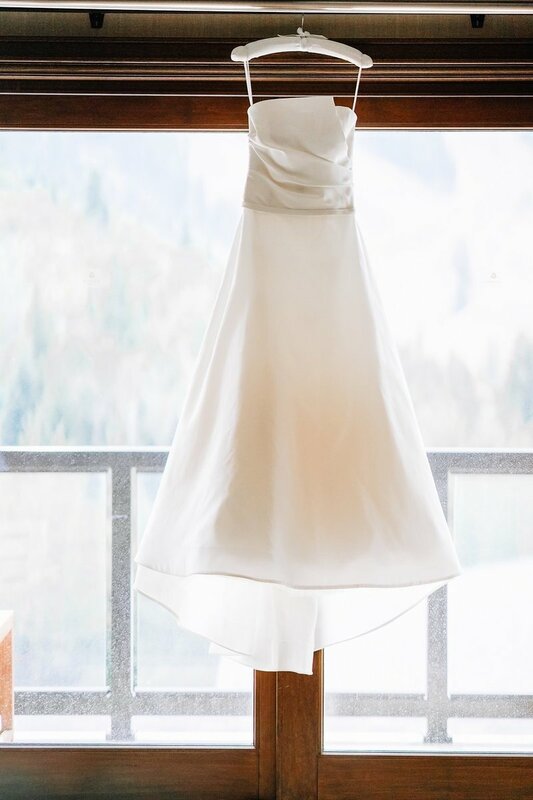 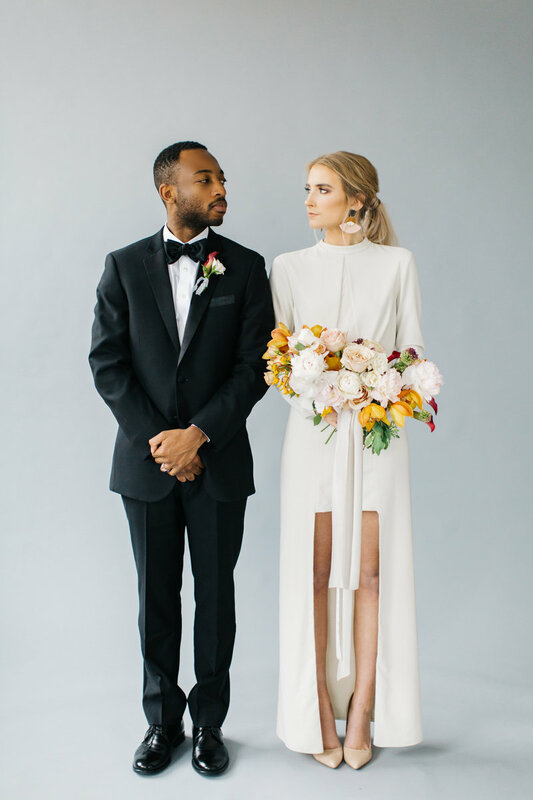 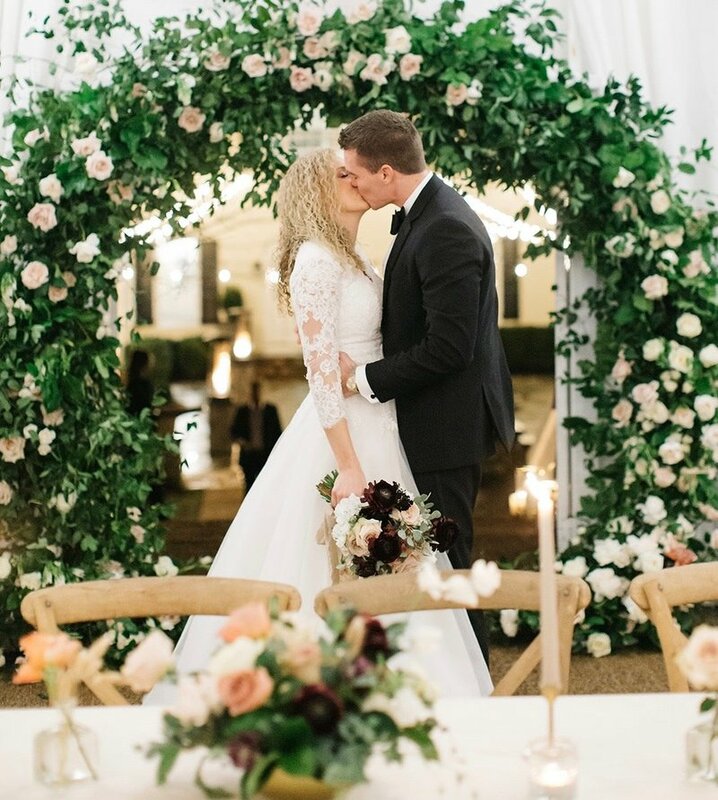 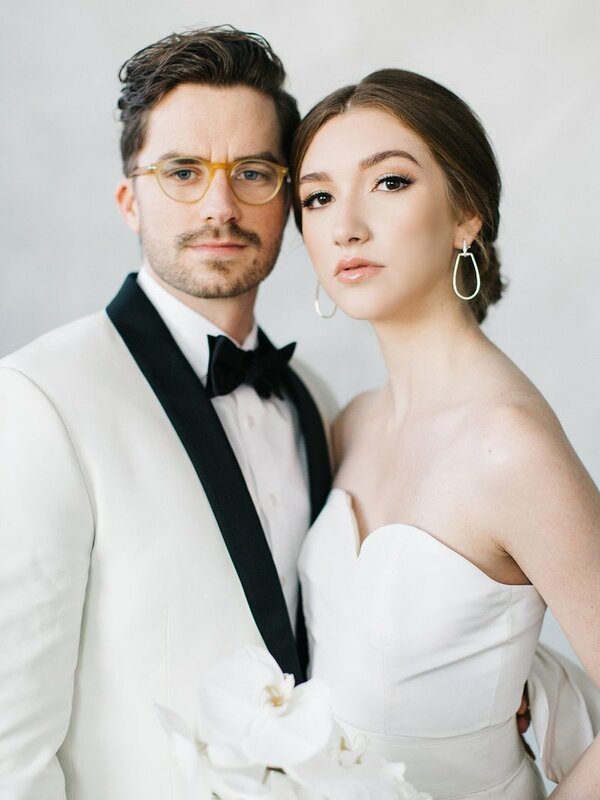 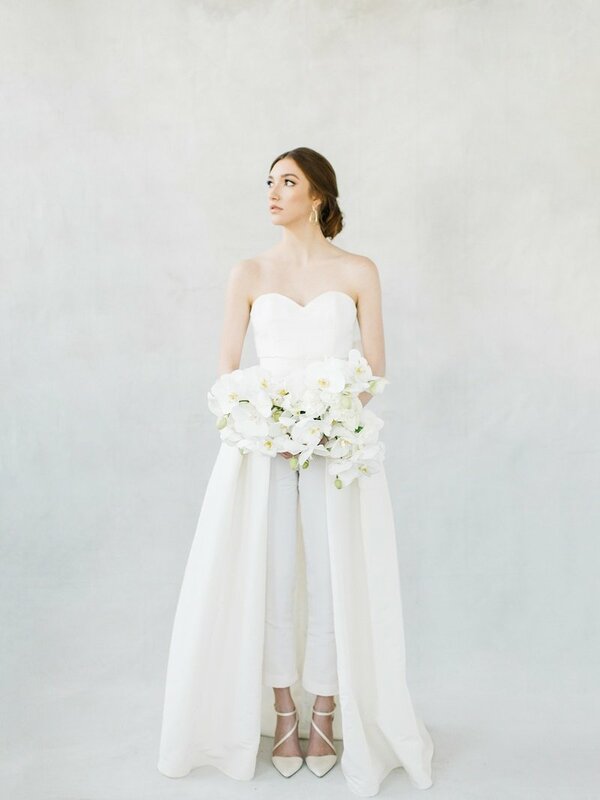 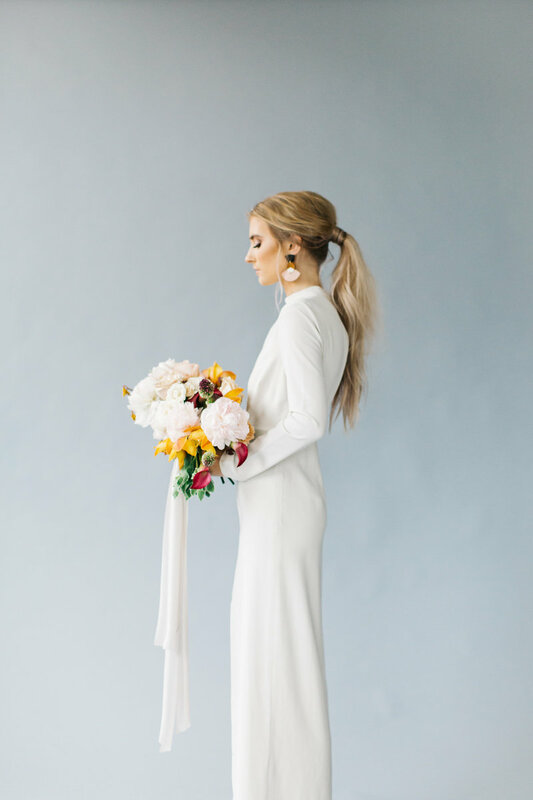 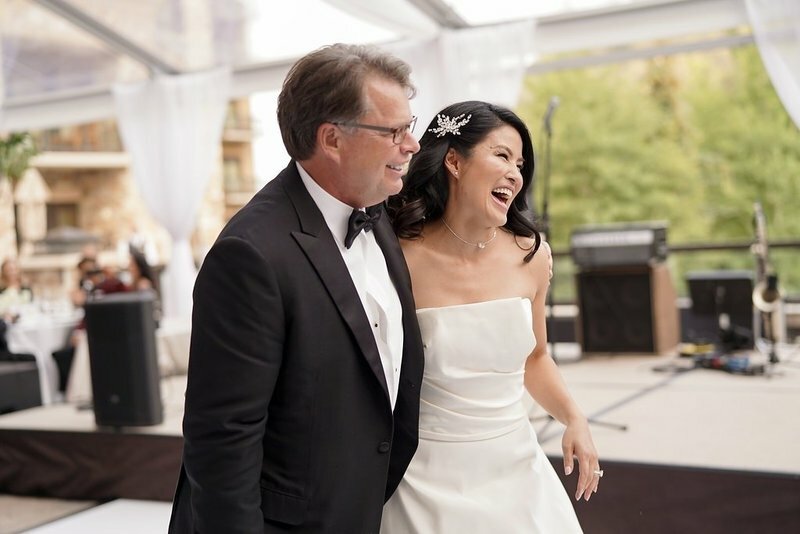 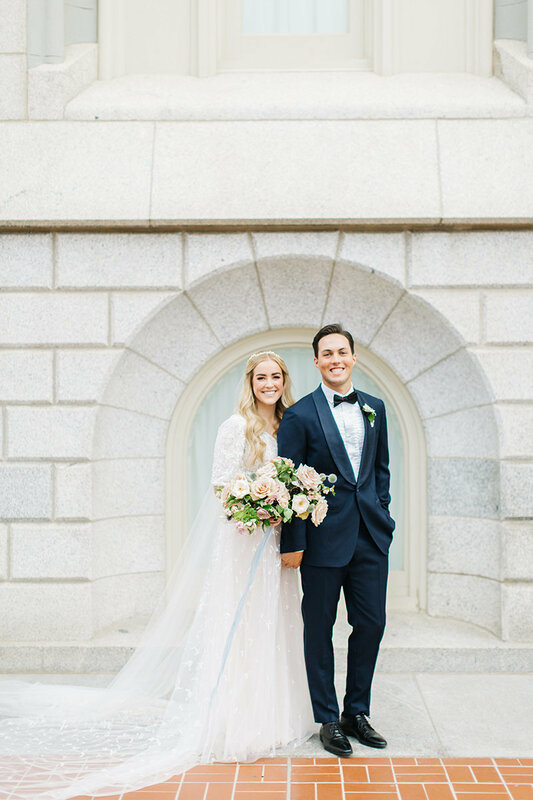 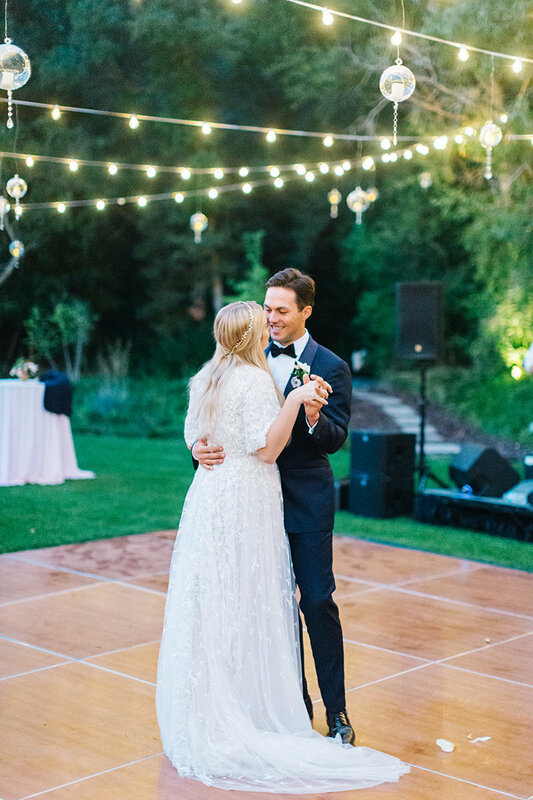 Our bride, Claire, took a fashion risk with her jumpsuit and matching overskirt for a fashion forward look perfectly paired with her groom’s white tuxedo. 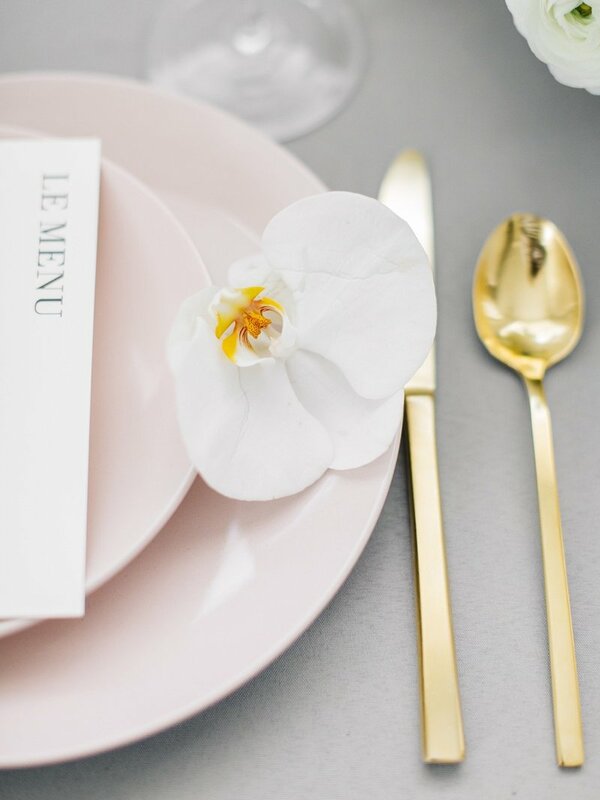 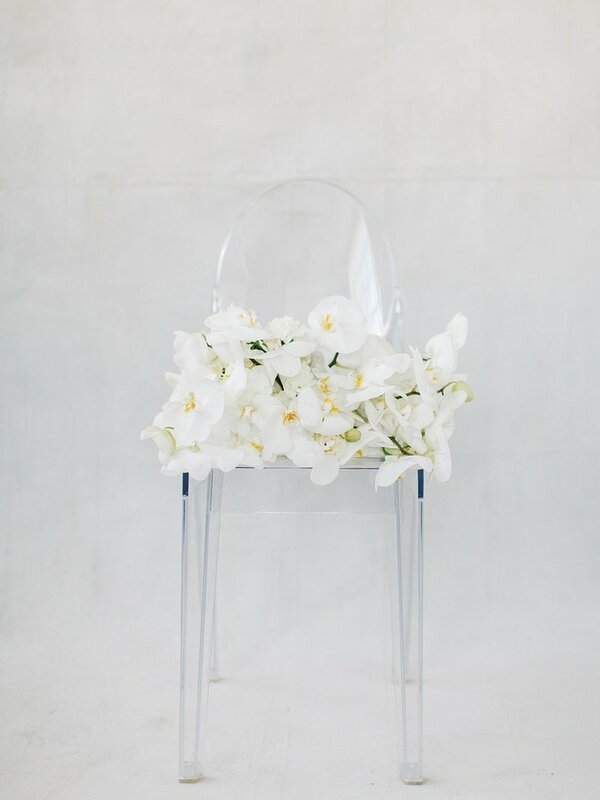 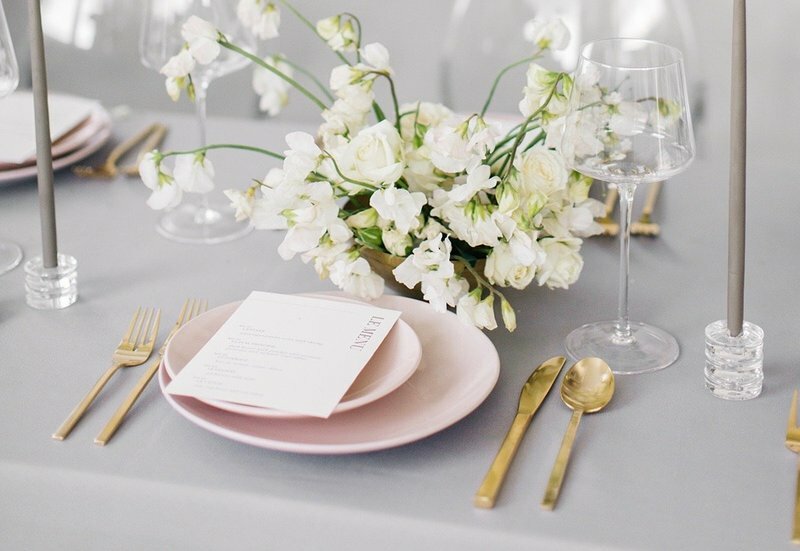 The details were modern yet maintained a feminine edge with cascading orchids, soft pink details, and a floral installation. 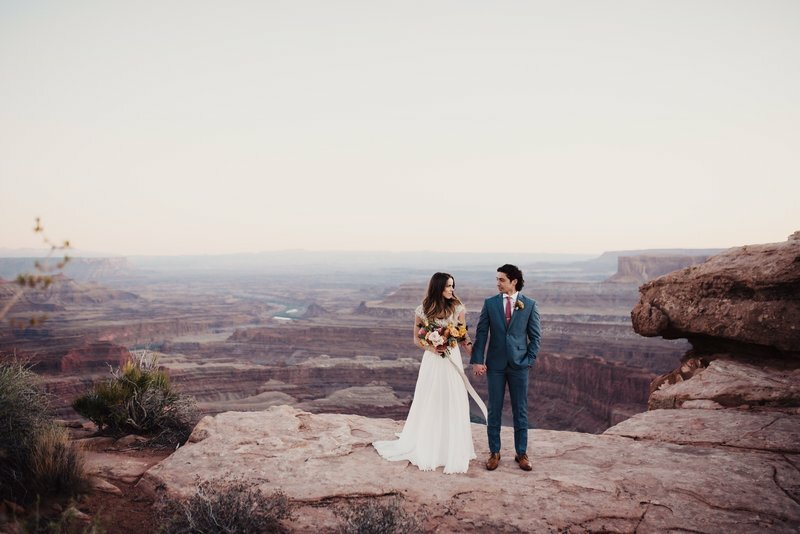 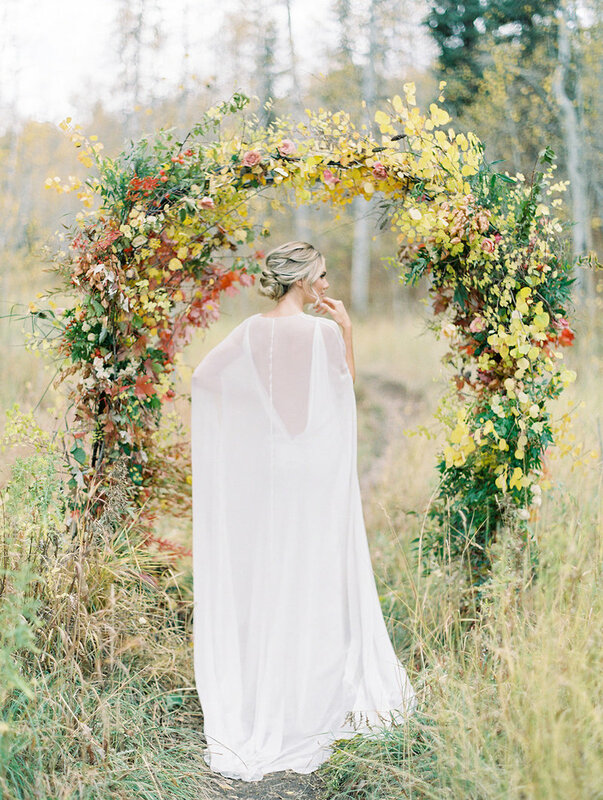 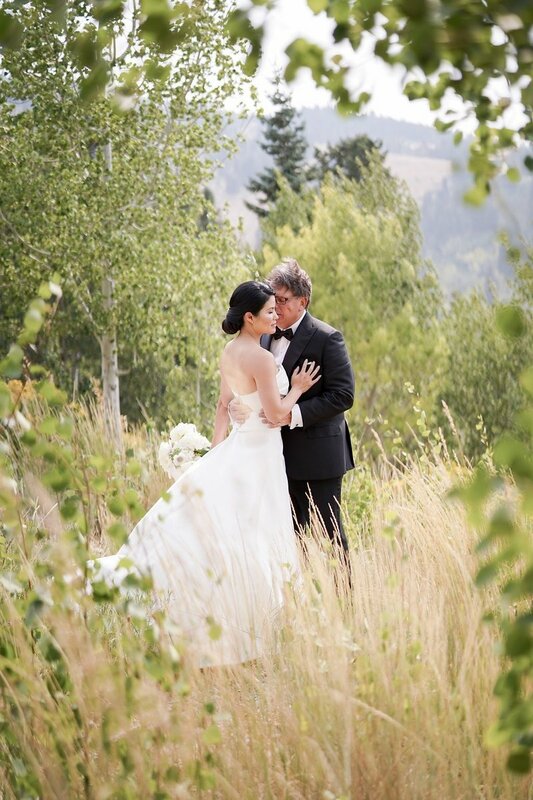 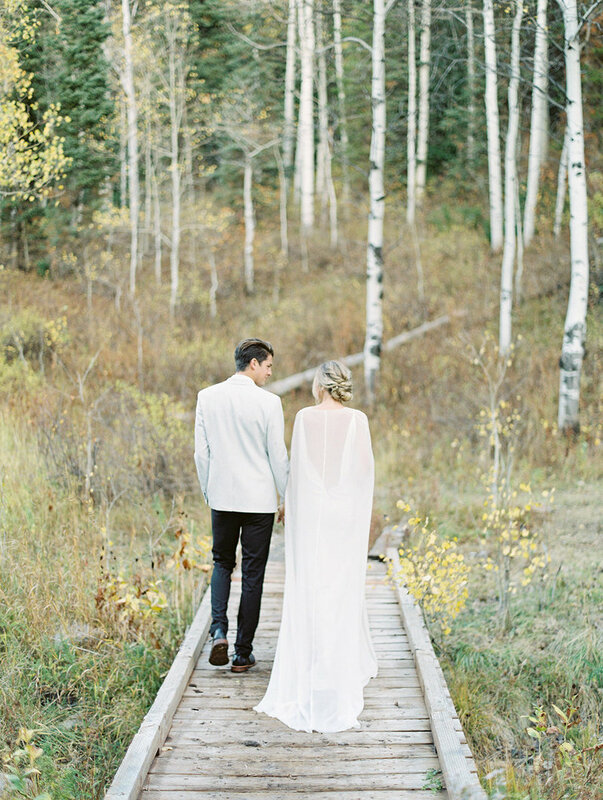 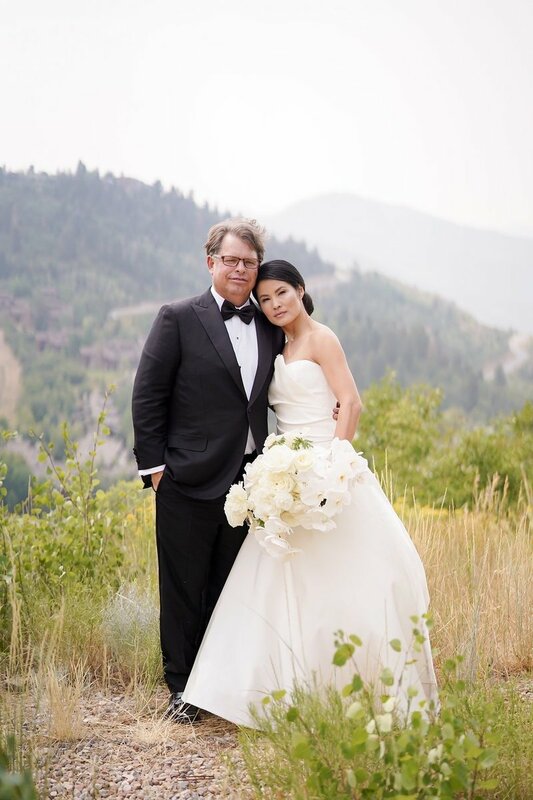 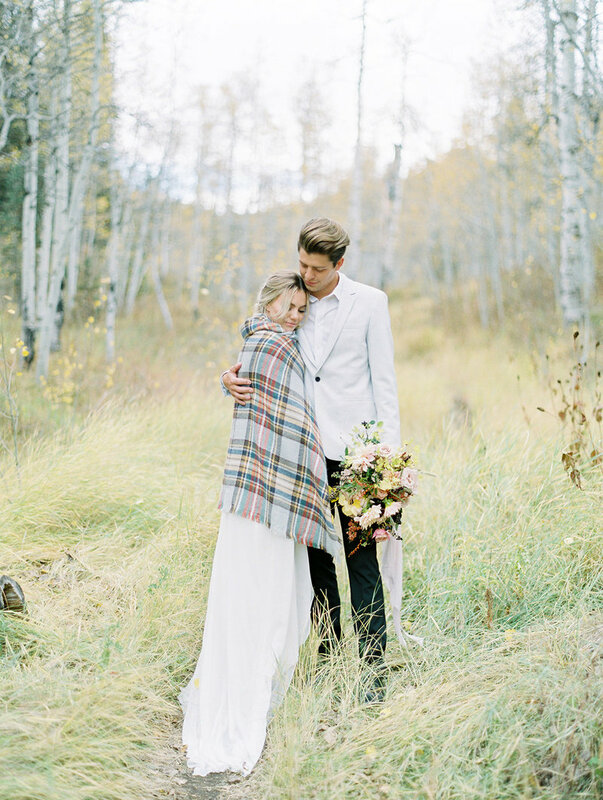 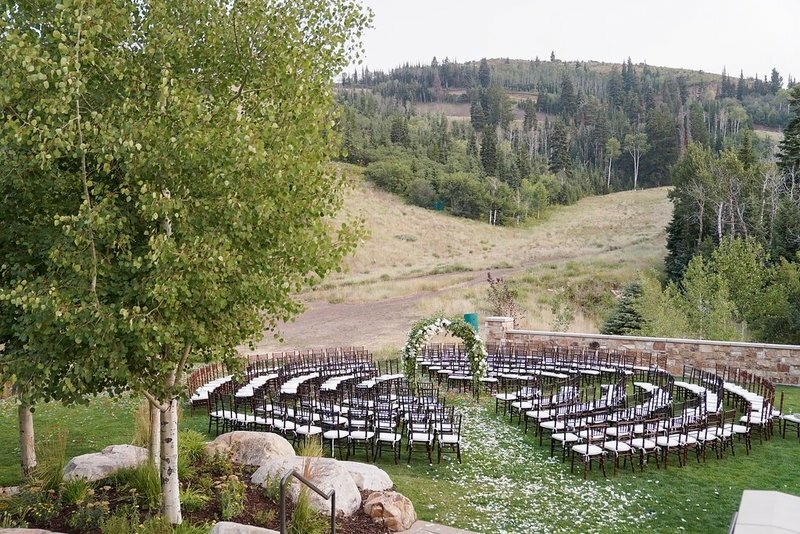 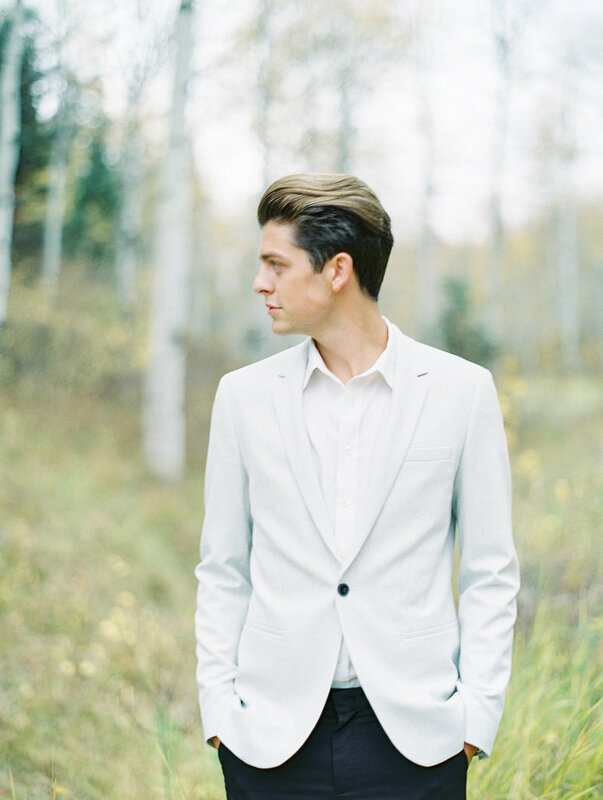 This couple took advantage of their gorgeous state, marrying in a historic horse riding arena in Park City, Utah. 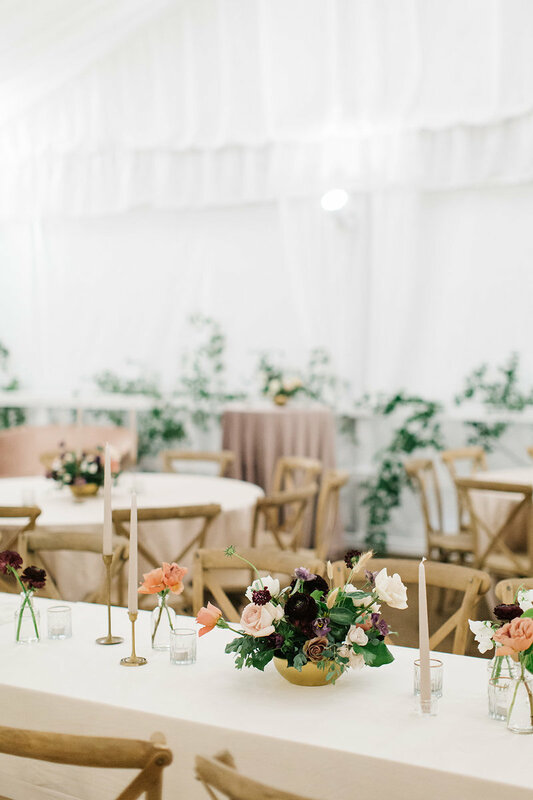 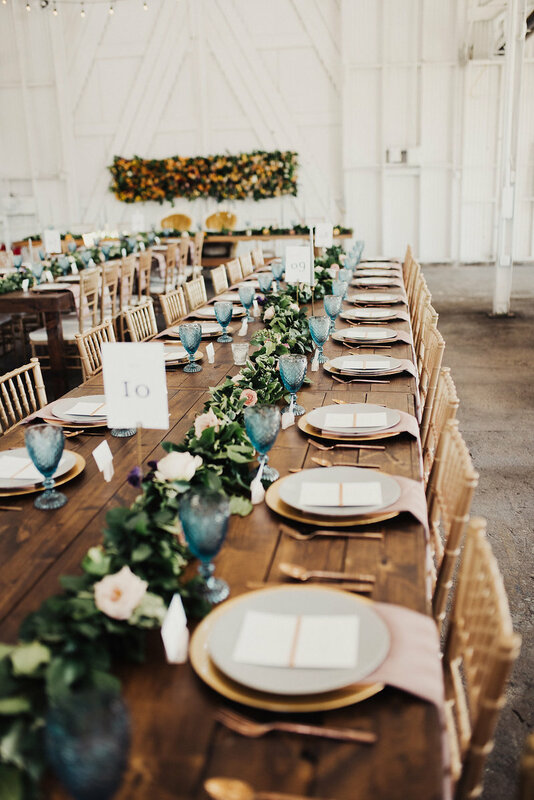 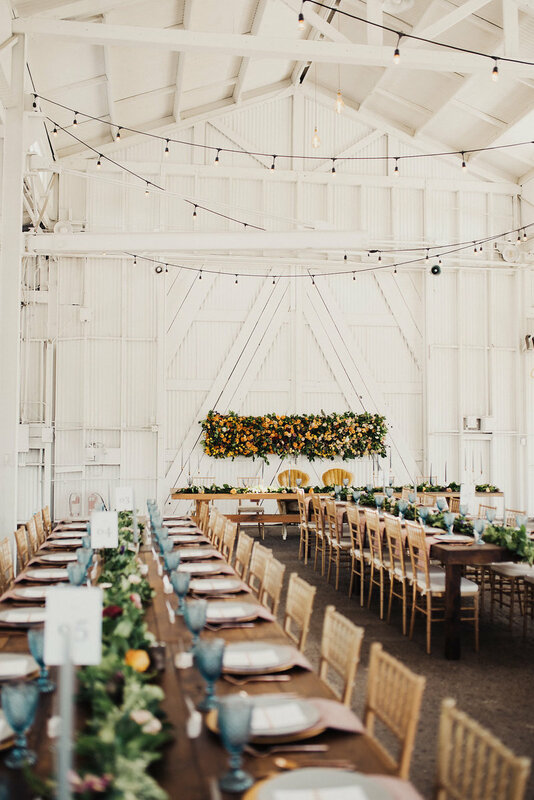 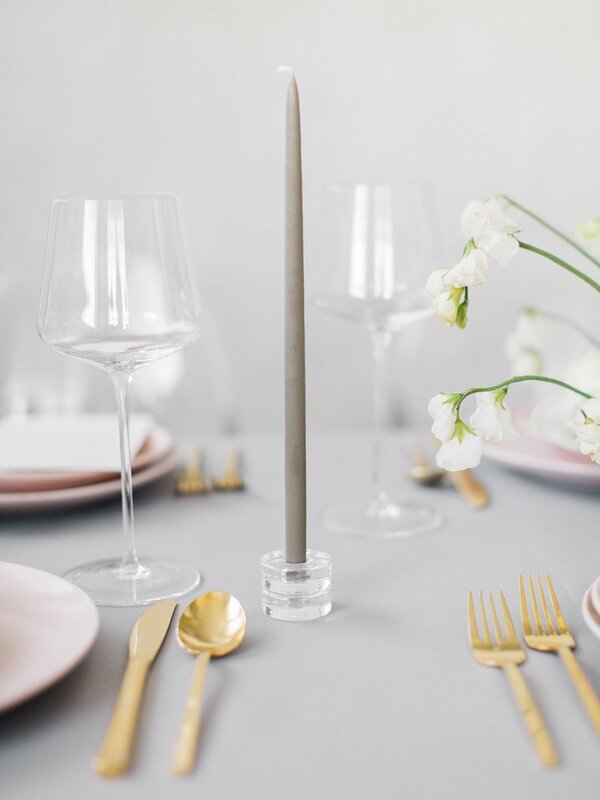 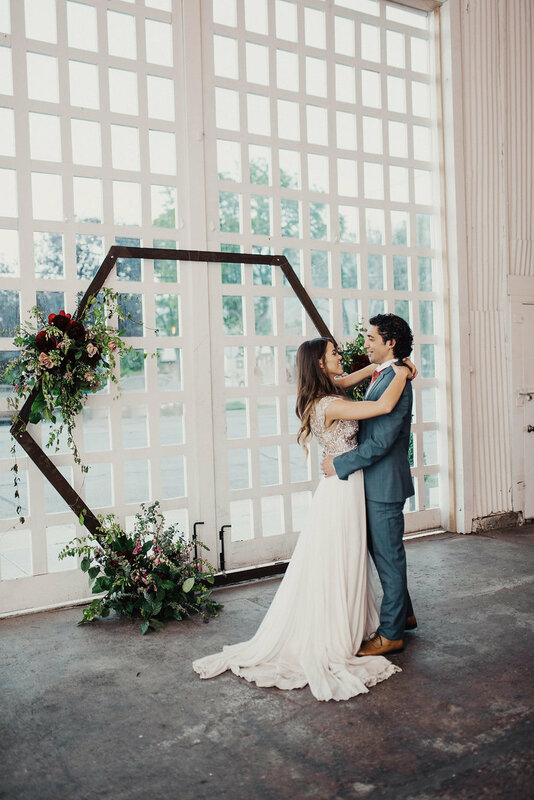 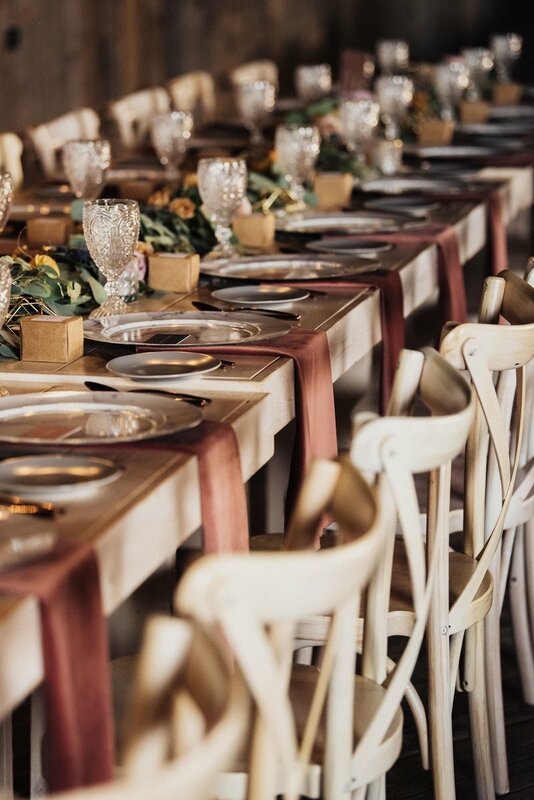 Using industrial modern elements such as the marble chargers, geometric candles and mod color palette, we created a look that put a spin on the rustic feel of the venue. 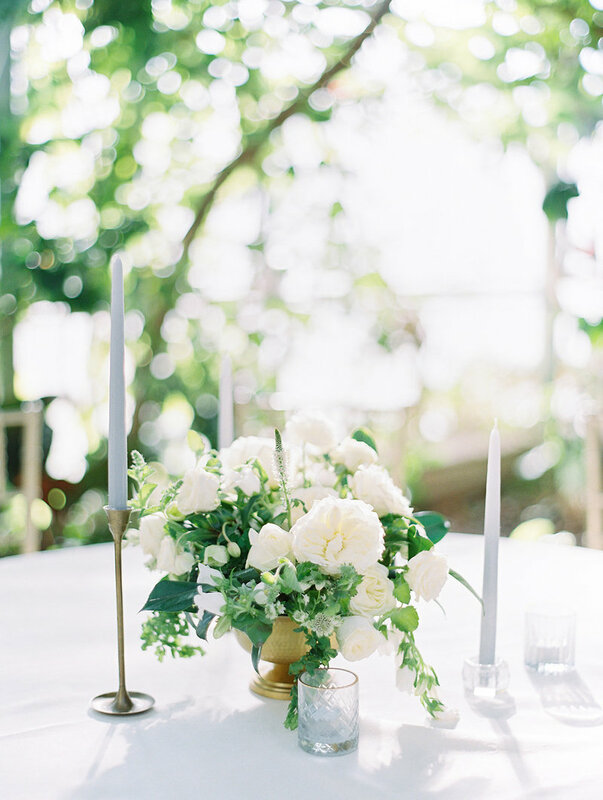 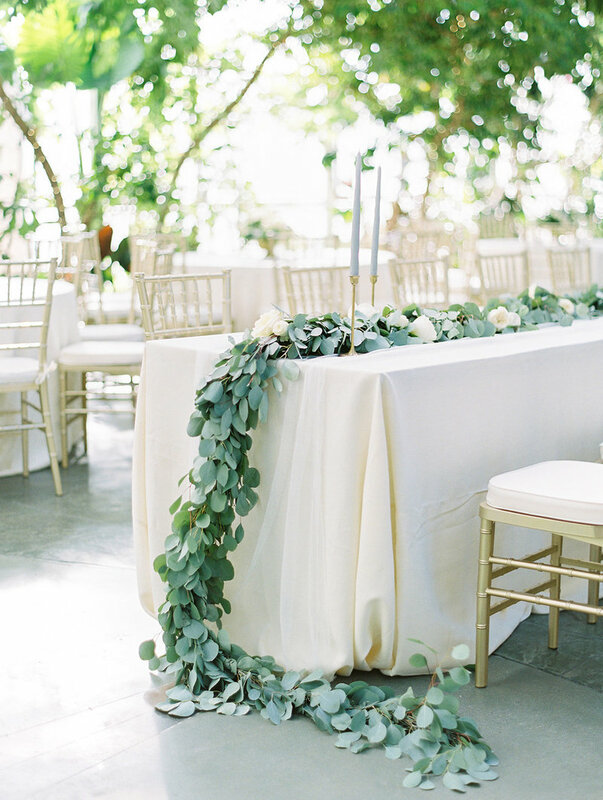 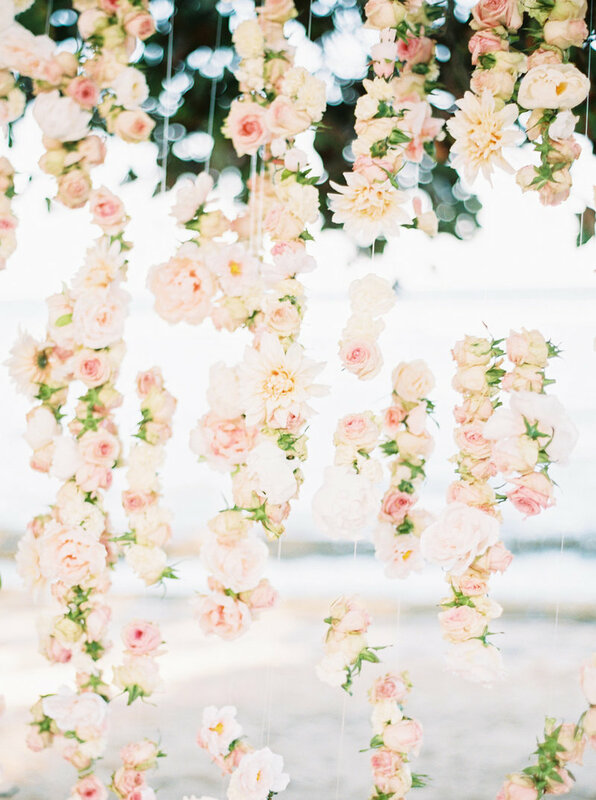 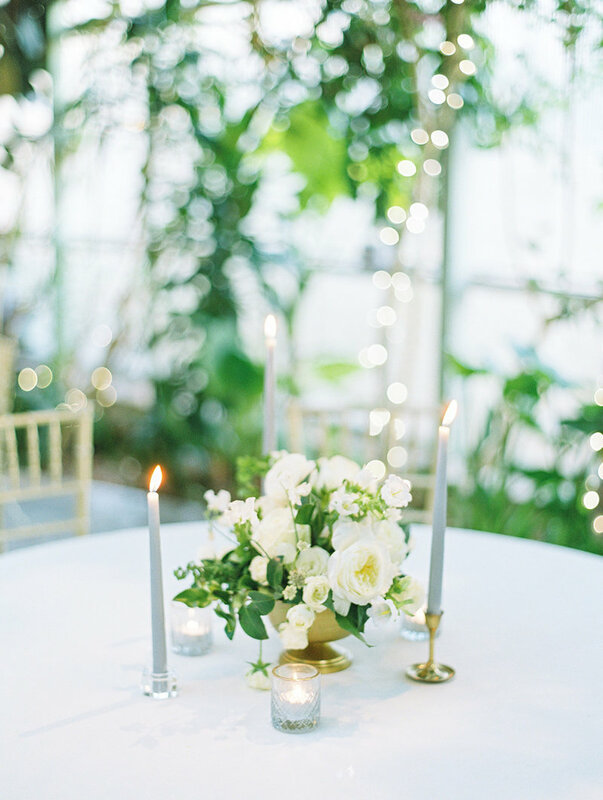 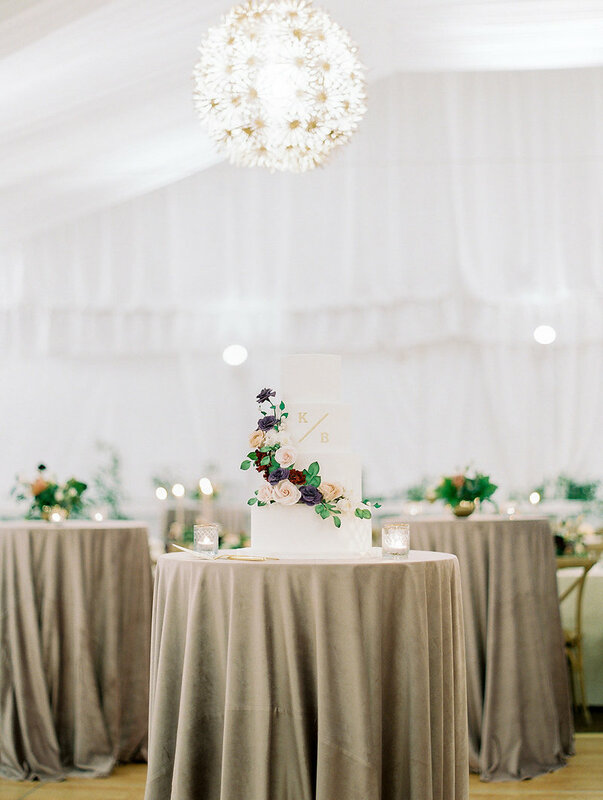 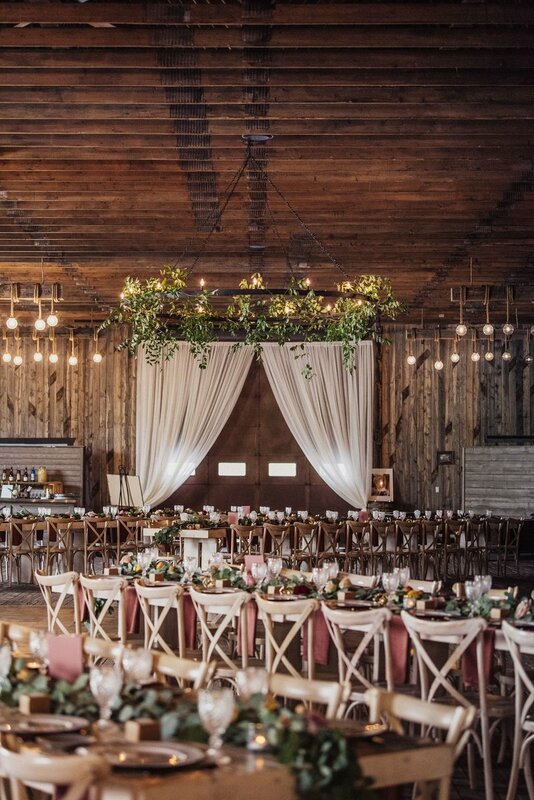 A greenery chandelier, half-moon floral piece, and rose velvet linens gave the look an added feminine feel. 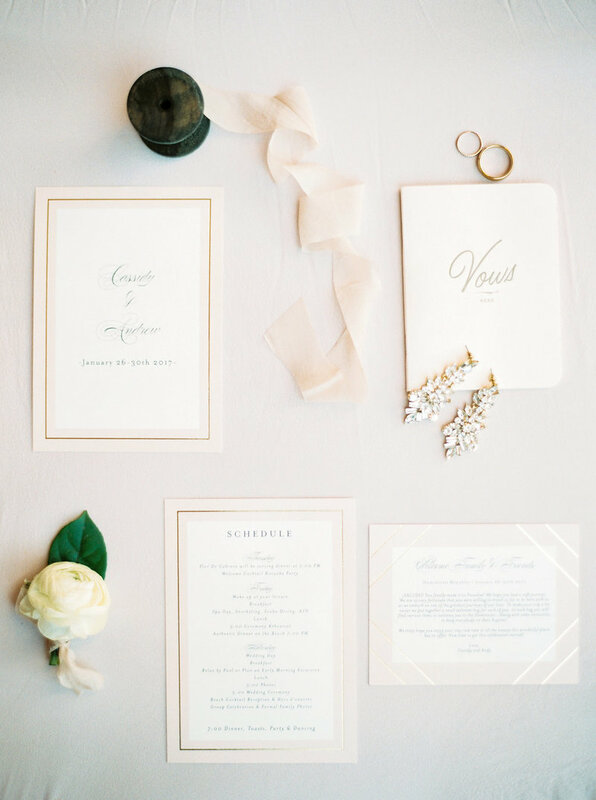 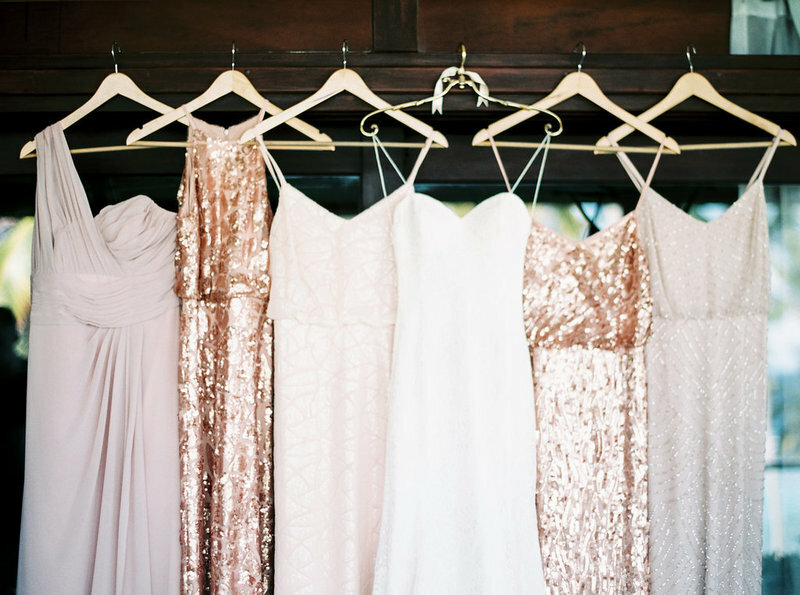 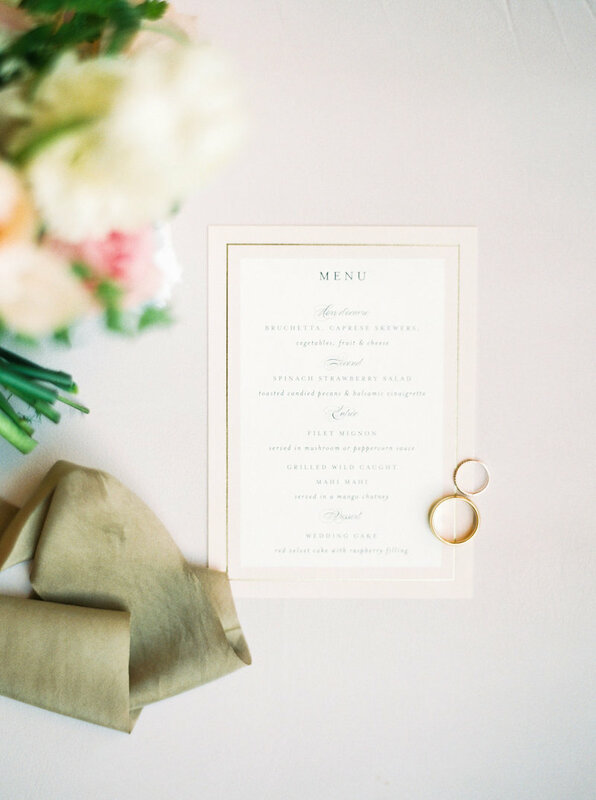 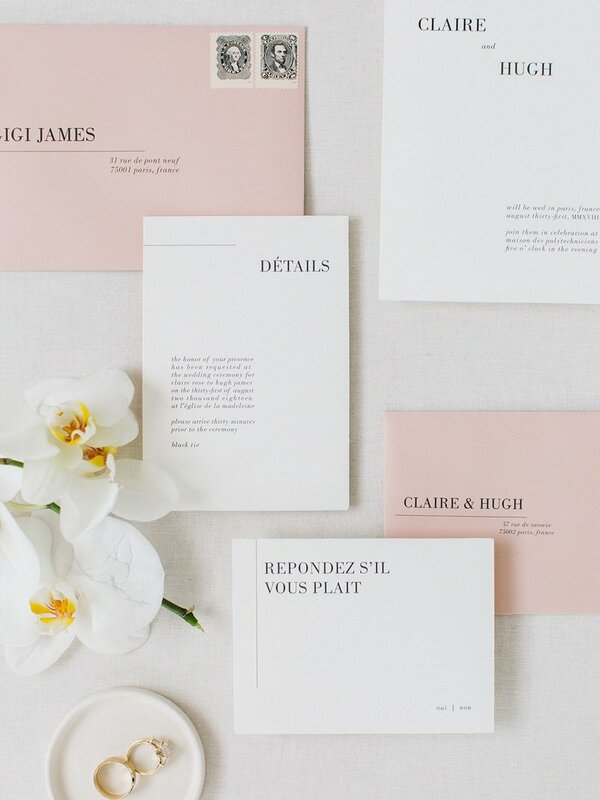 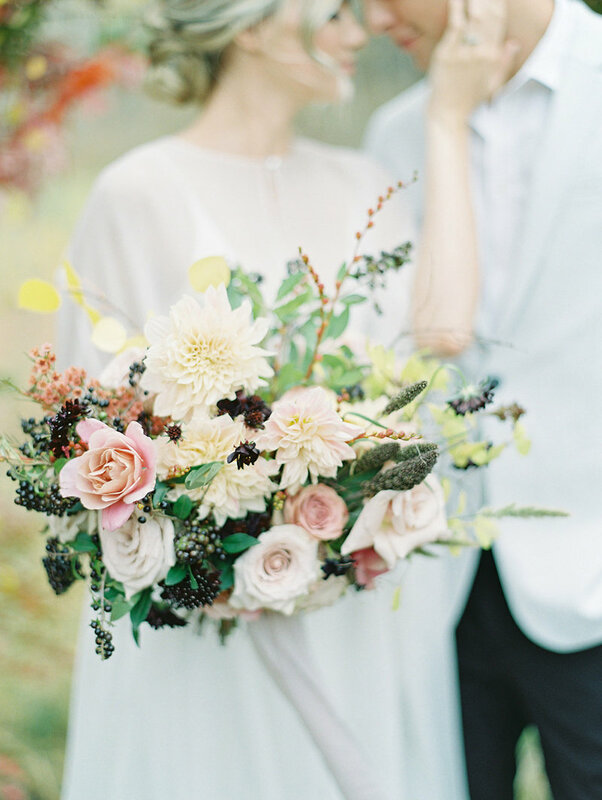 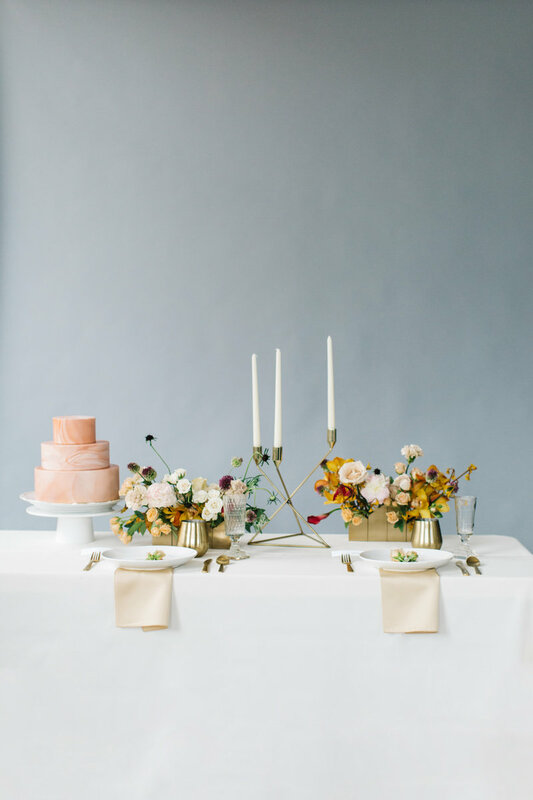 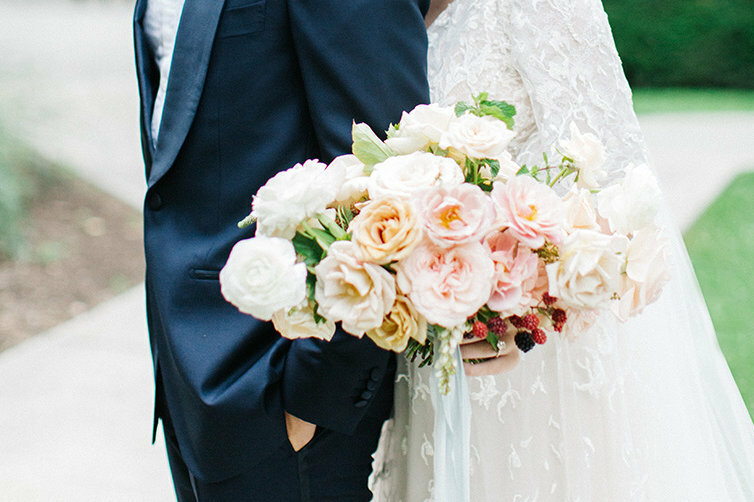 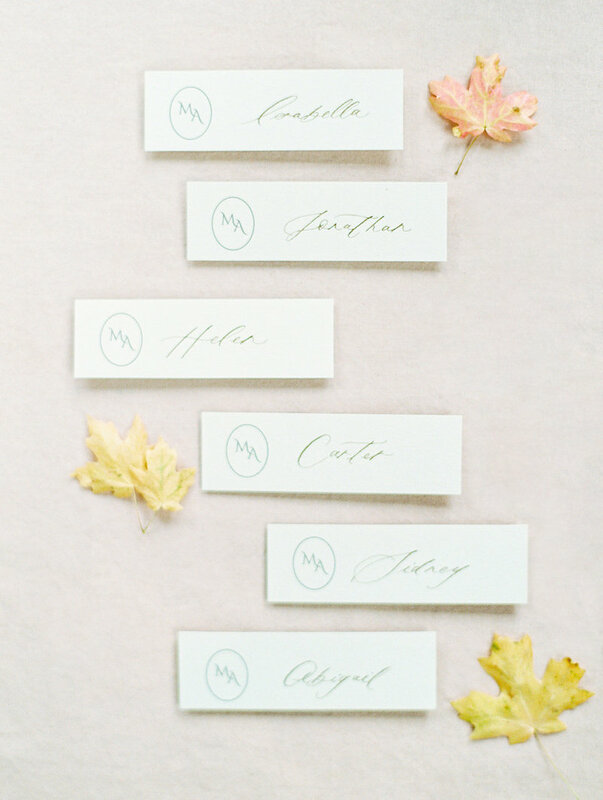 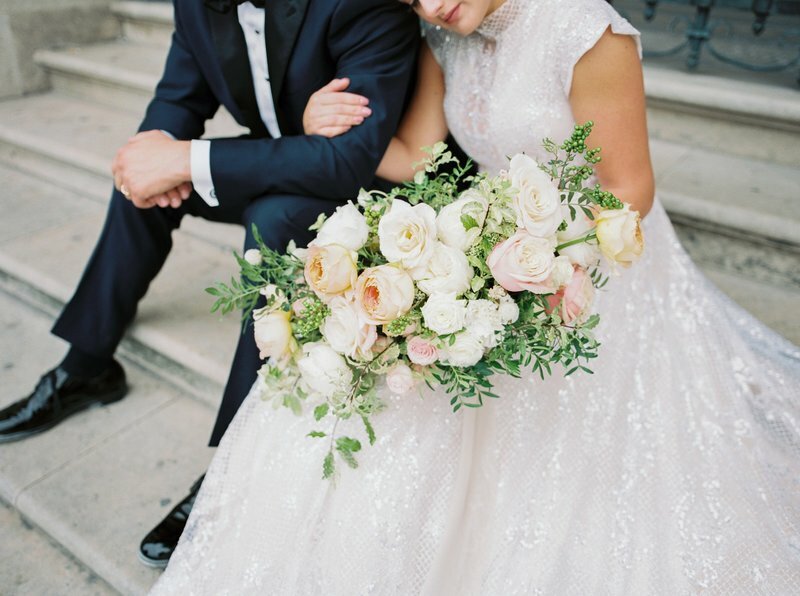 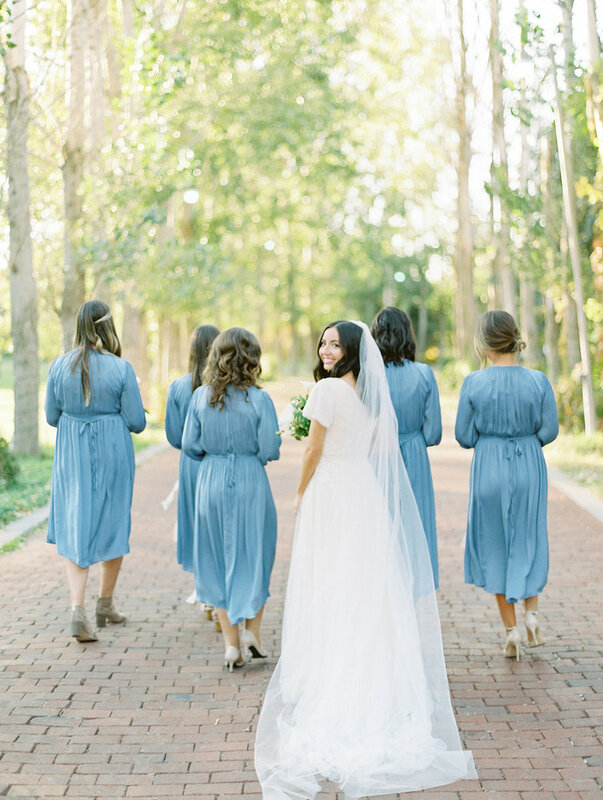 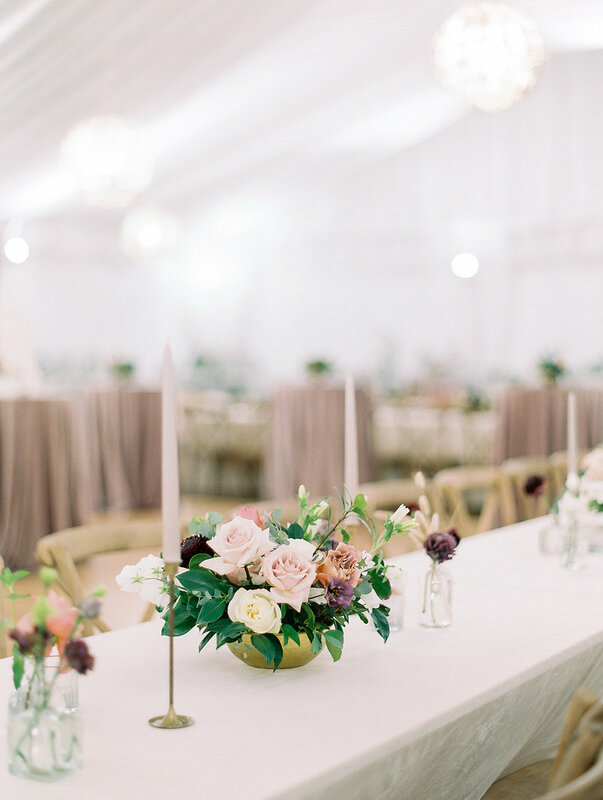 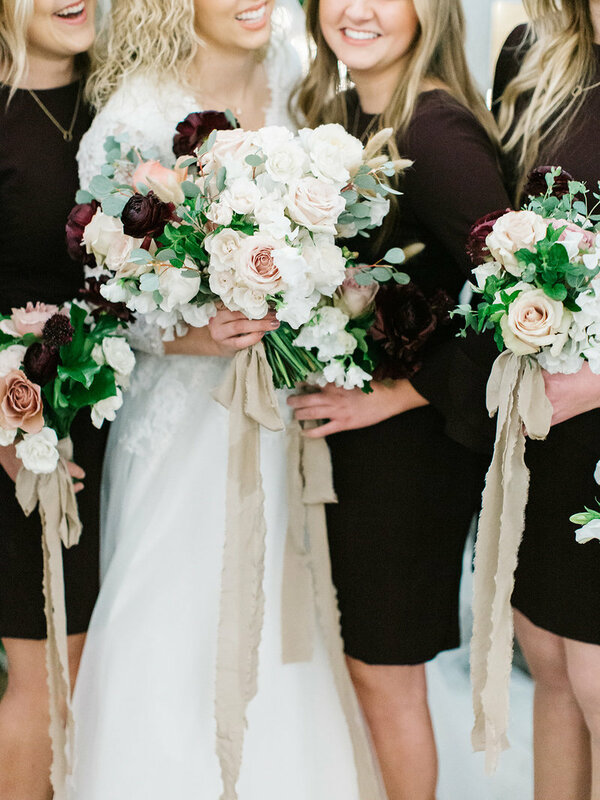 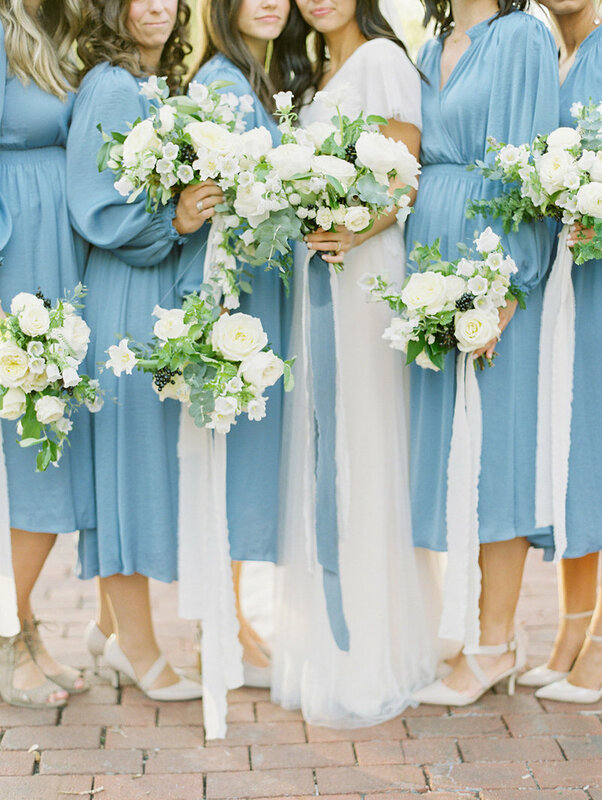 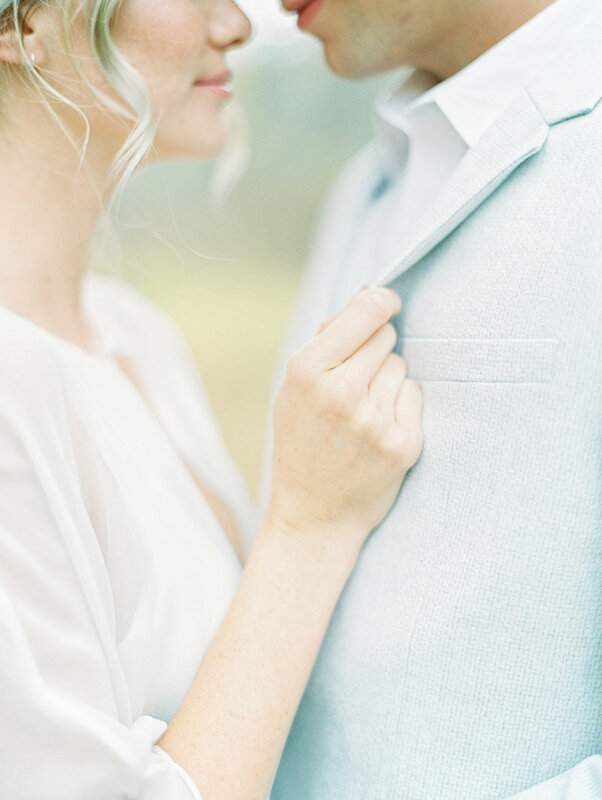 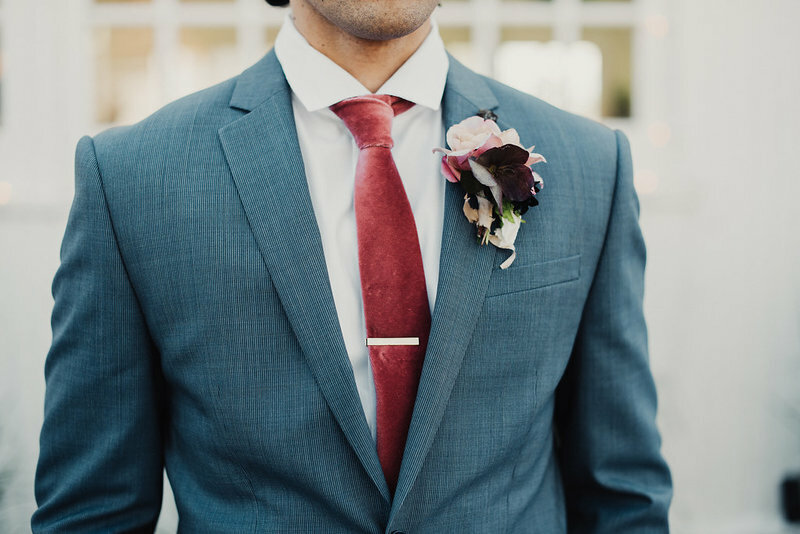 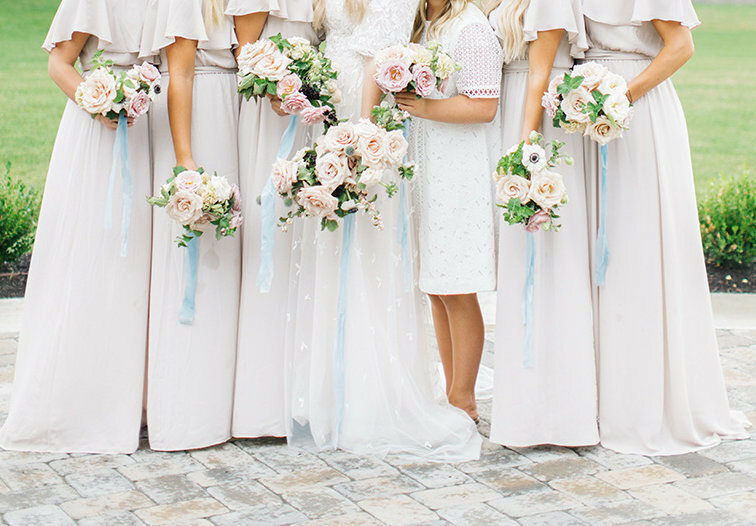 This couple chose a gorgeous color palette of neutrals, soft blue, pink, and burgundy. 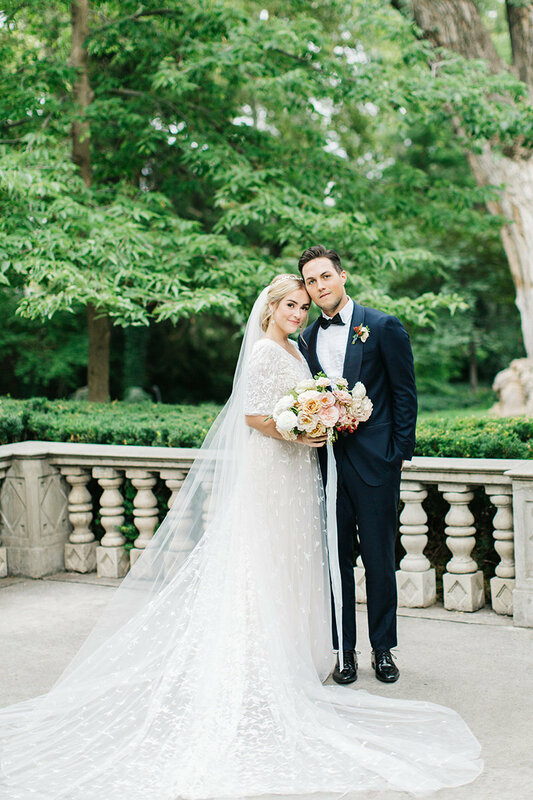 Their rainy-day wedding donned long velvet covered tables, antique blue glassware, and thousands of tea light orbs hanging from the trees. 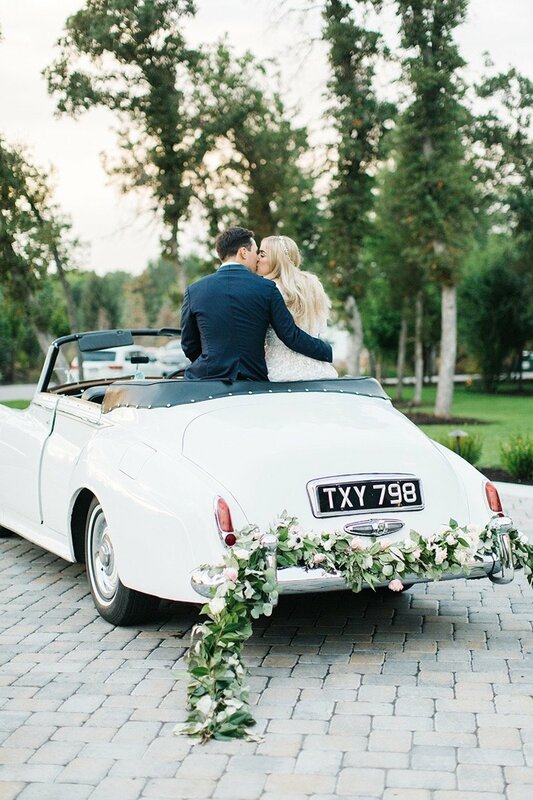 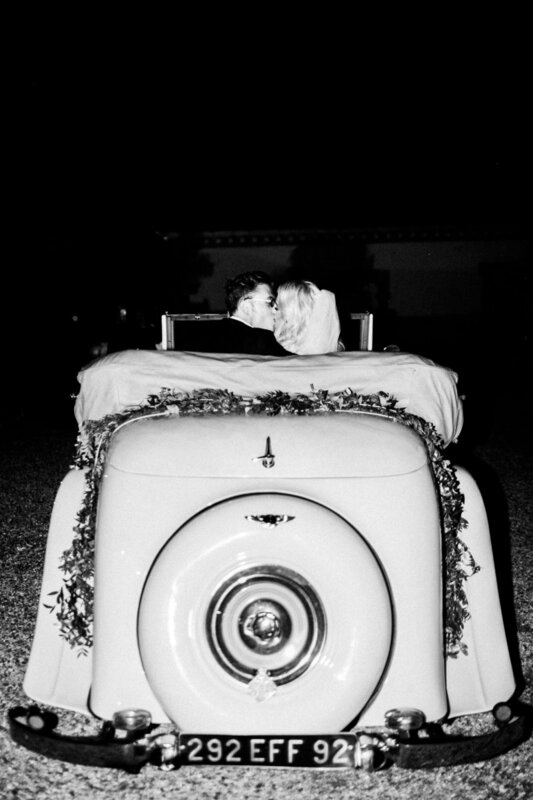 Her gorgeous beaded dress and his perfectly fitted navy tux finished the classic yet romantic look complete with a vintage Rolls Royce getaway. 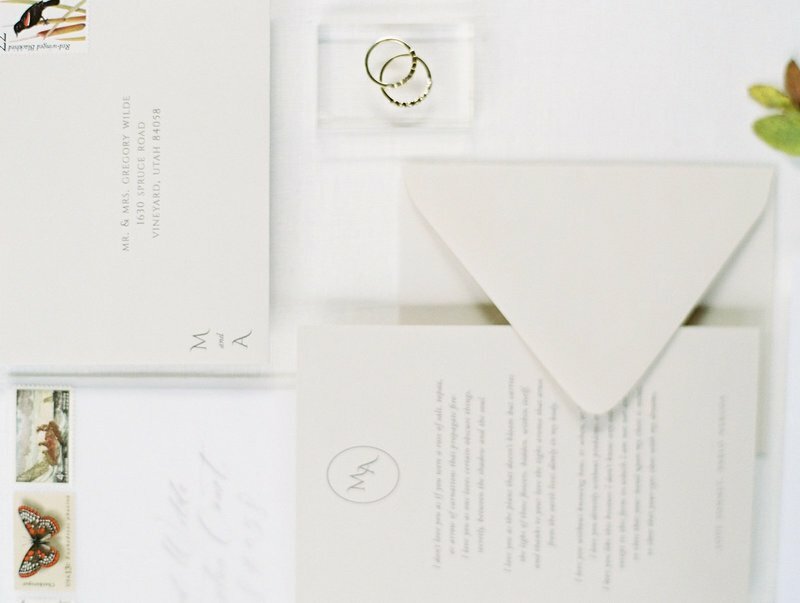 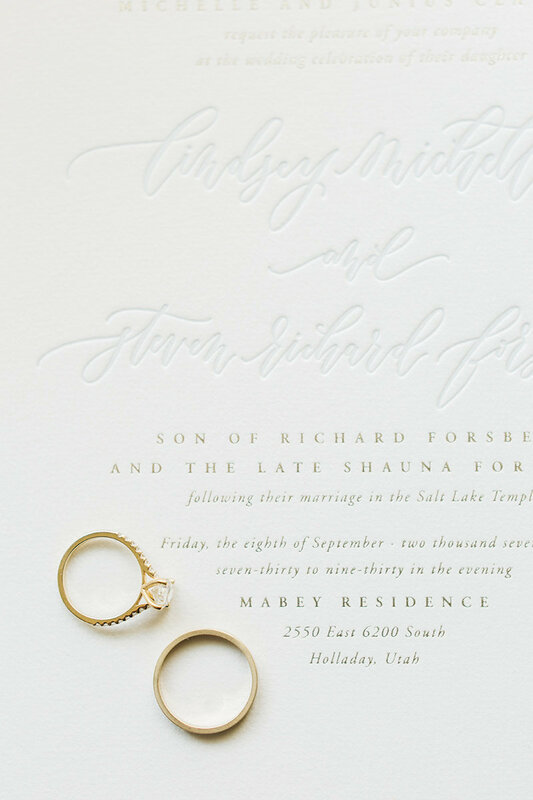 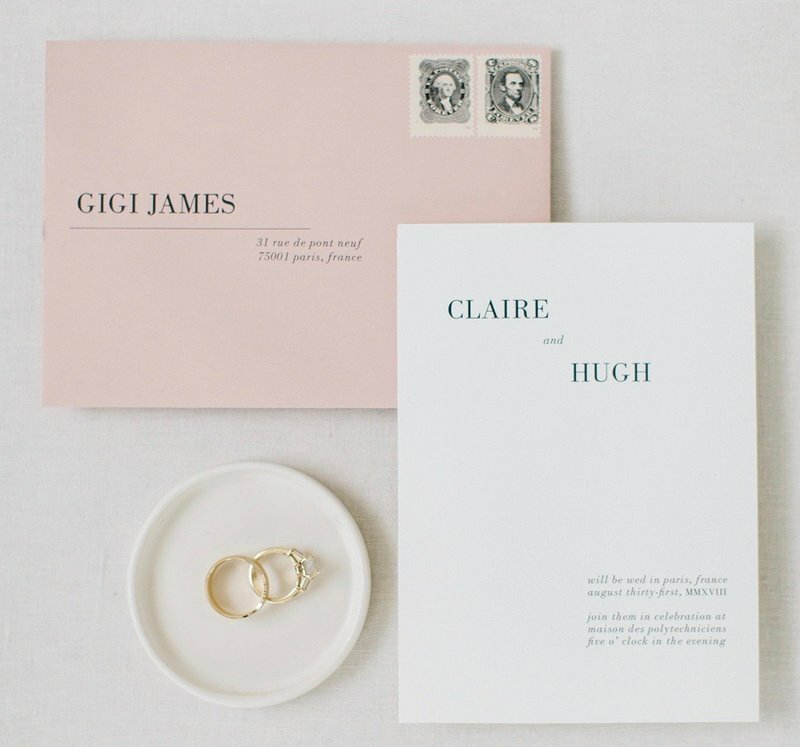 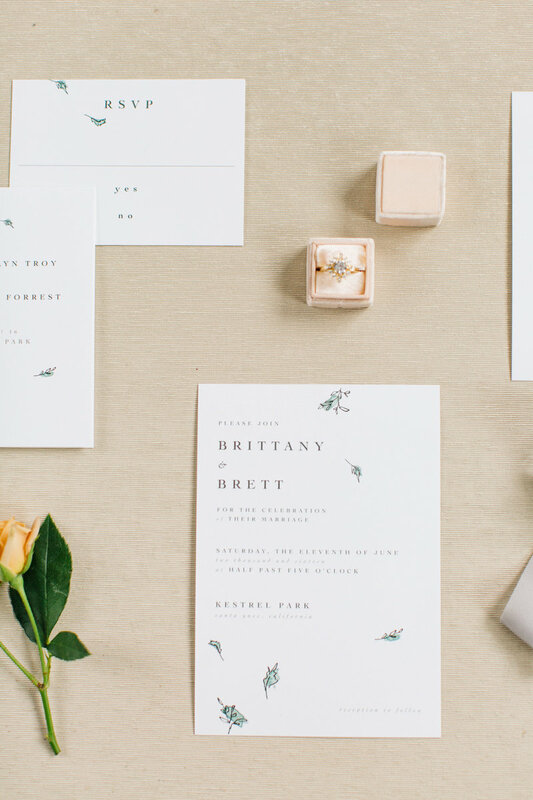 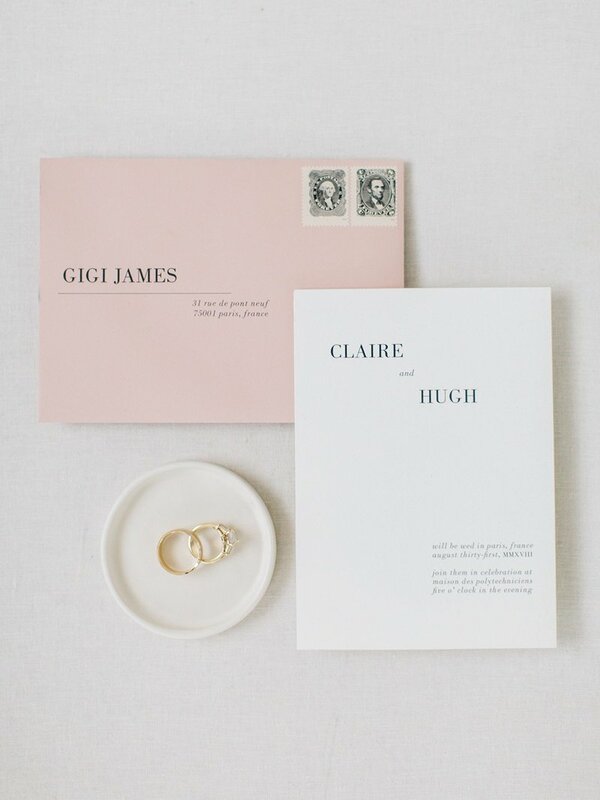 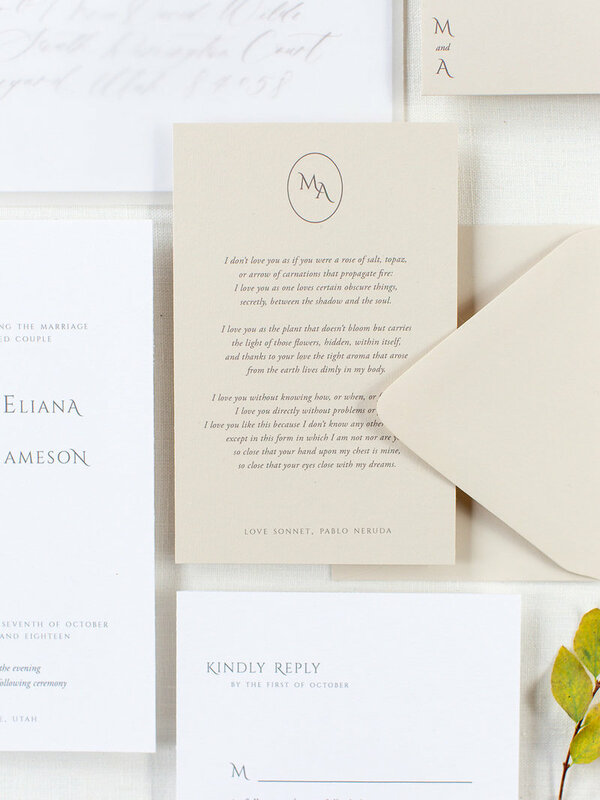 This stylish design was the perfect combination of modern romanticism. 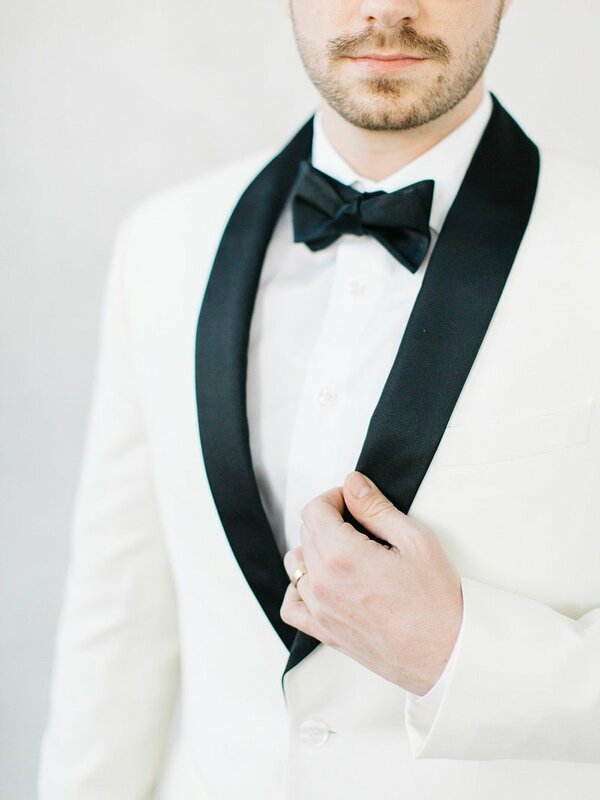 Pairing bold punchy colors with sleek, minimal details gave the look visual interest while the classic glassware and his tux added a sense of classical luxury. 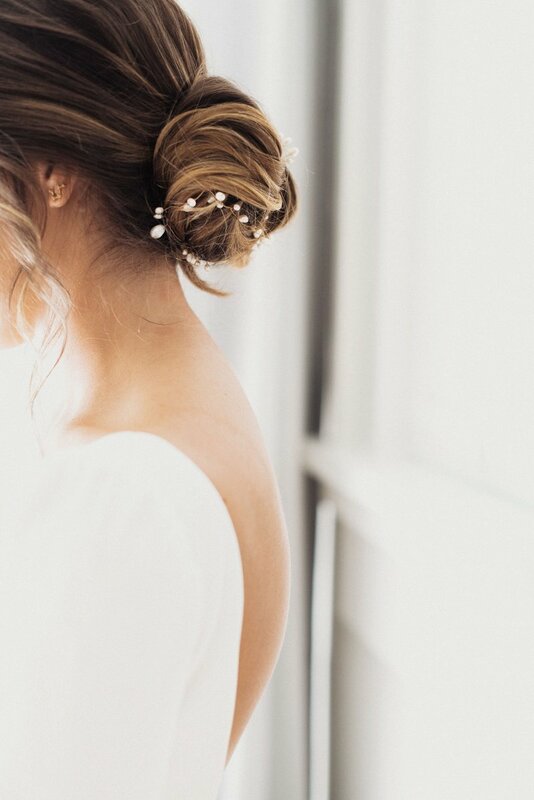 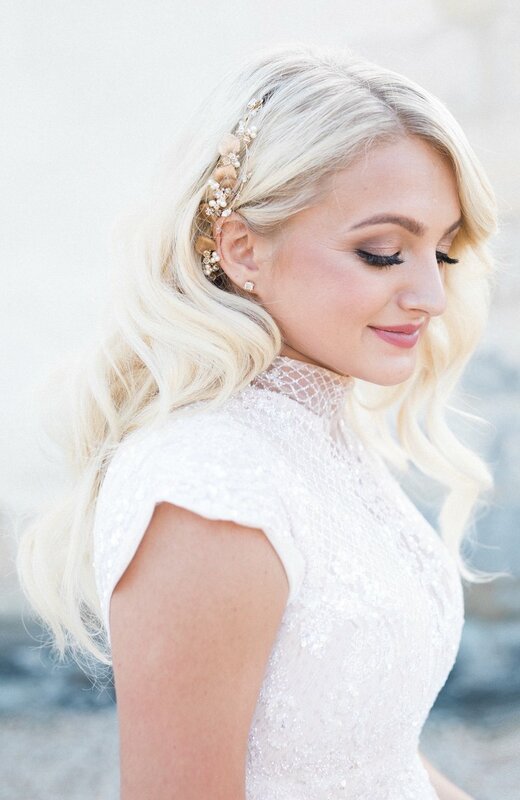 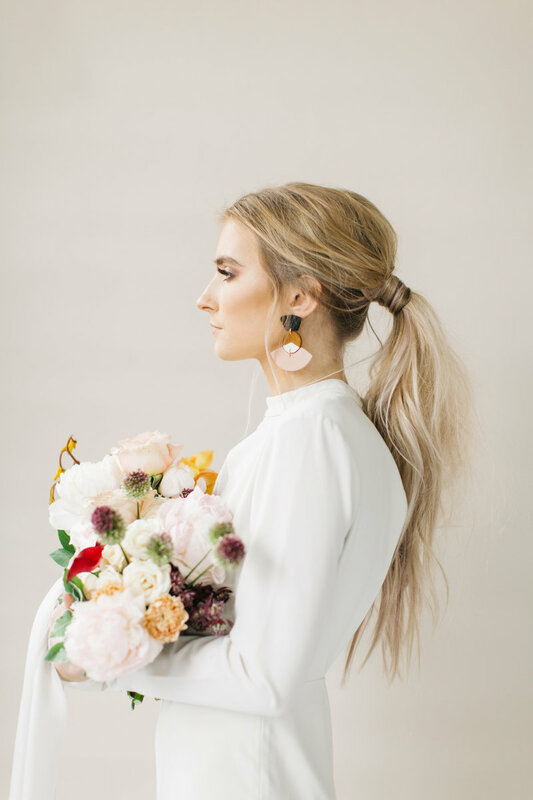 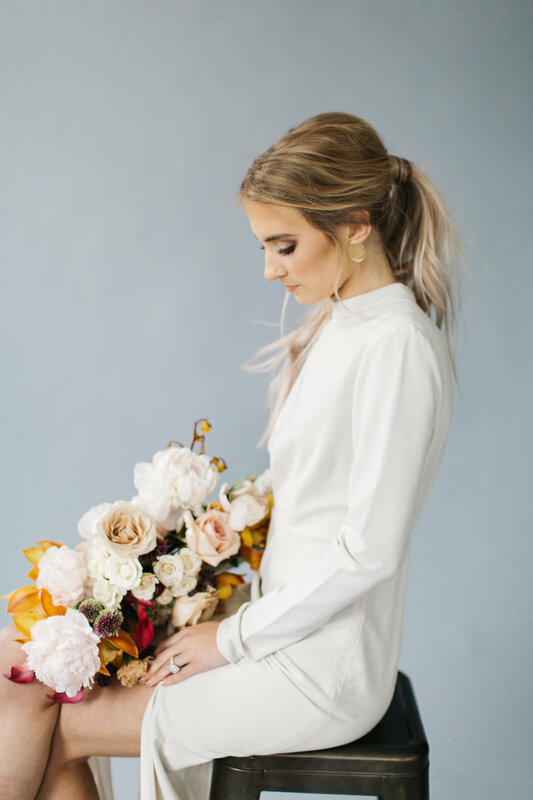 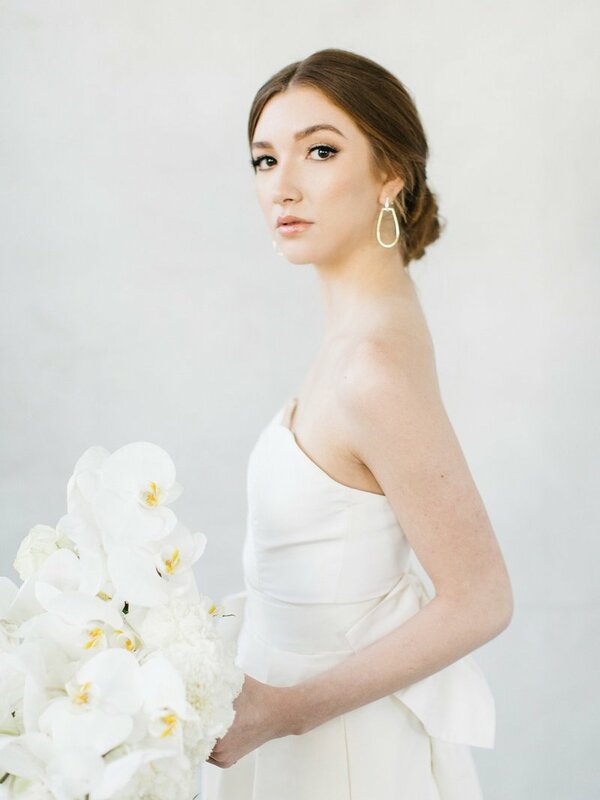 We love how the bridal pony tail and statement earrings give a fresh, relaxed feel to the modern dress. 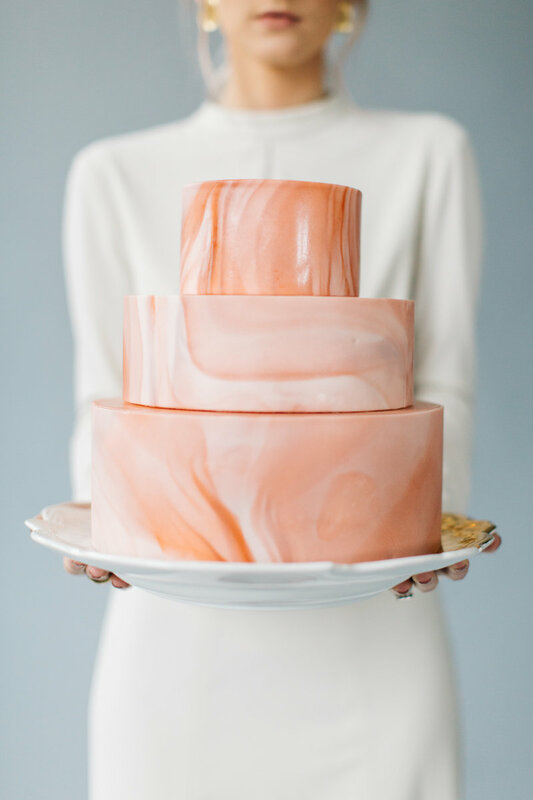 We especially love the pink, marble cake! 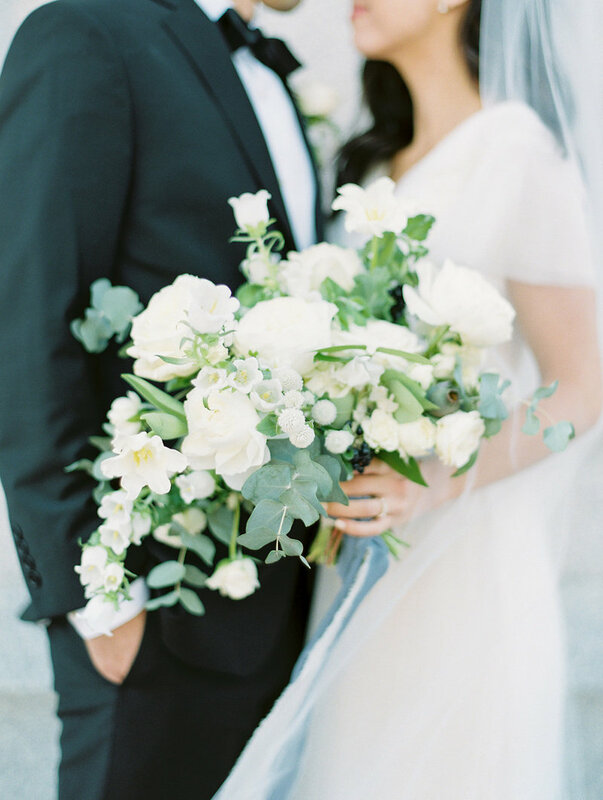 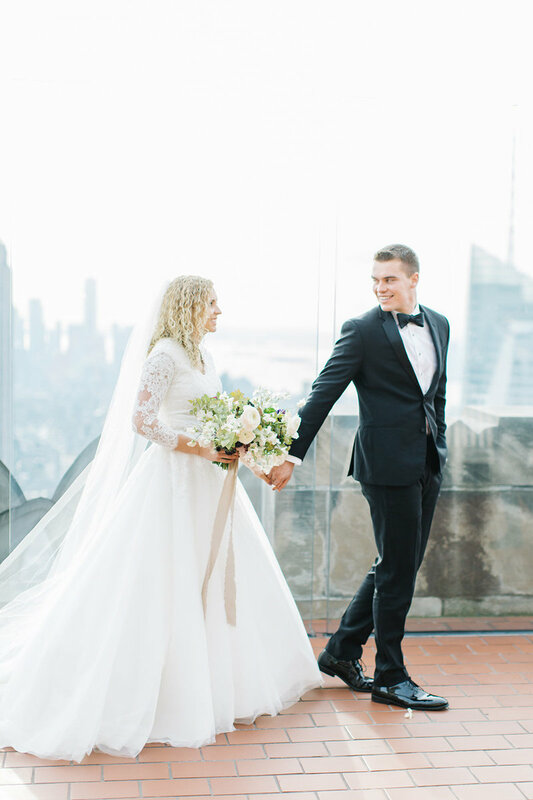 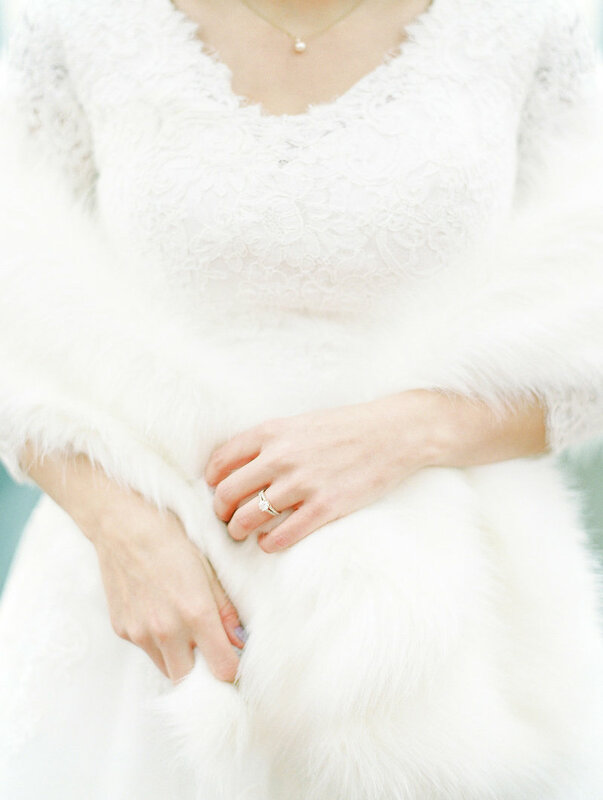 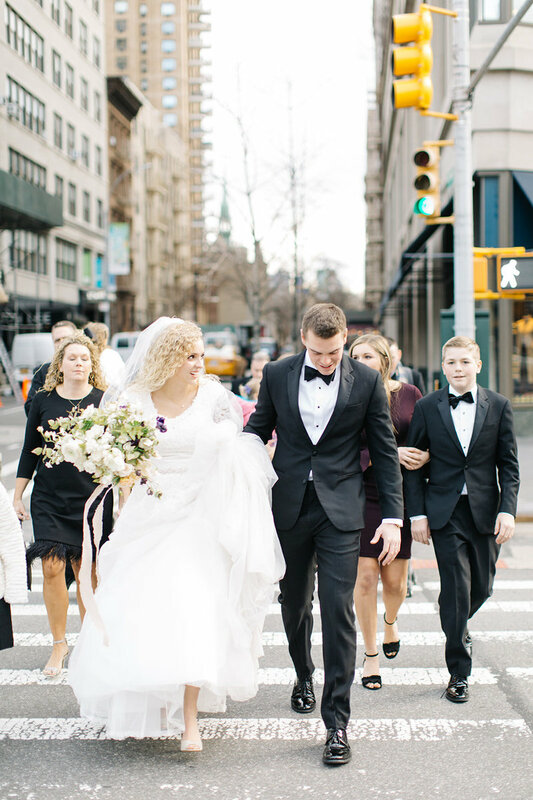 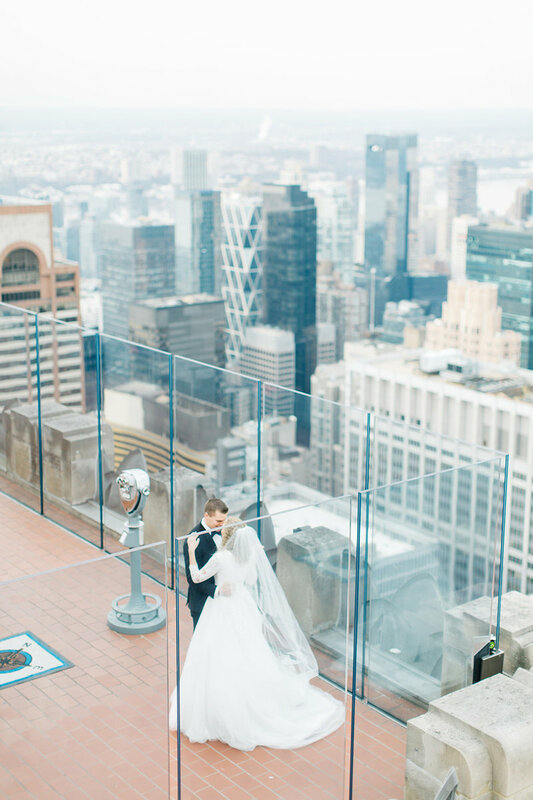 Kylie and Braden were married on a lovely winter day in New York City. 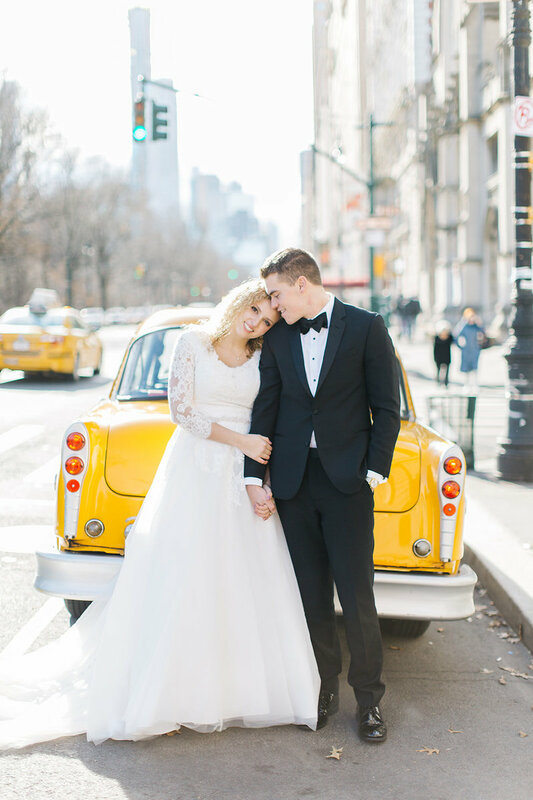 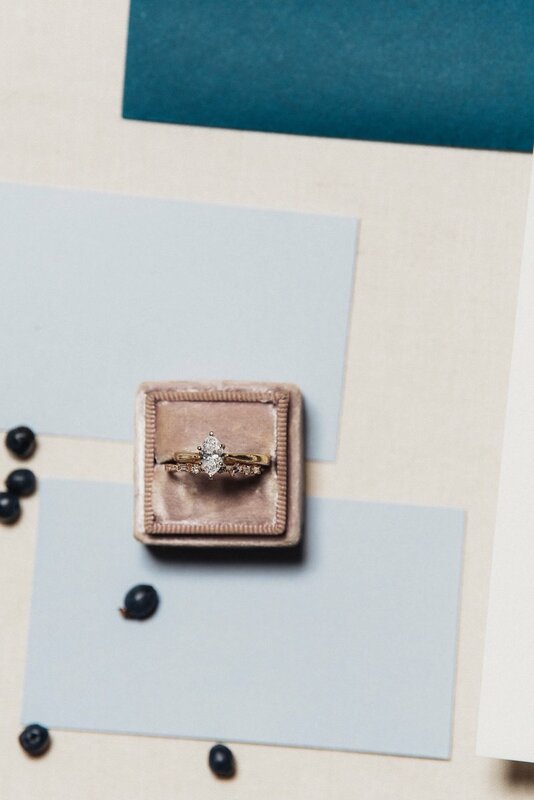 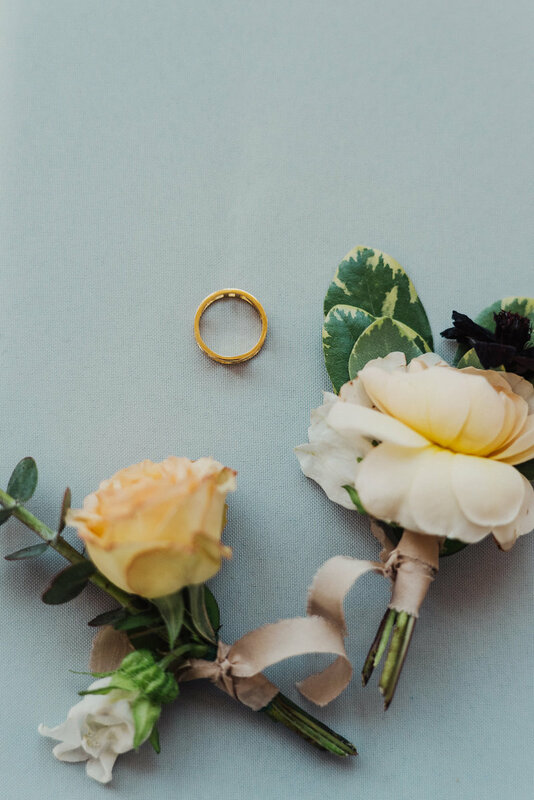 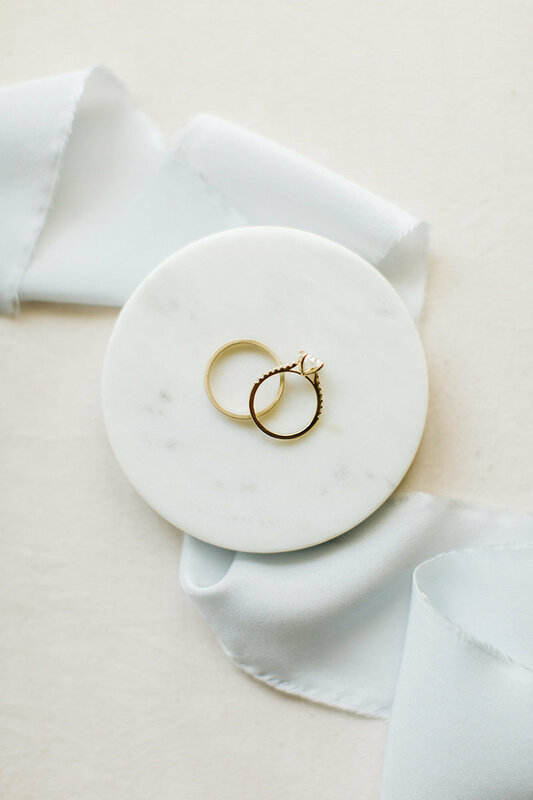 The couple shared an intimate ceremony complete with a vintage cab ride and a gathering at the iconic Tavern on the Green. 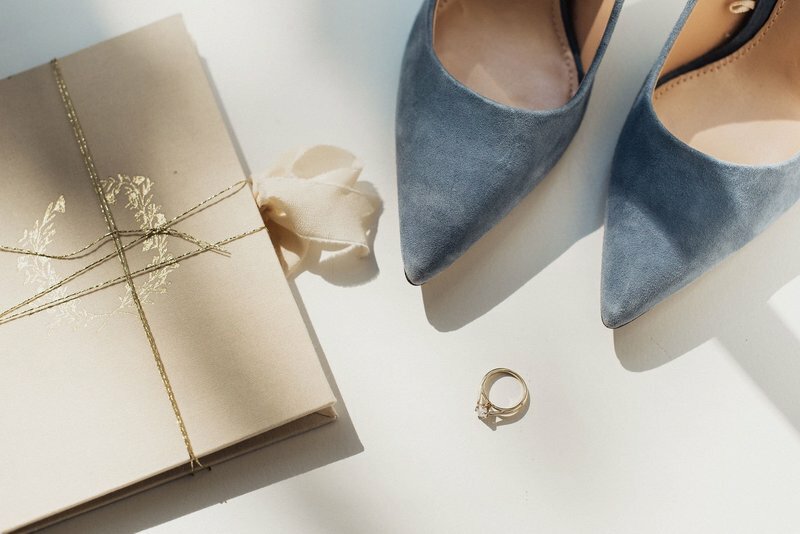 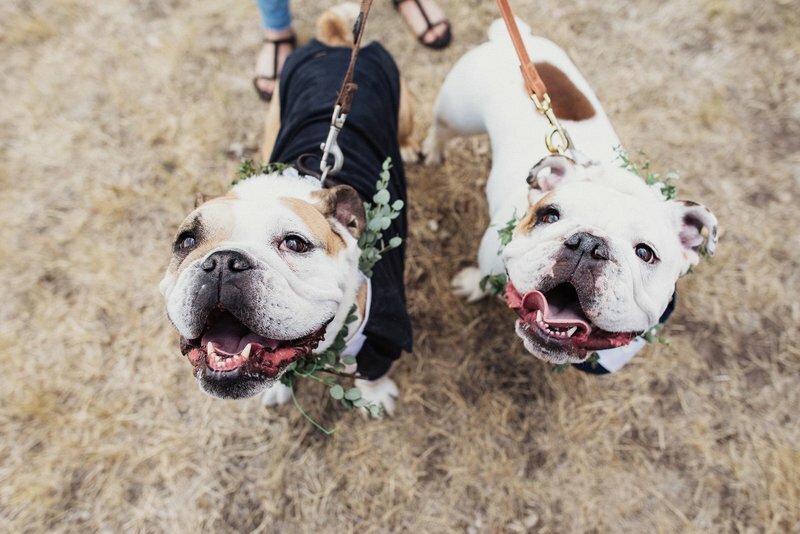 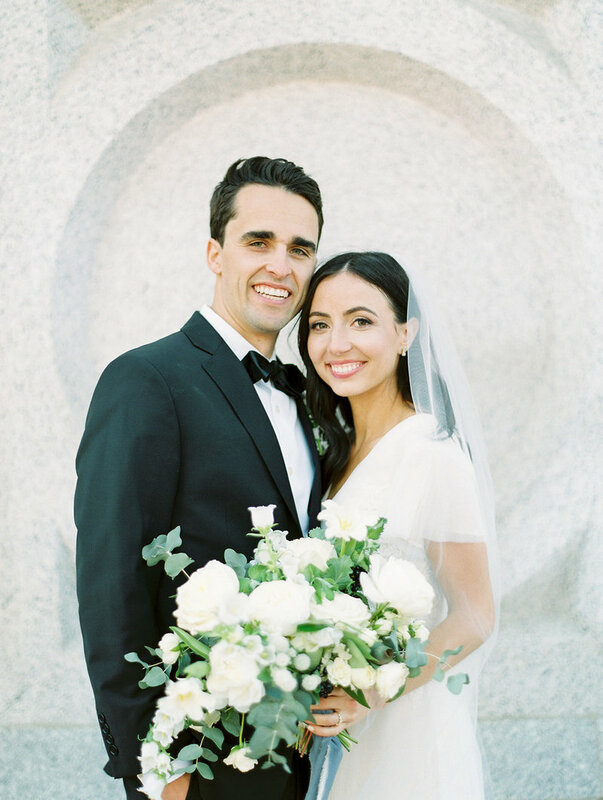 They celebrated the next day with a reception at the Bride's home in Connecticut. 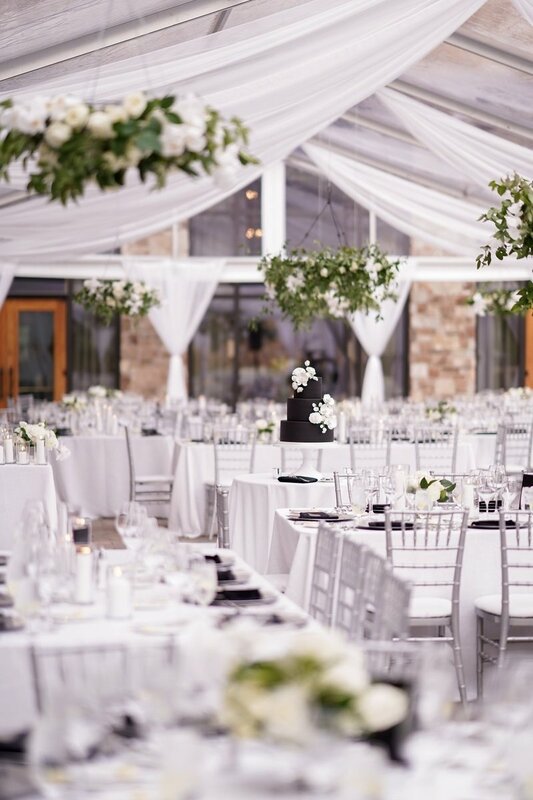 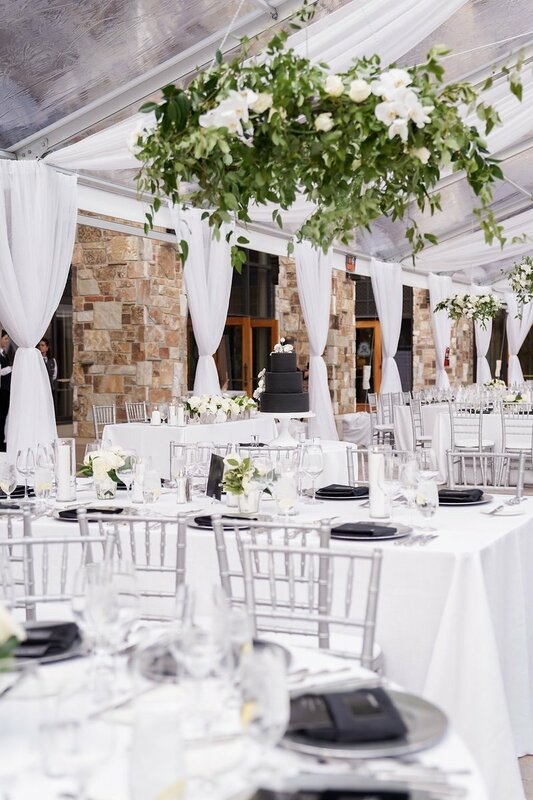 The event took place in a glamorous white tent complete with elegant draping and romantic details. 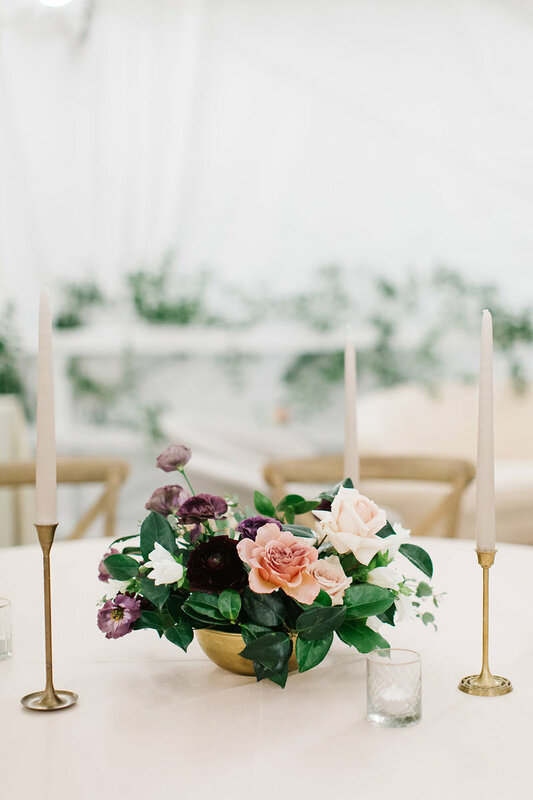 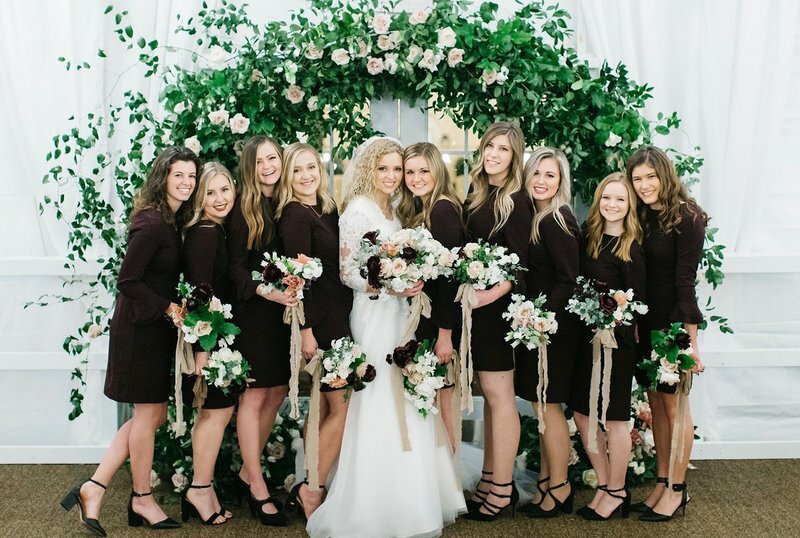 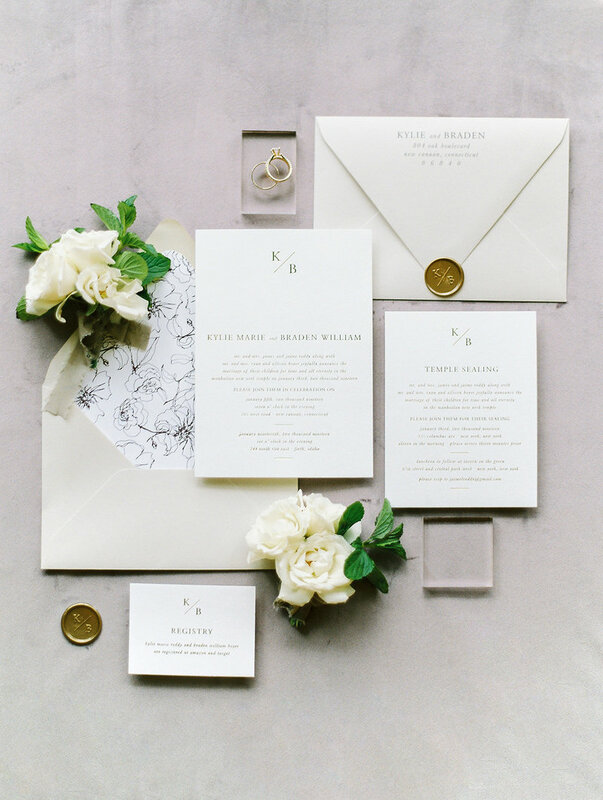 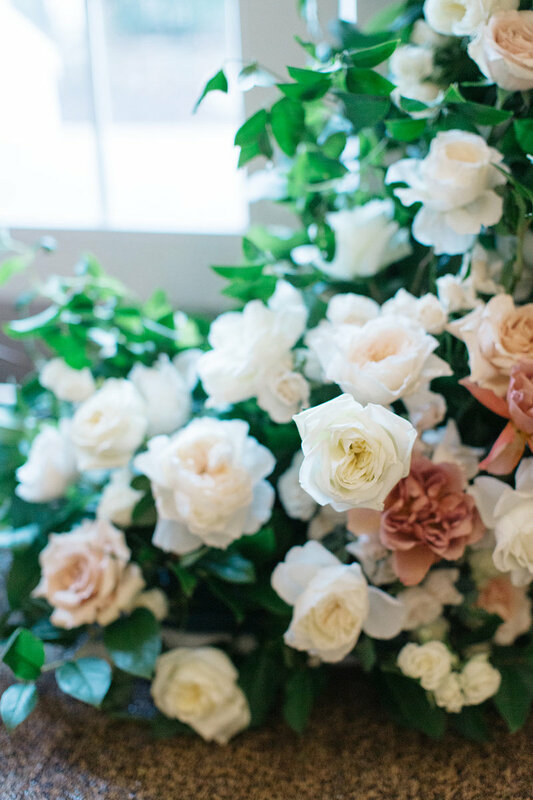 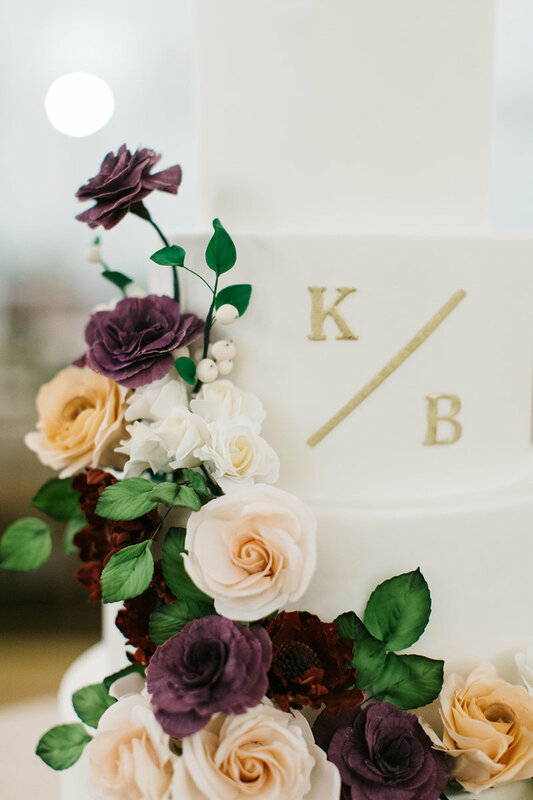 The design incorporated a mod wedding logo, velvet details, and romantic florals to create a garden style to the event. 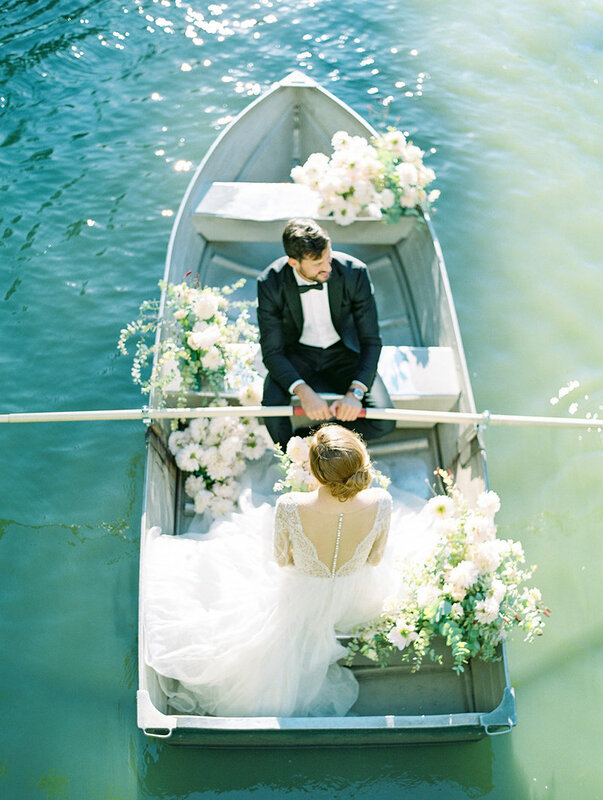 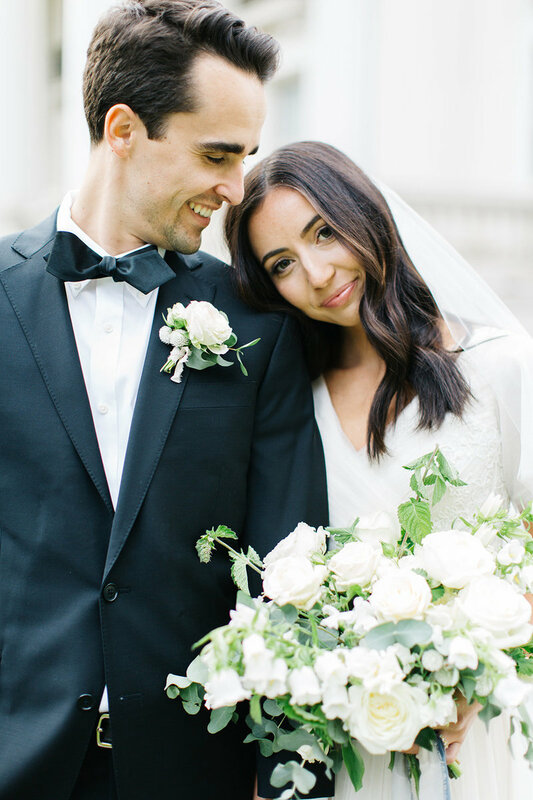 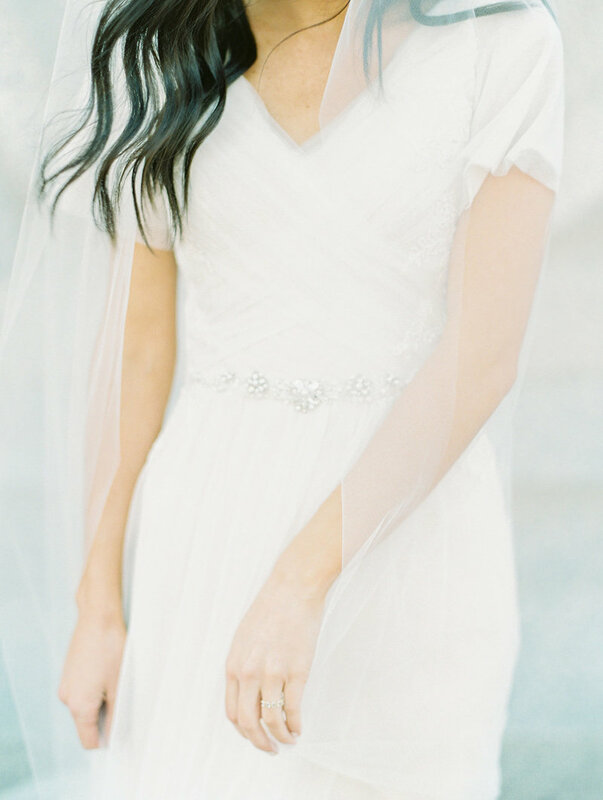 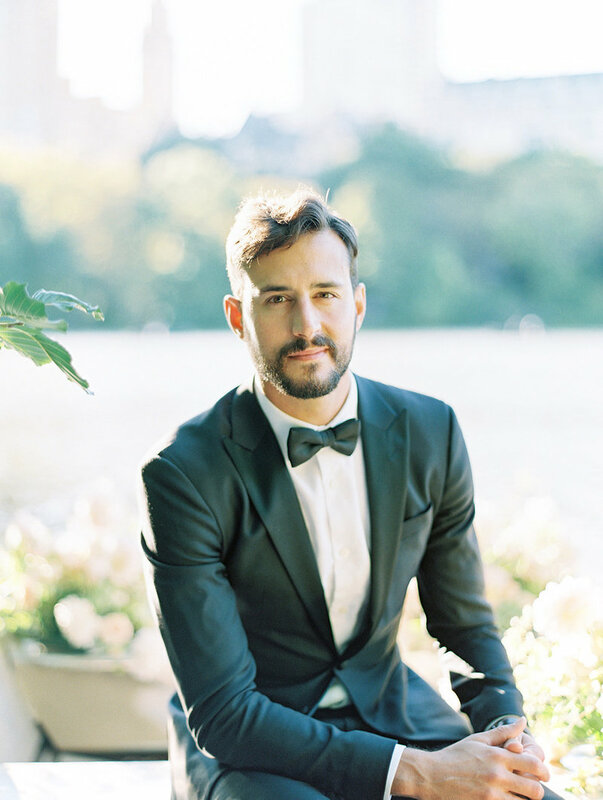 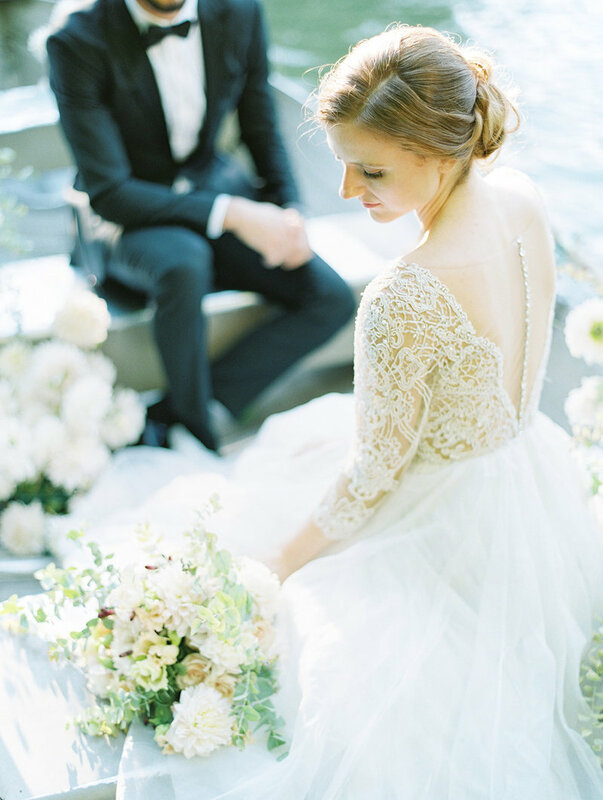 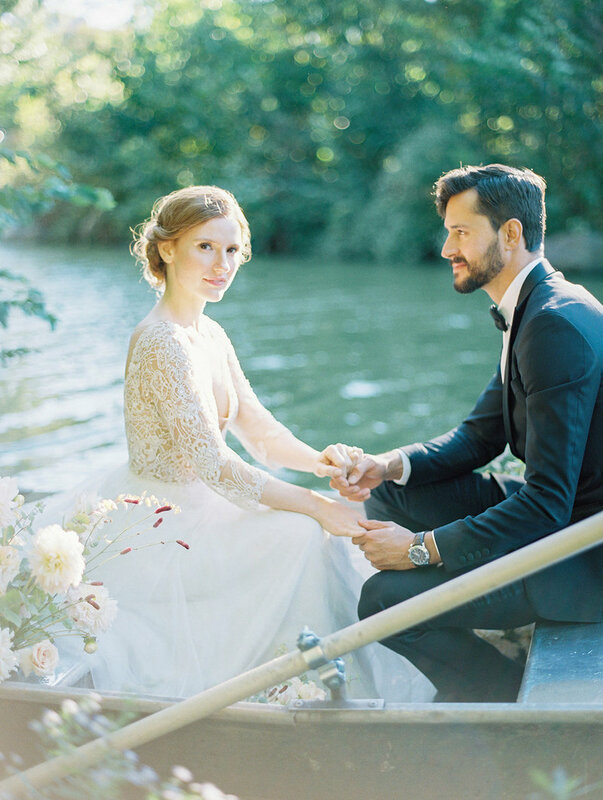 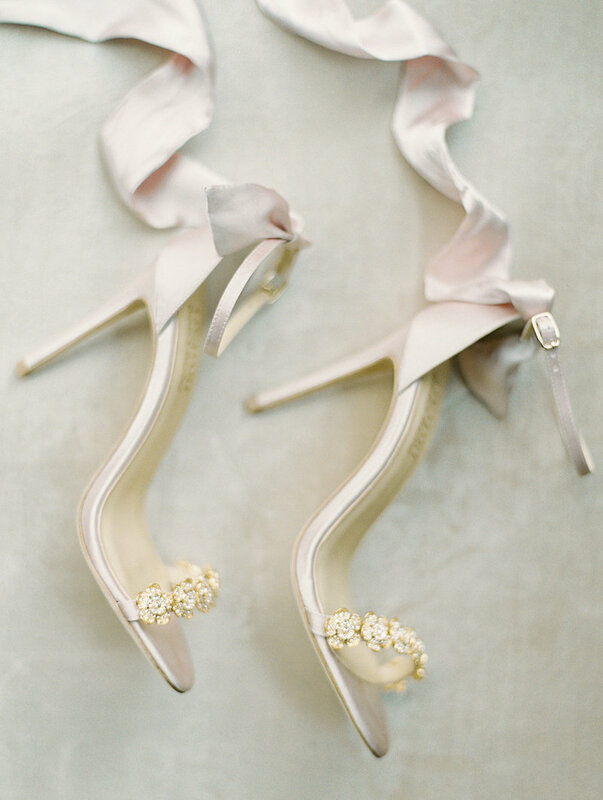 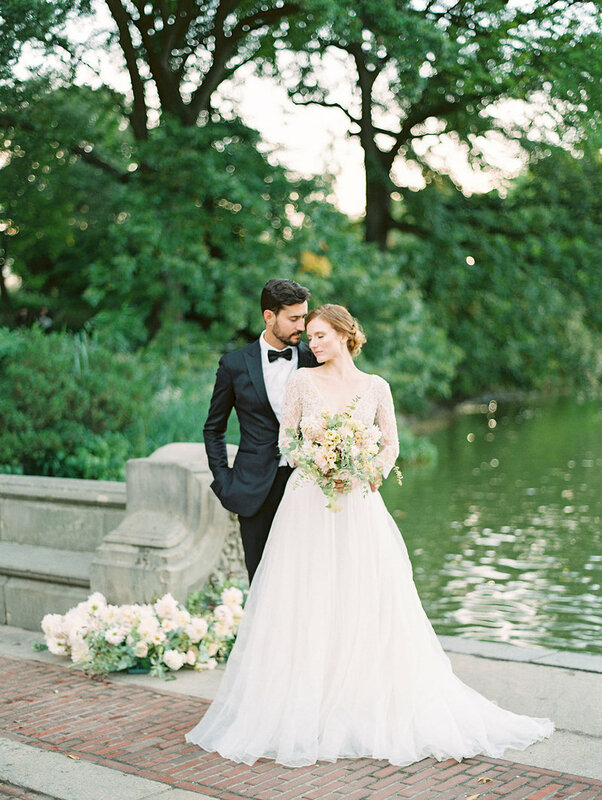 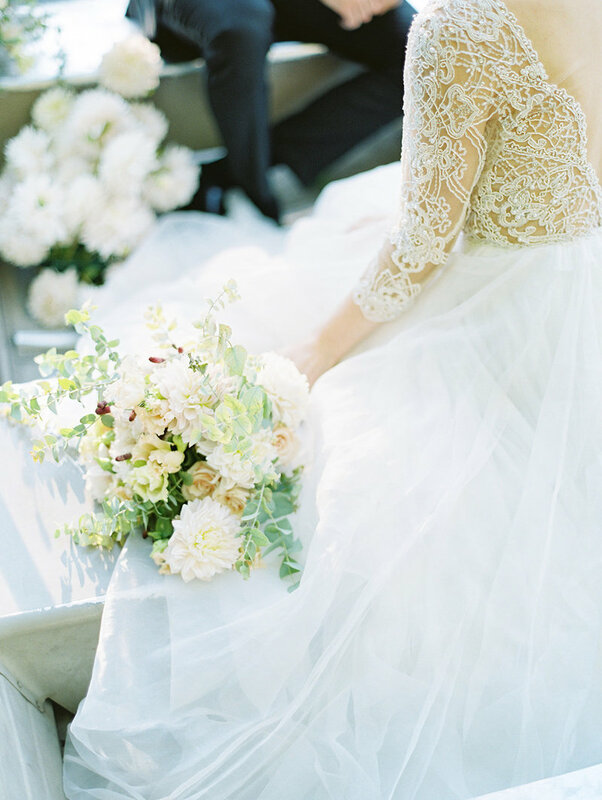 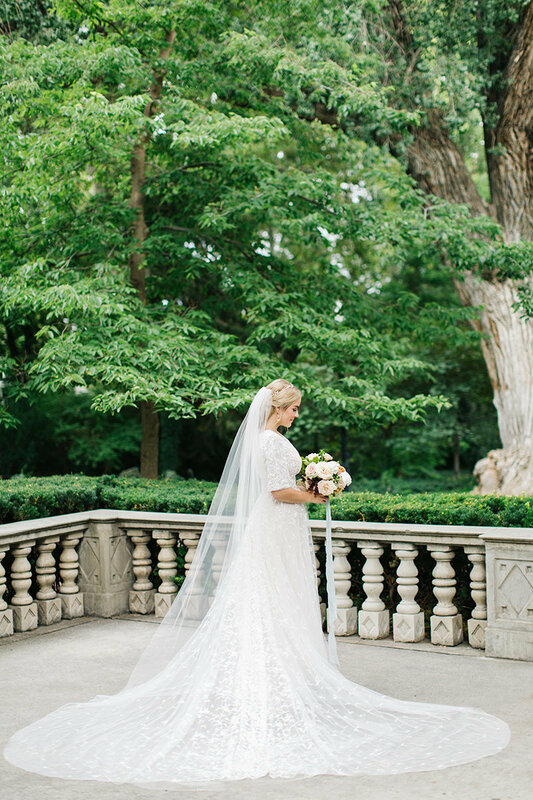 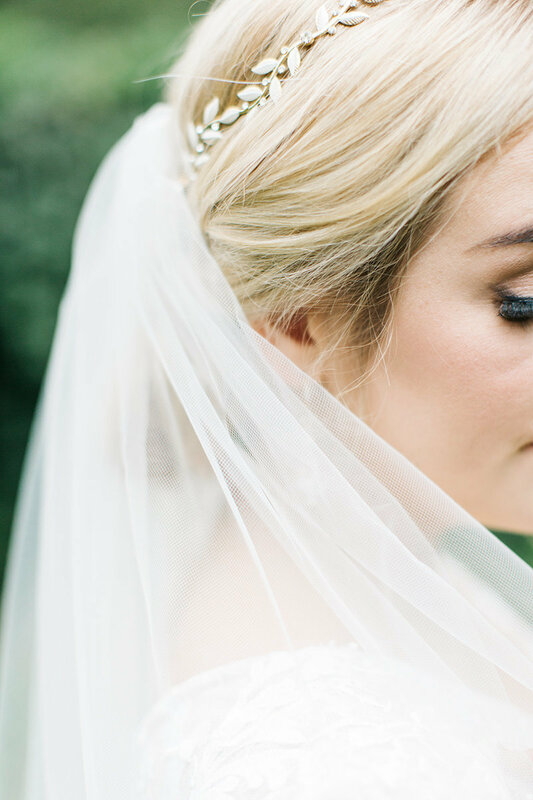 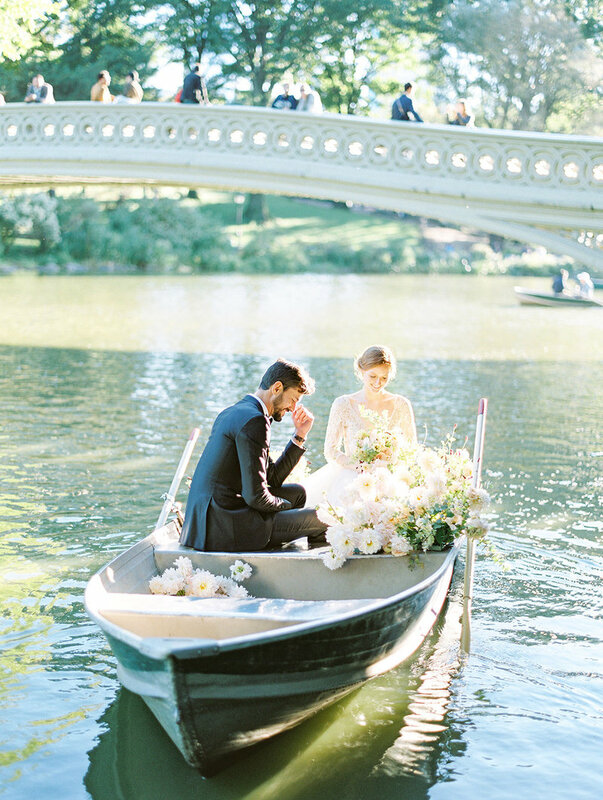 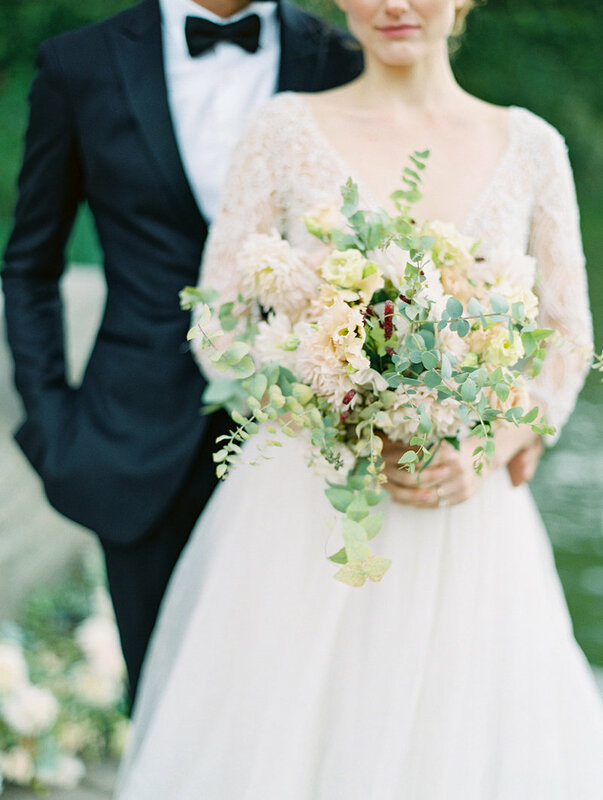 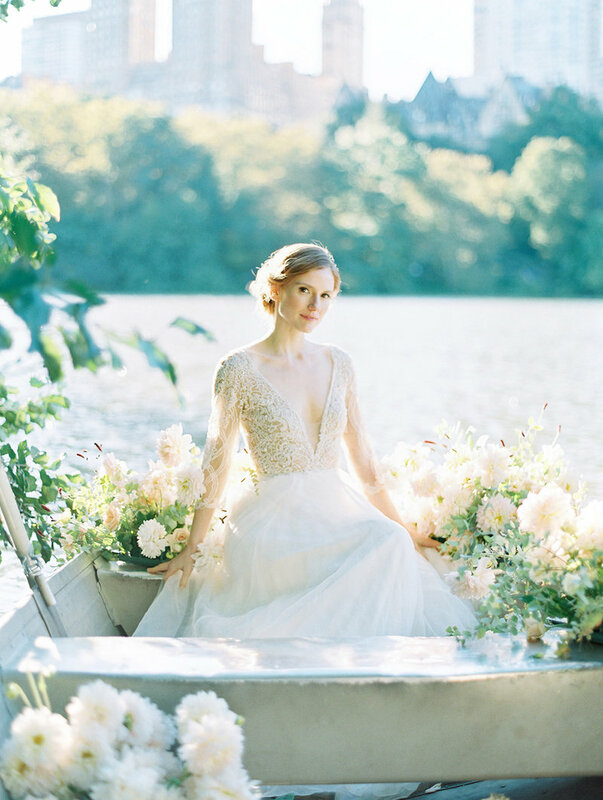 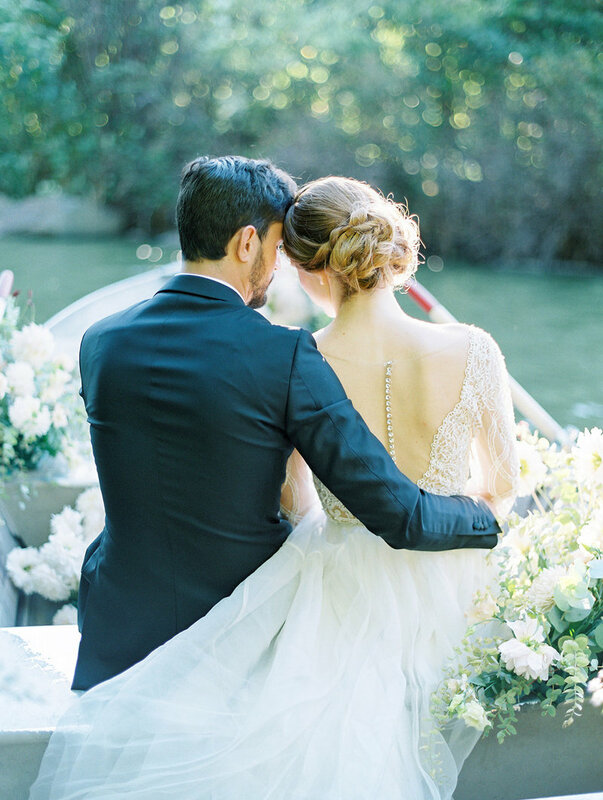 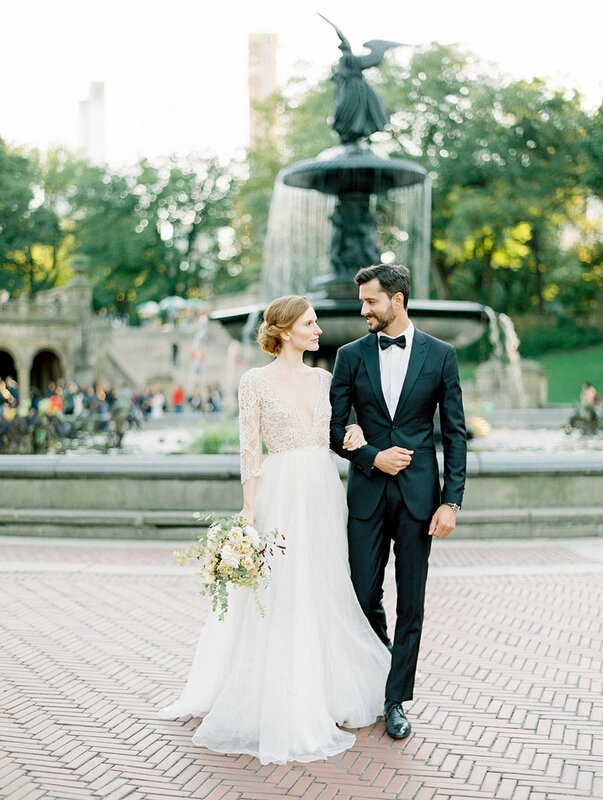 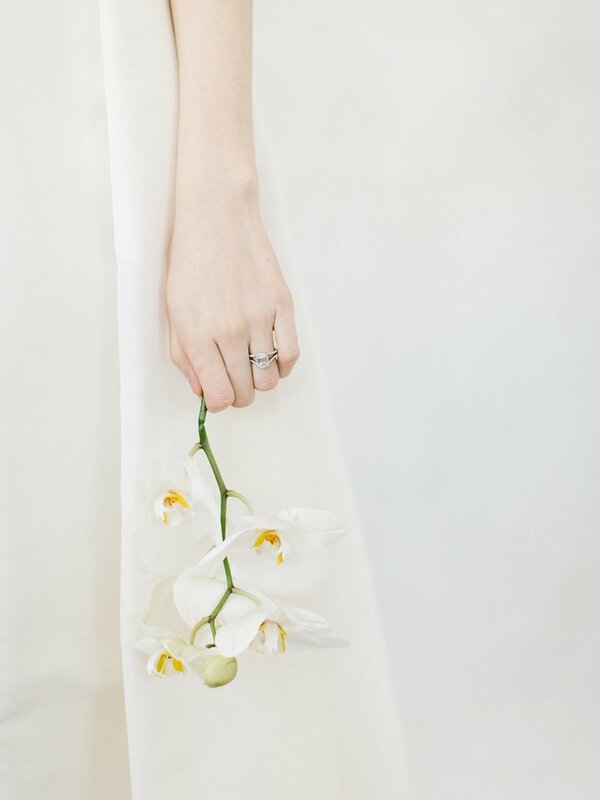 There is something so classic about the Central Park Boathouse and this elopement is no exception. 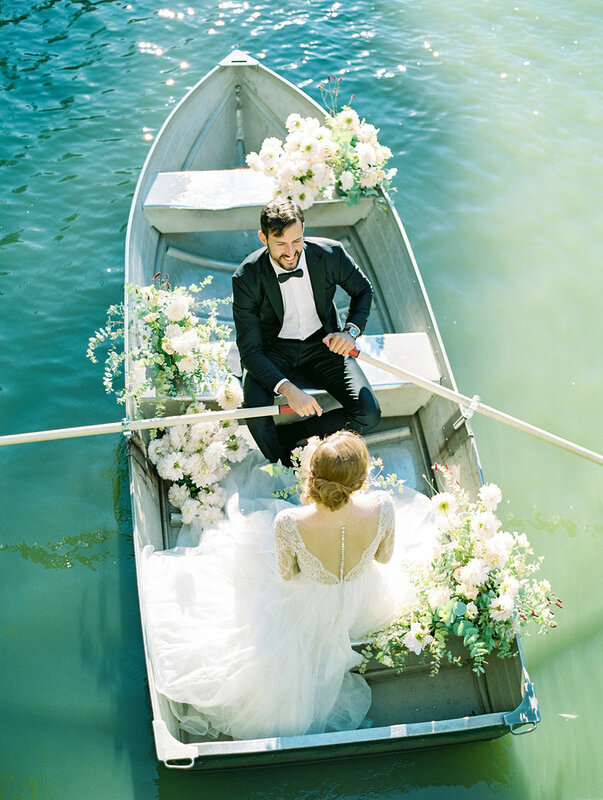 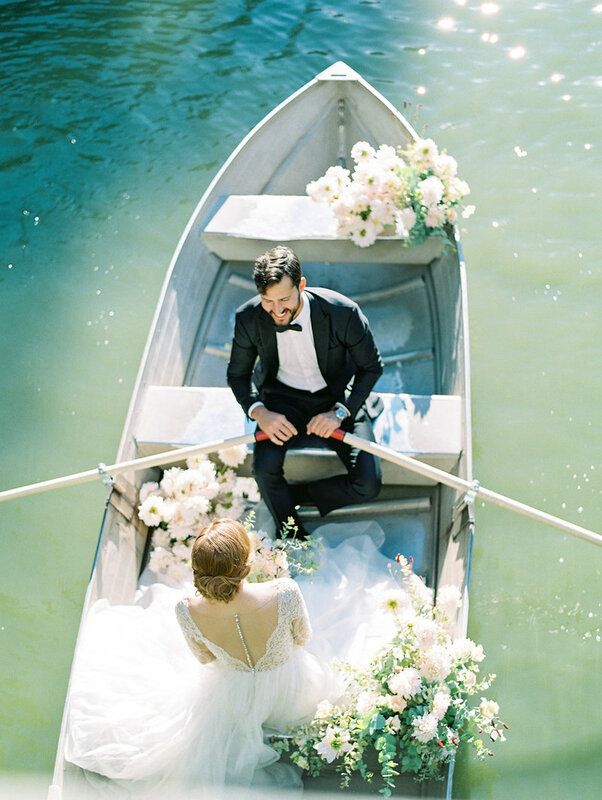 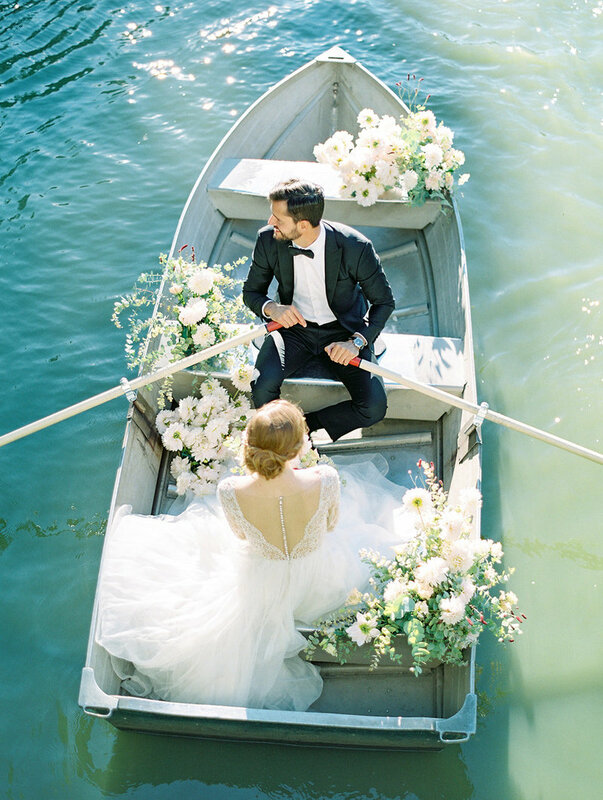 The couple chose to adorn the classic boats with dozens of dahlias, roses, and greenery for an organic and undeniably romantic look. 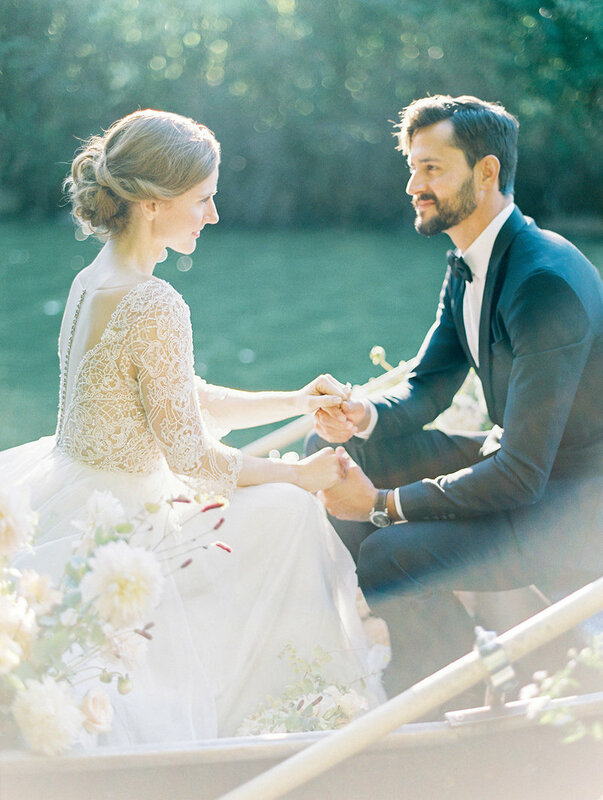 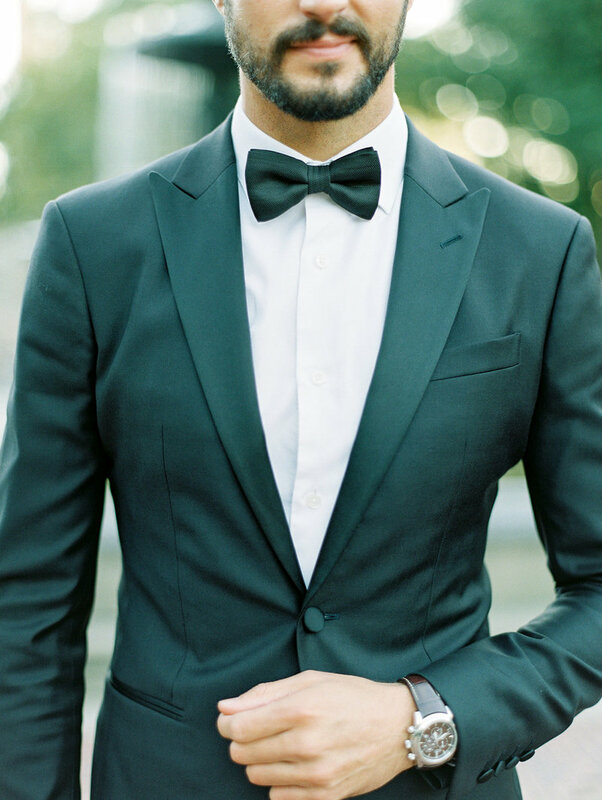 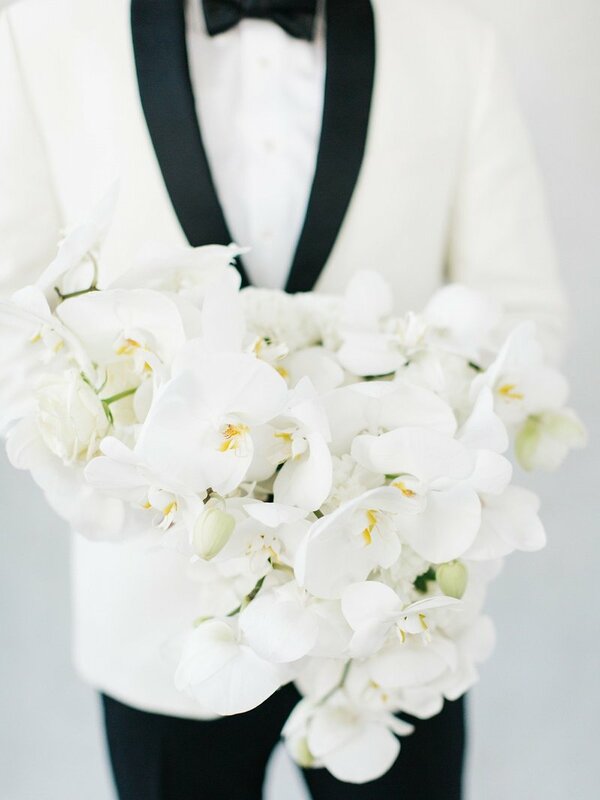 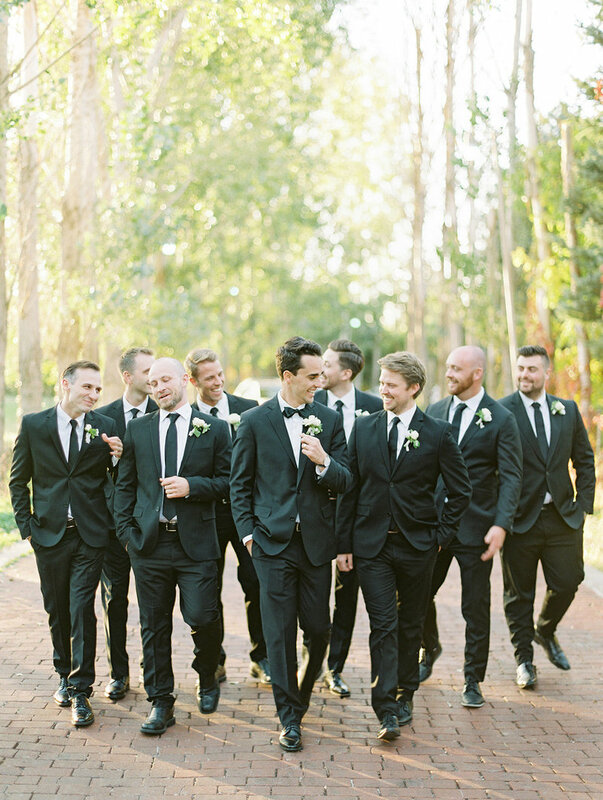 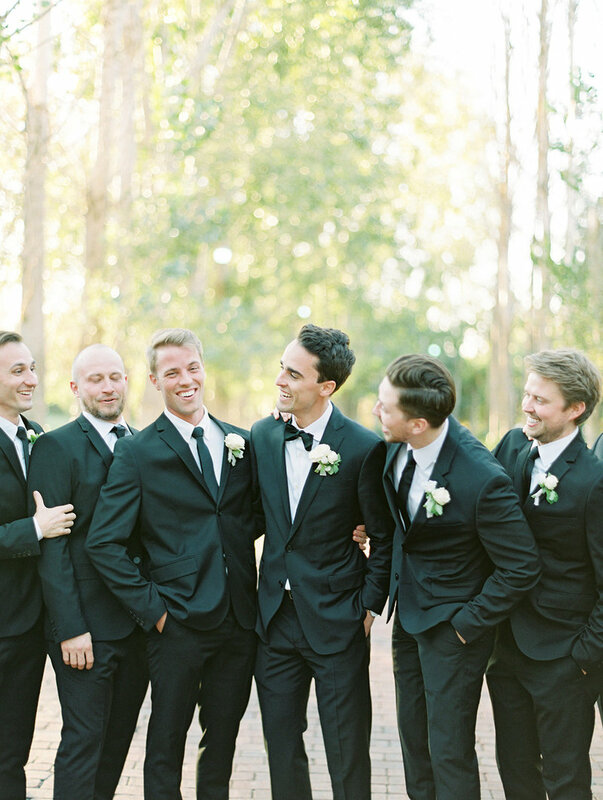 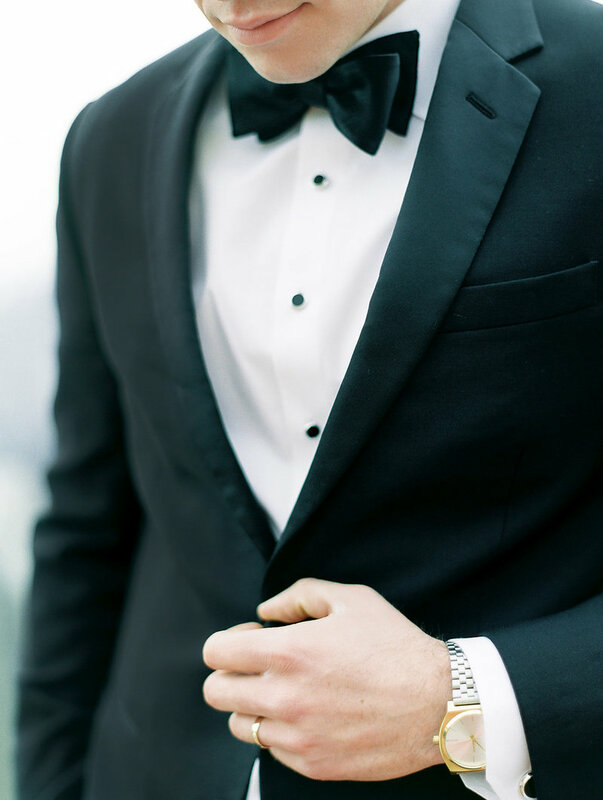 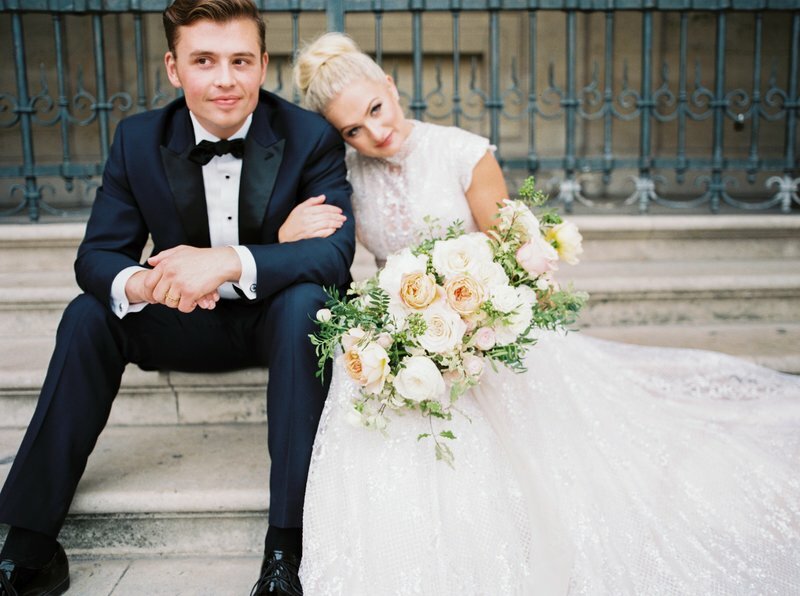 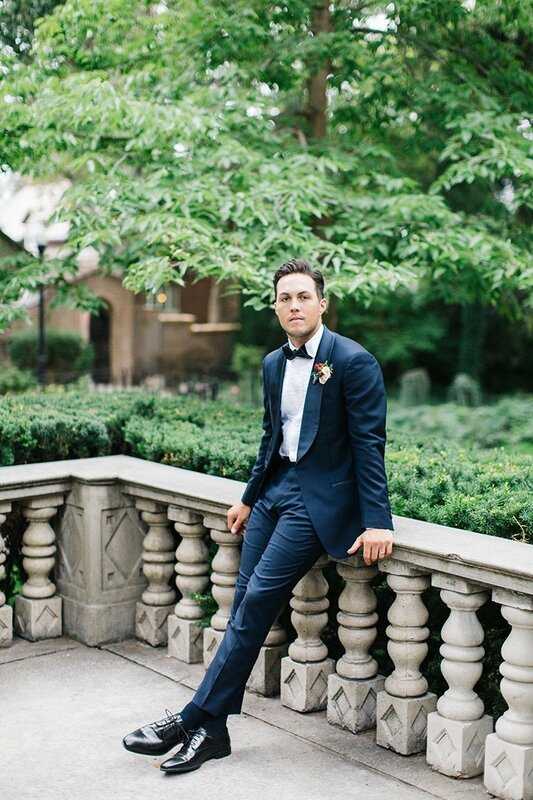 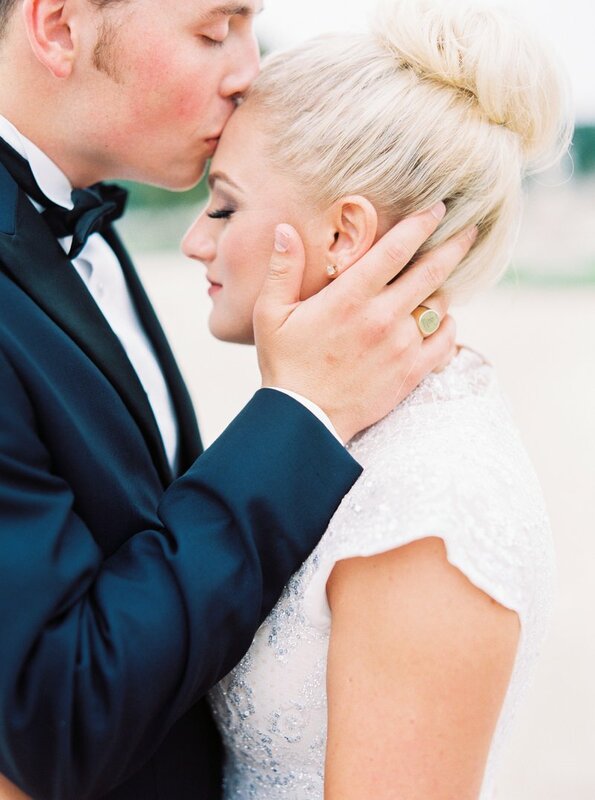 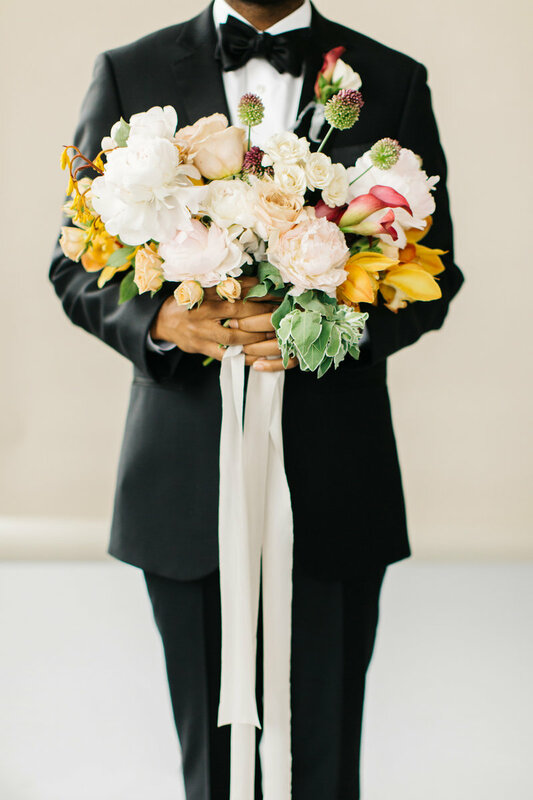 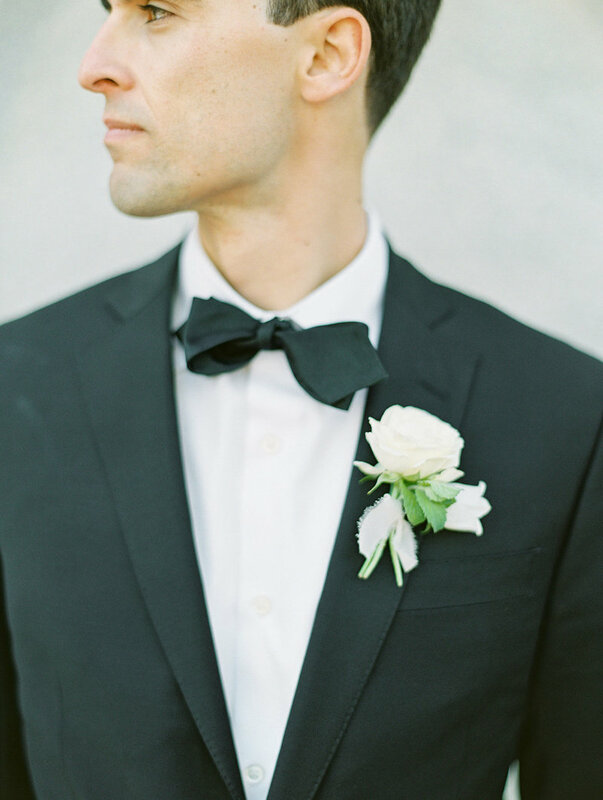 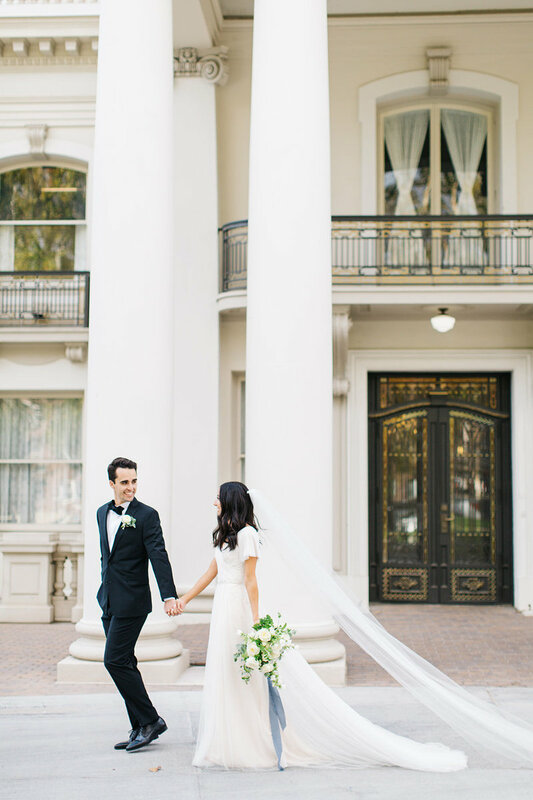 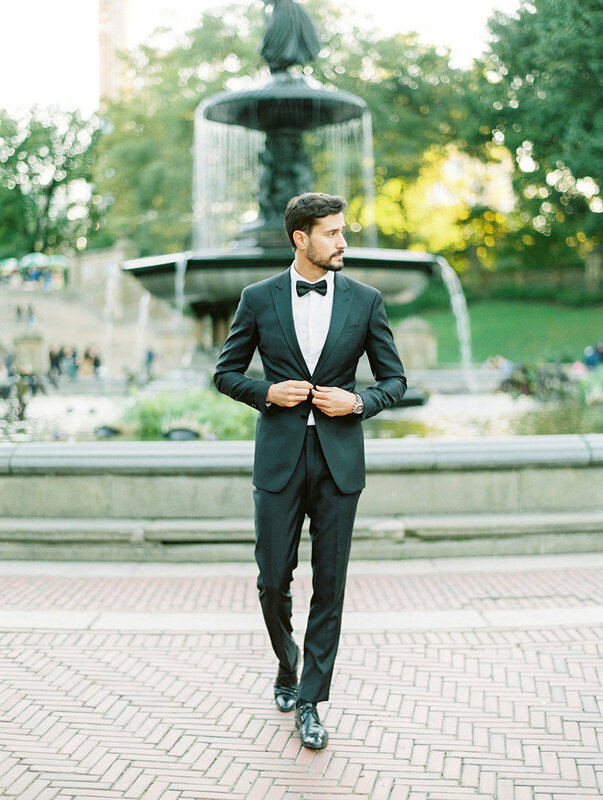 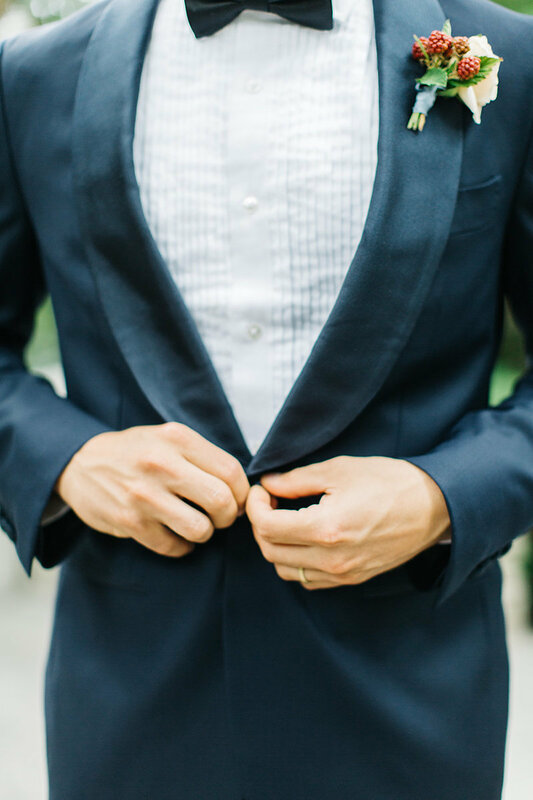 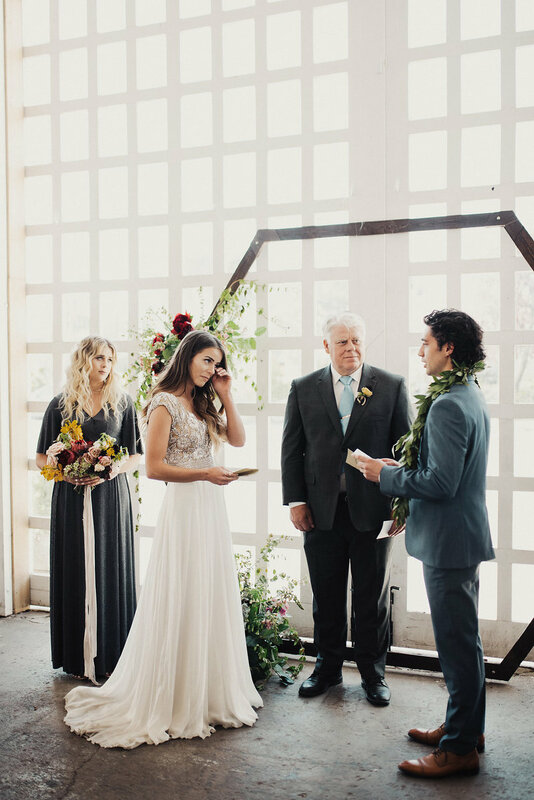 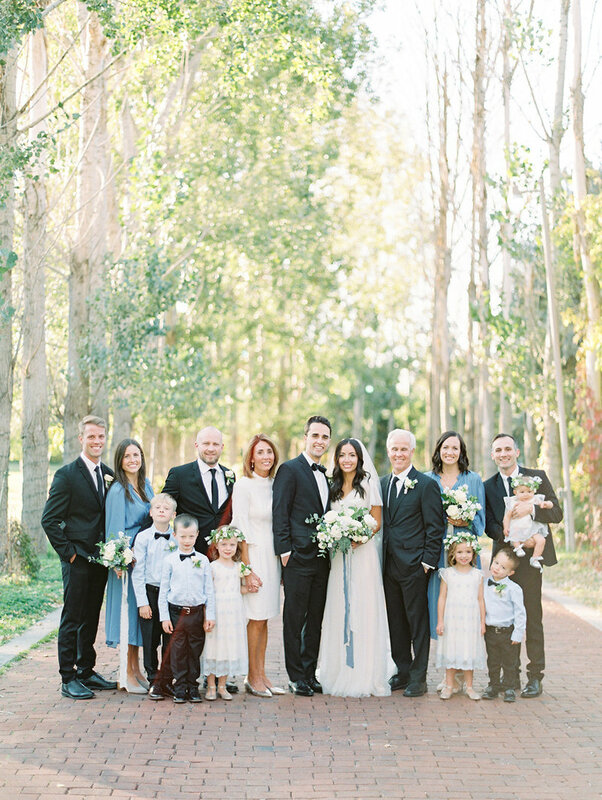 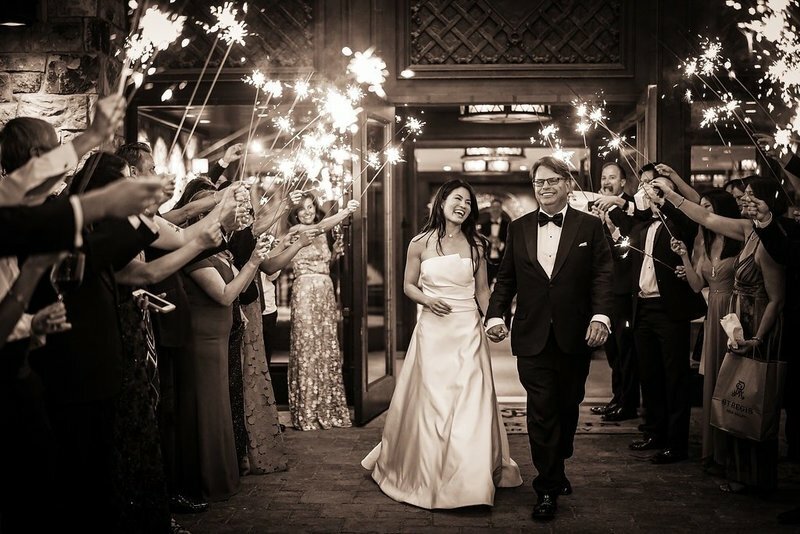 We love the groom’s classic black tux and the brides detailed yet refined beaded gown. 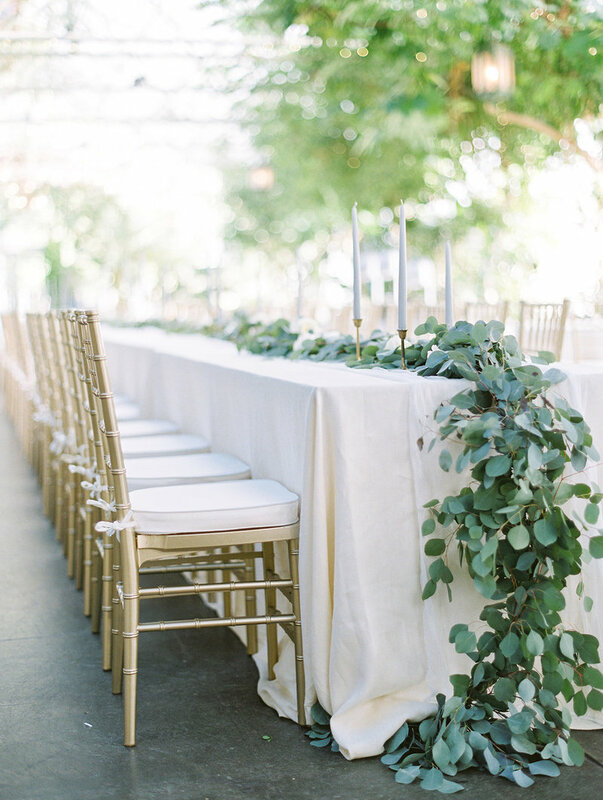 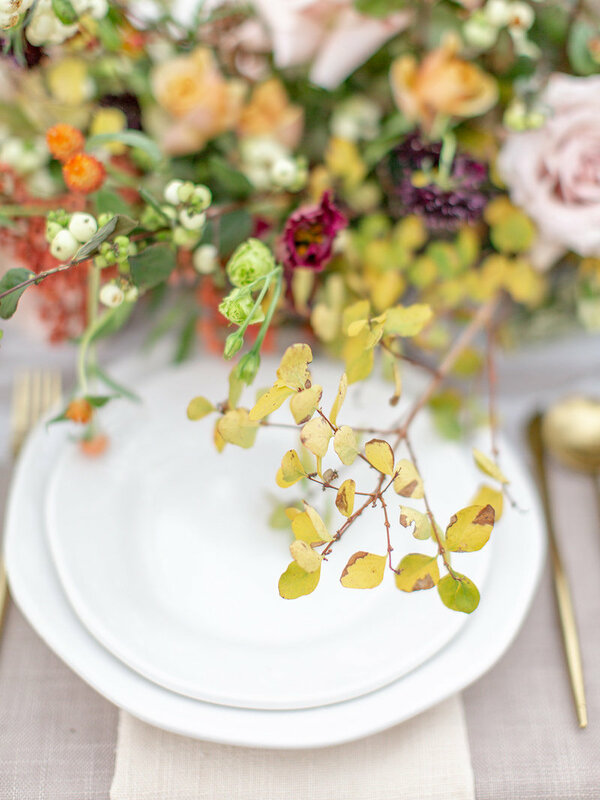 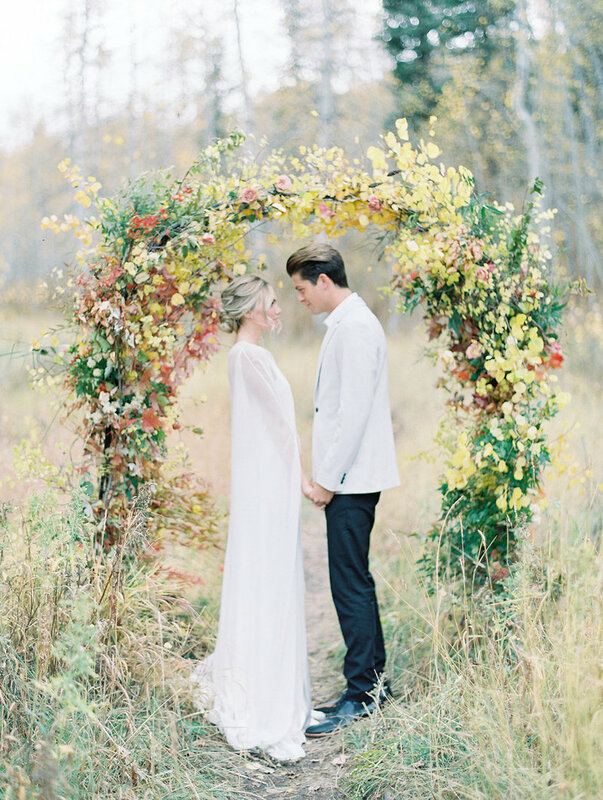 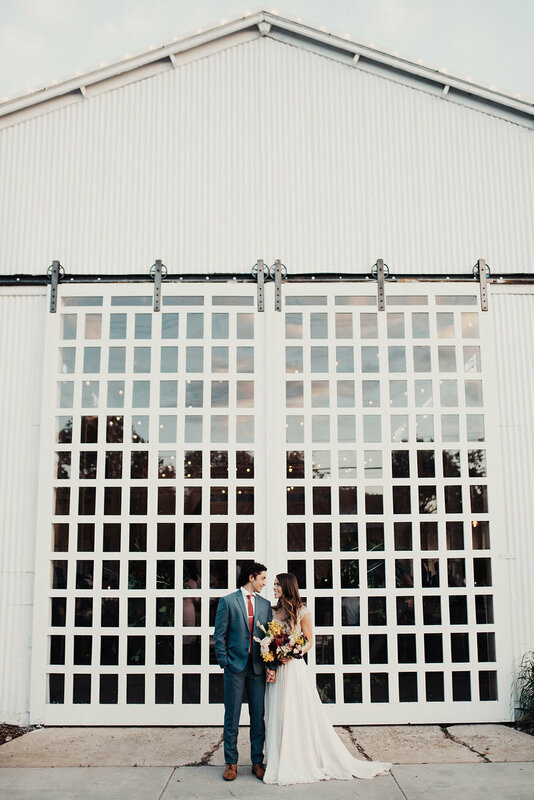 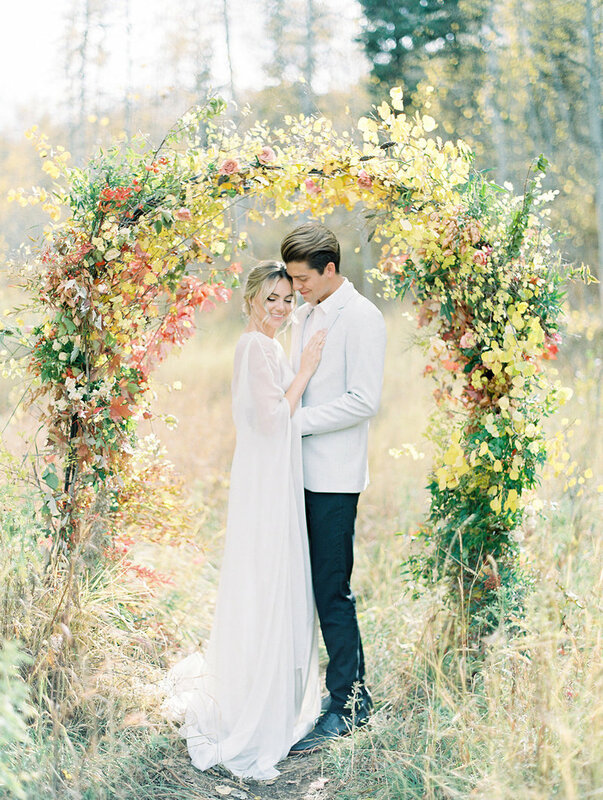 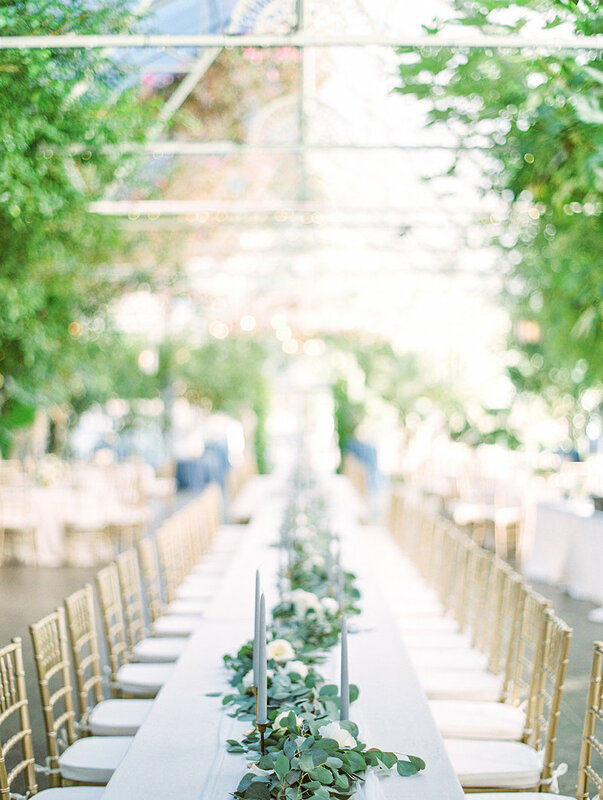 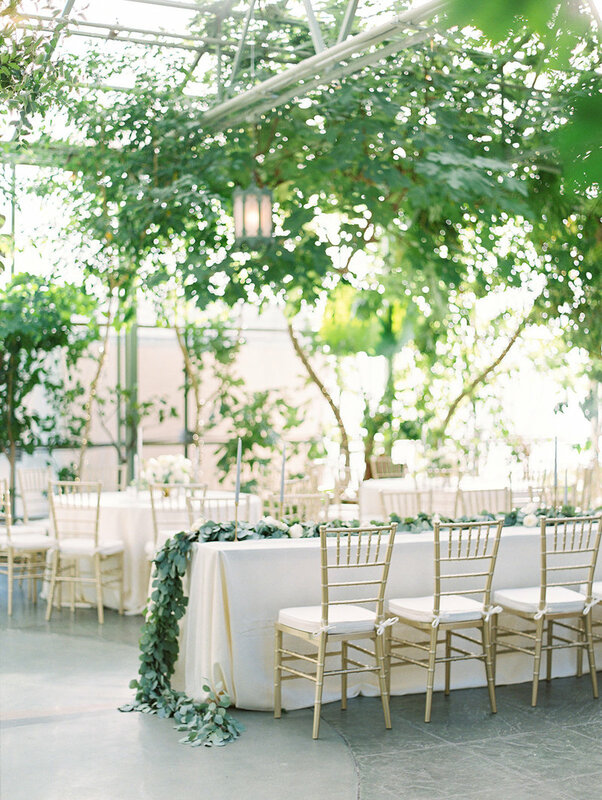 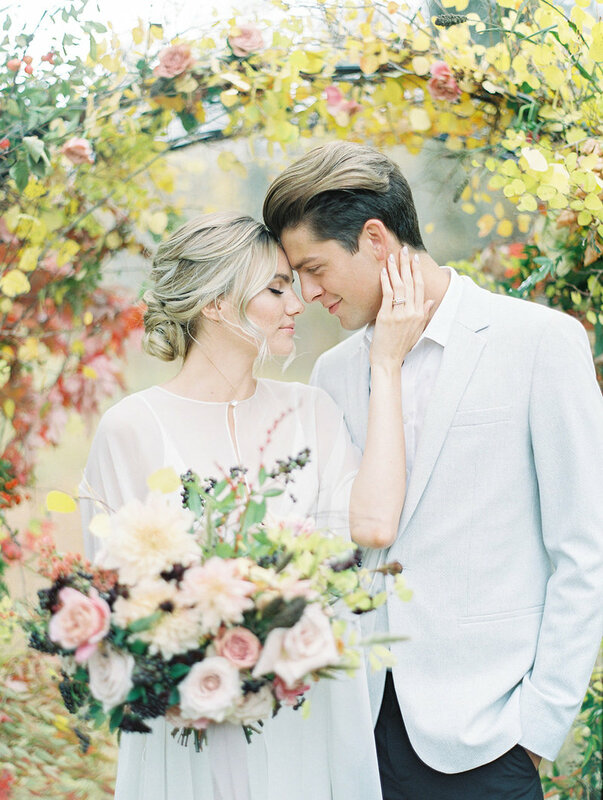 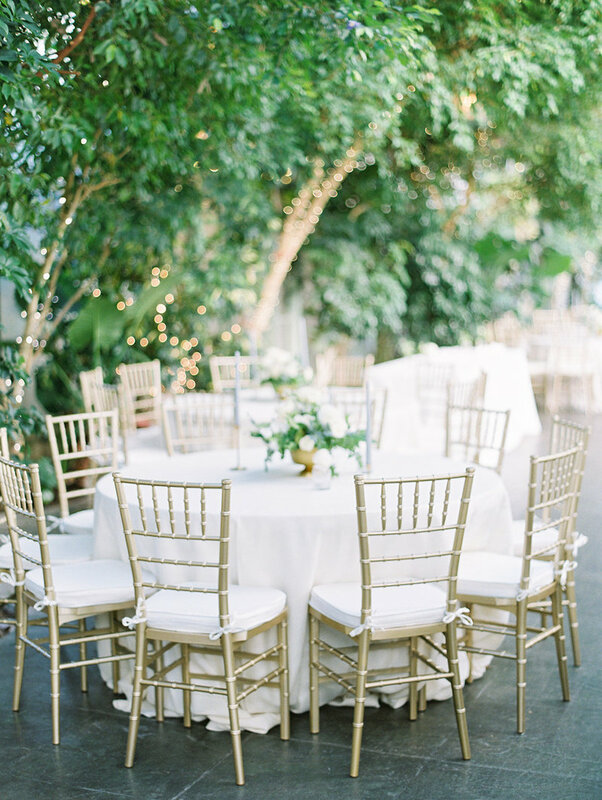 This couple chose a gorgeous greenhouse for their late October celebration. 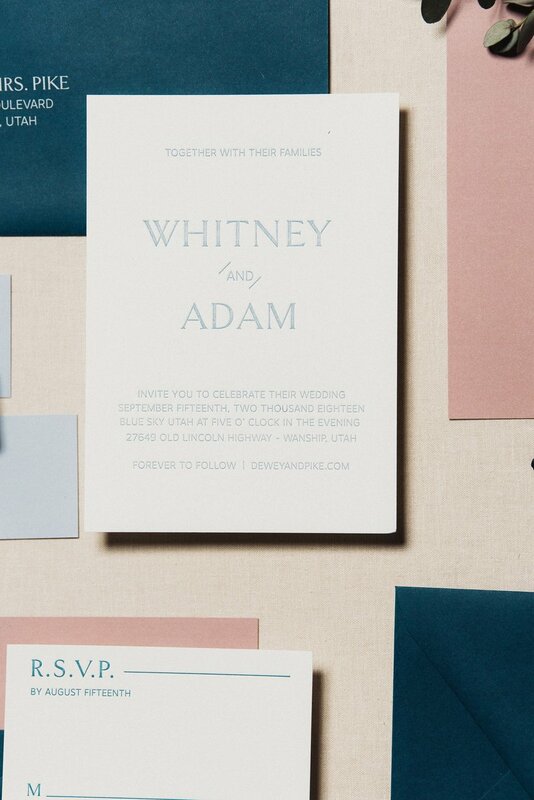 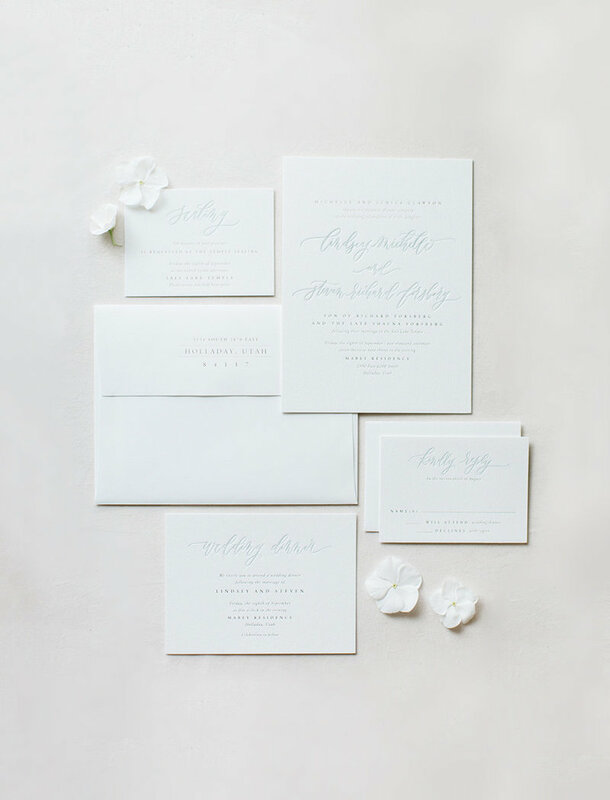 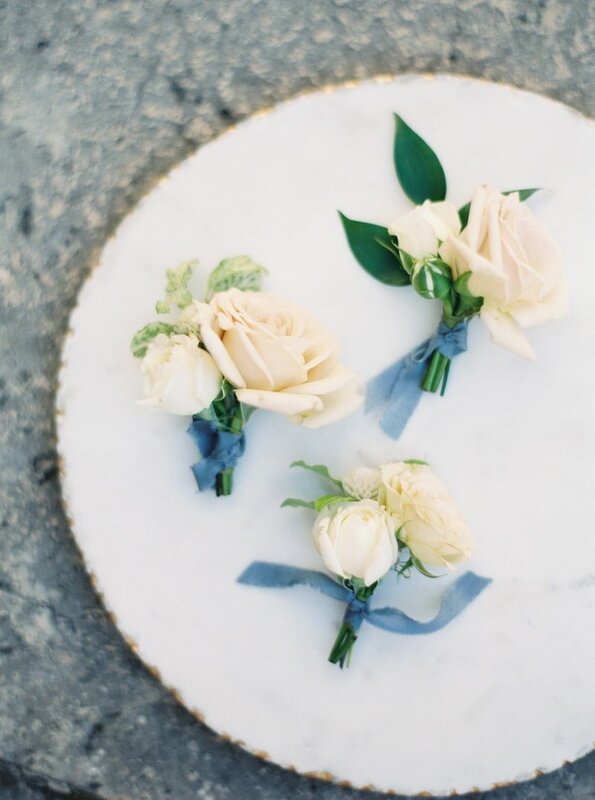 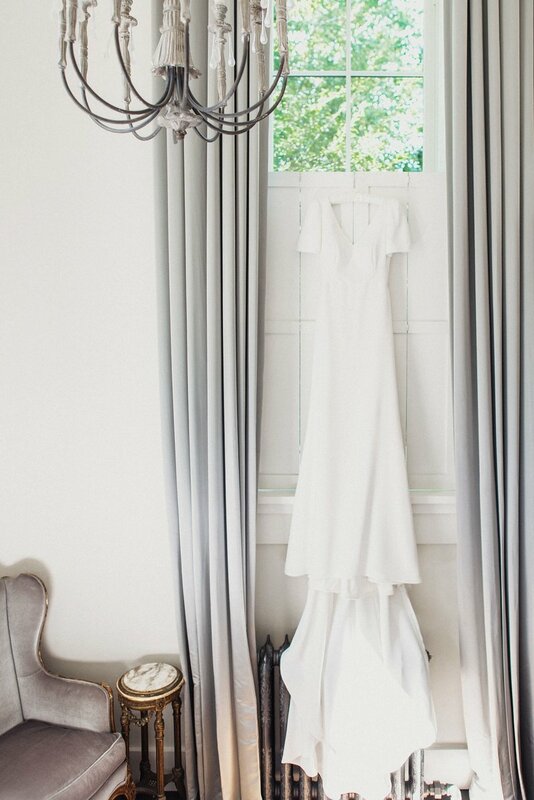 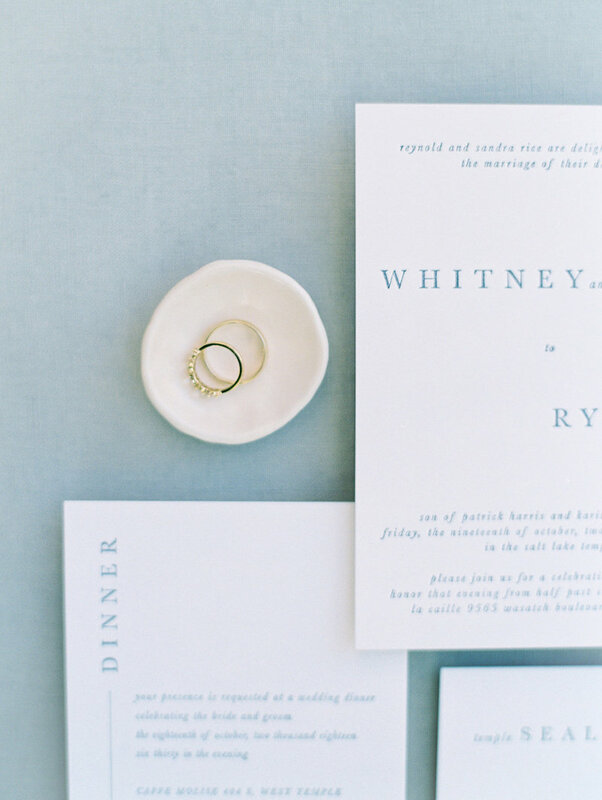 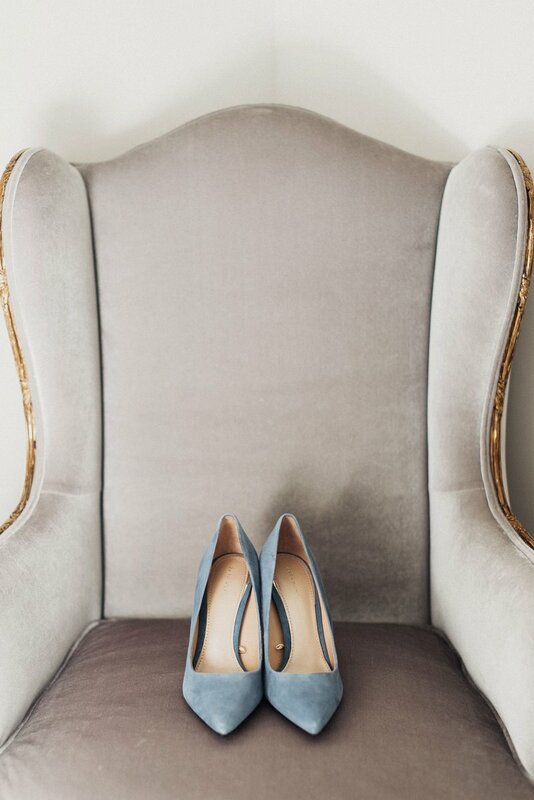 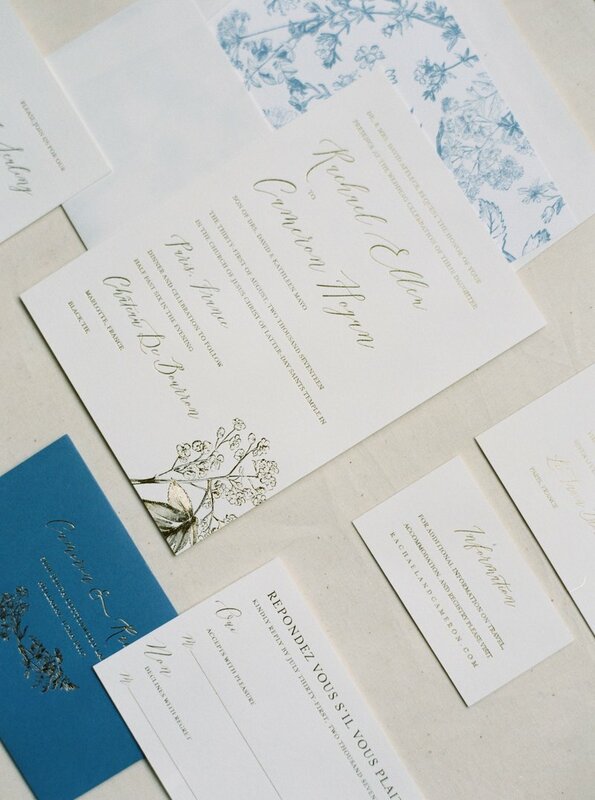 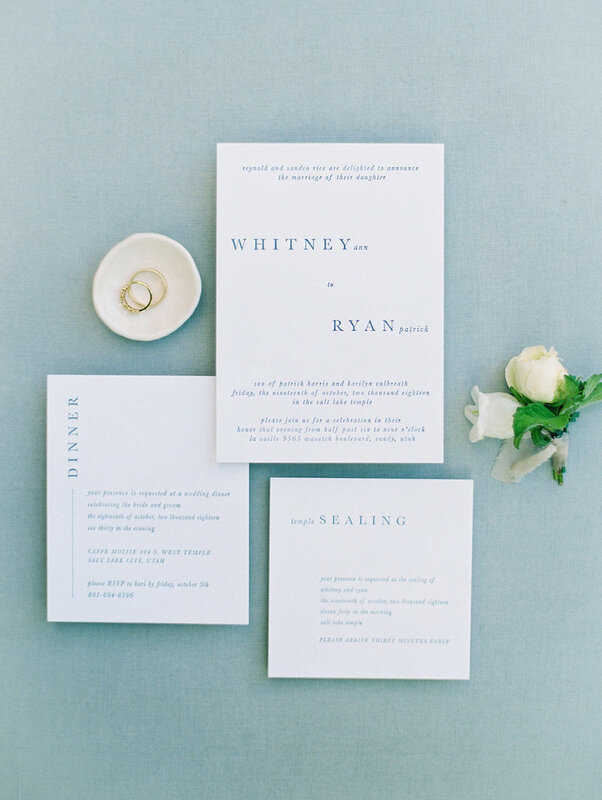 They chose a color palette of dove grey, bone, and French blue to achieve a minimal yet chic look. 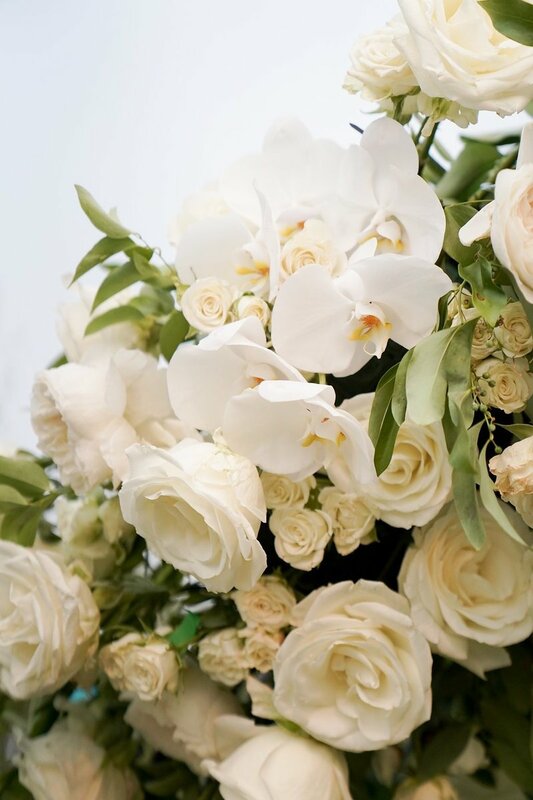 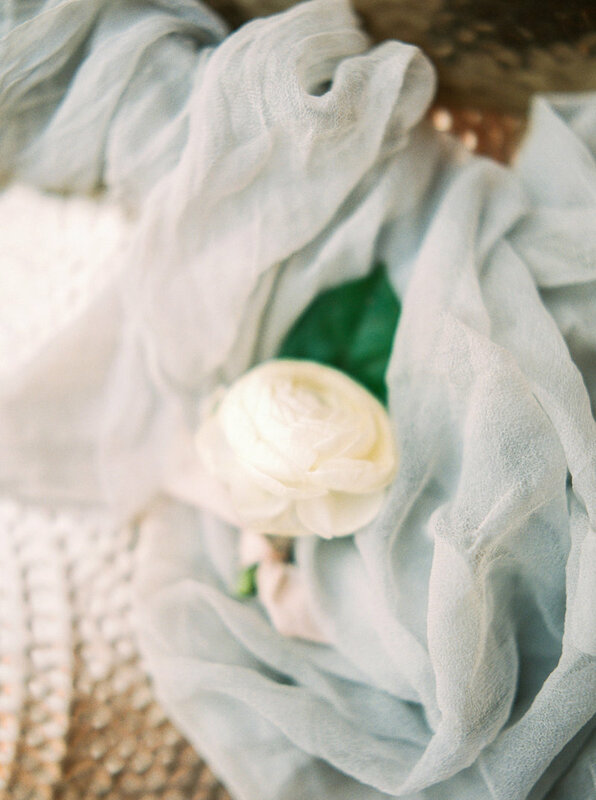 All white flowers wrapped in raw silk ribbon completed the timeless design with luxe gold details adding to the classic feel of the evening. 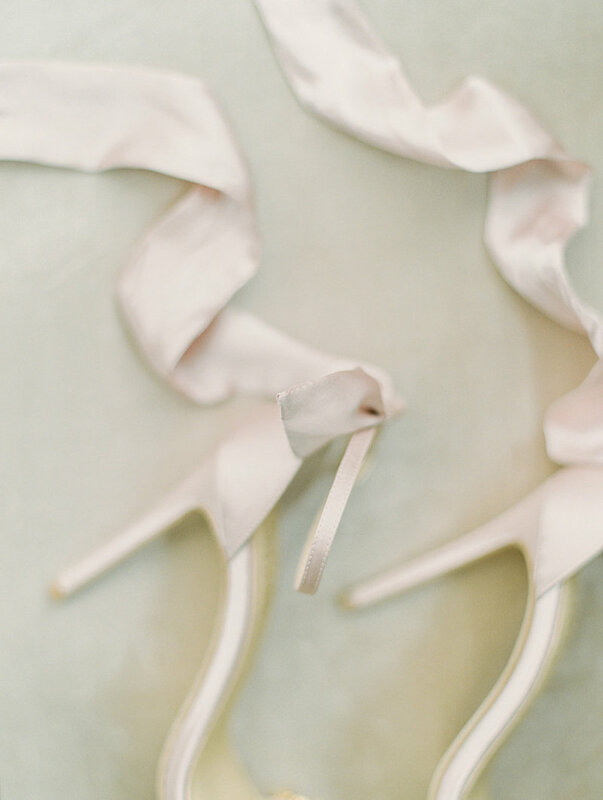 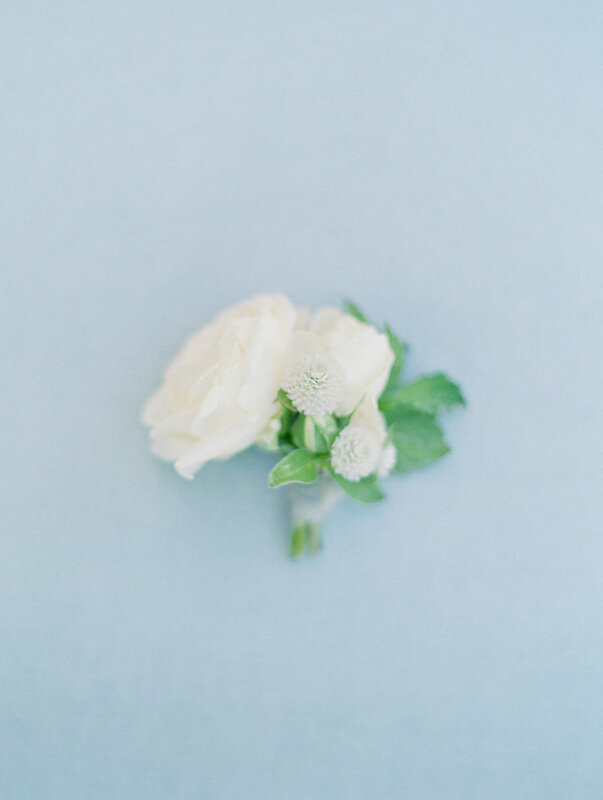 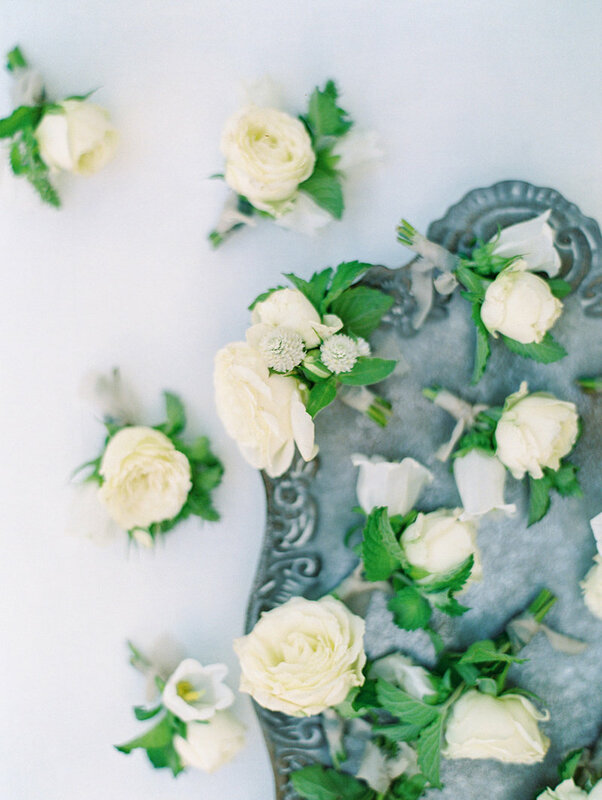 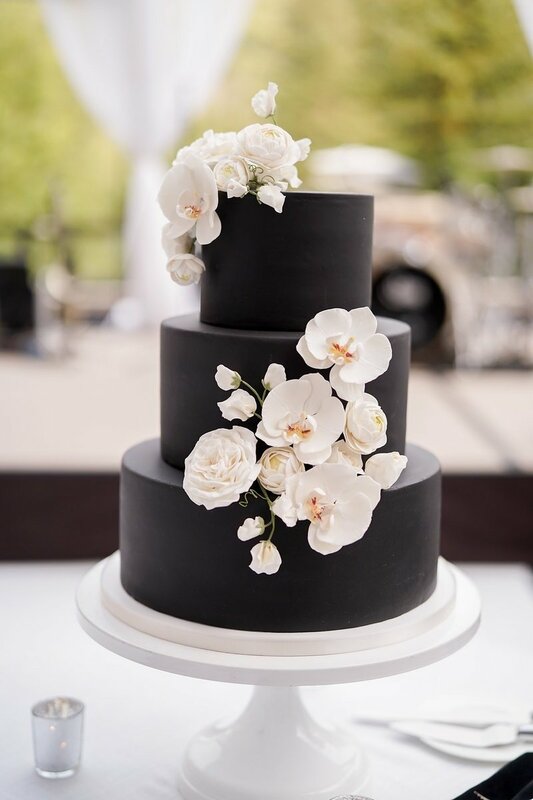 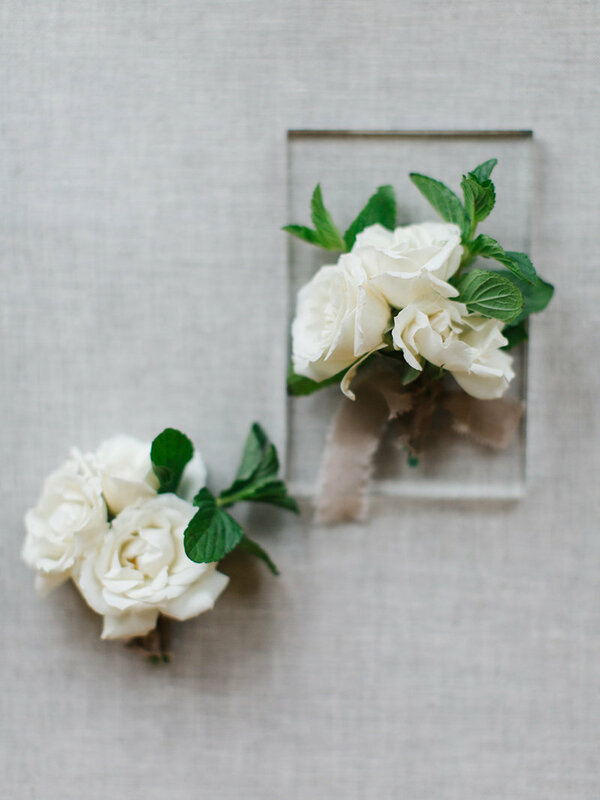 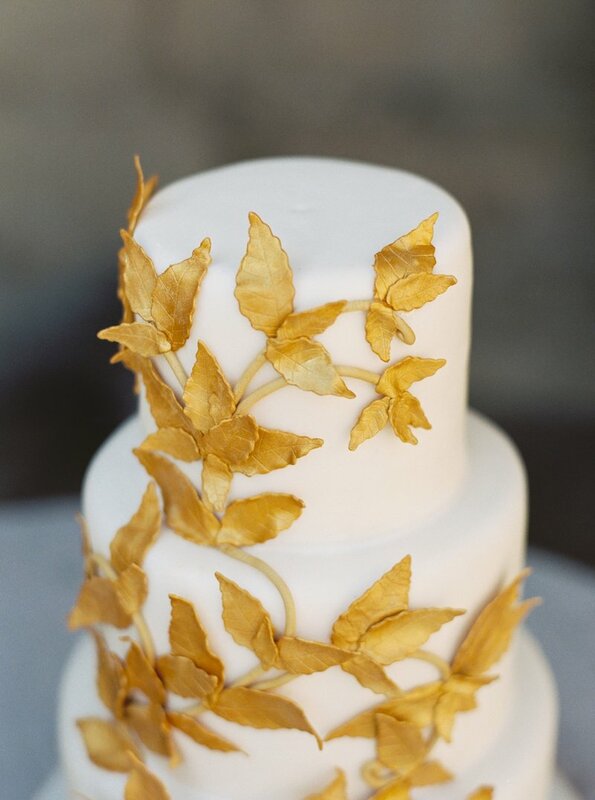 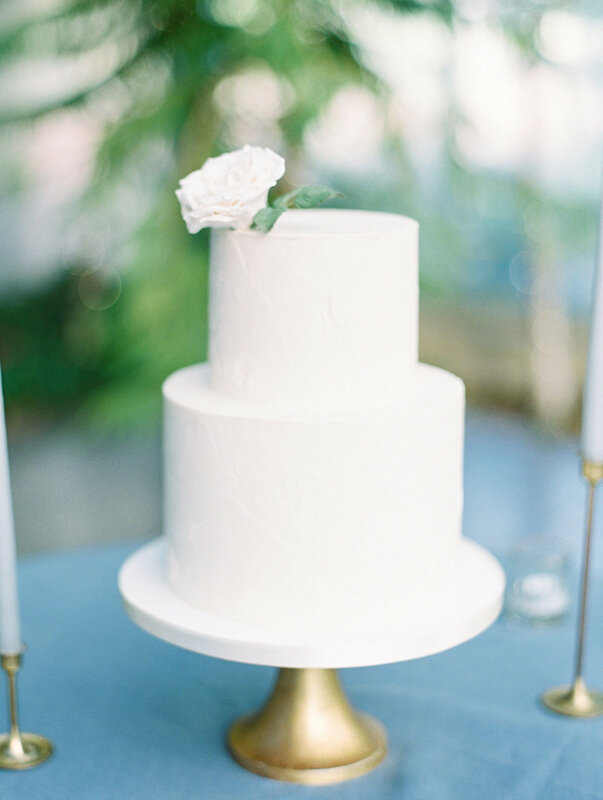 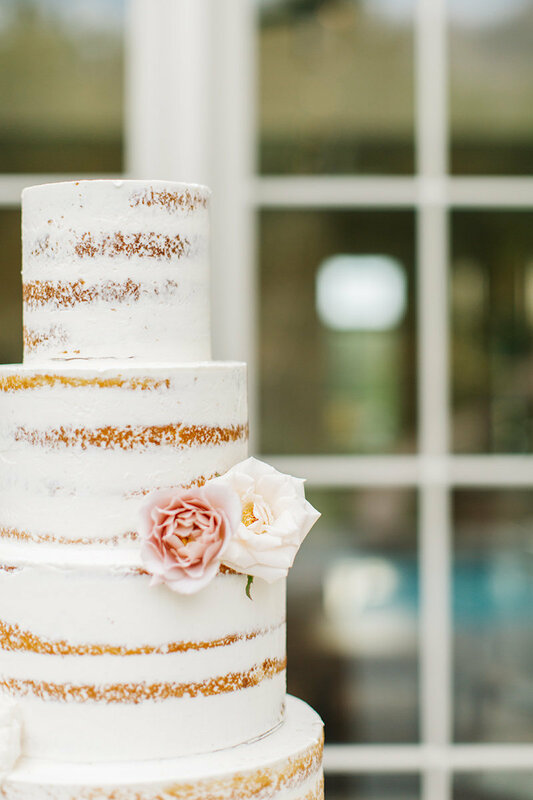 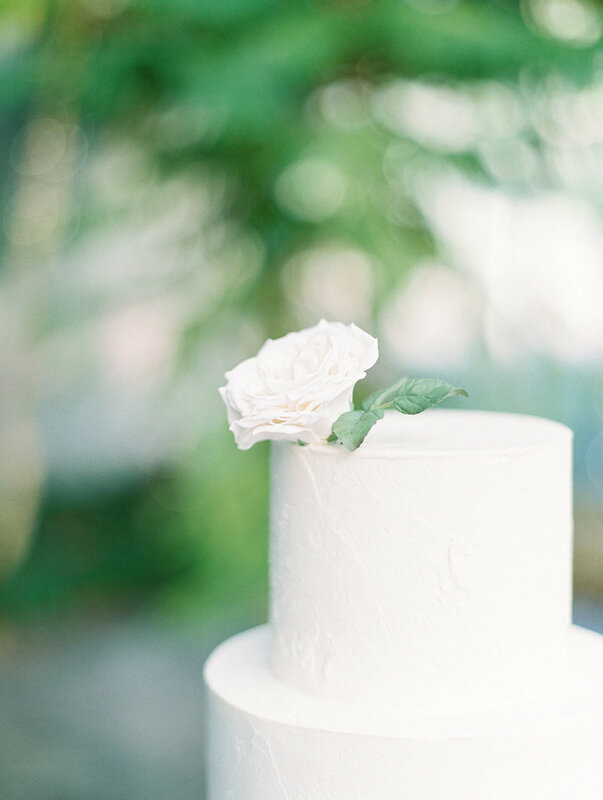 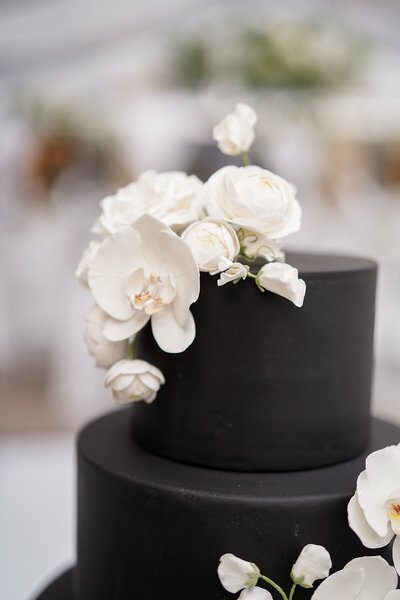 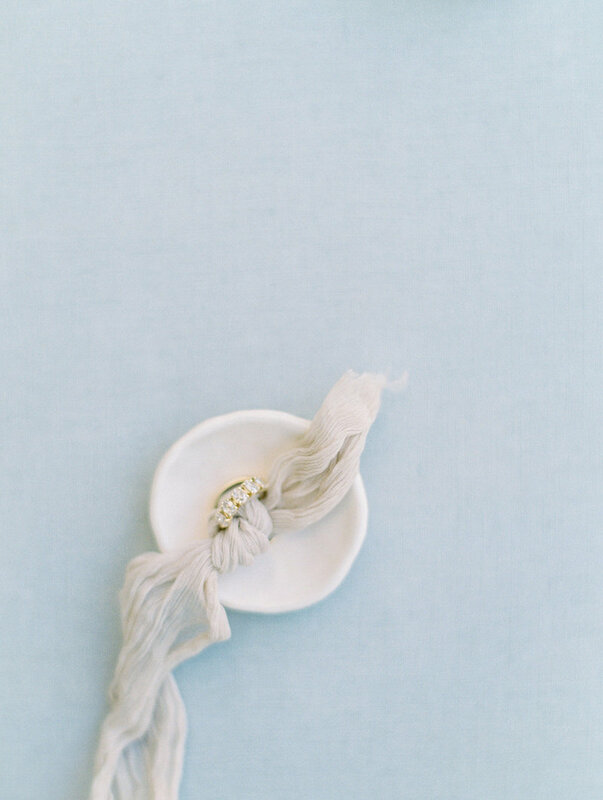 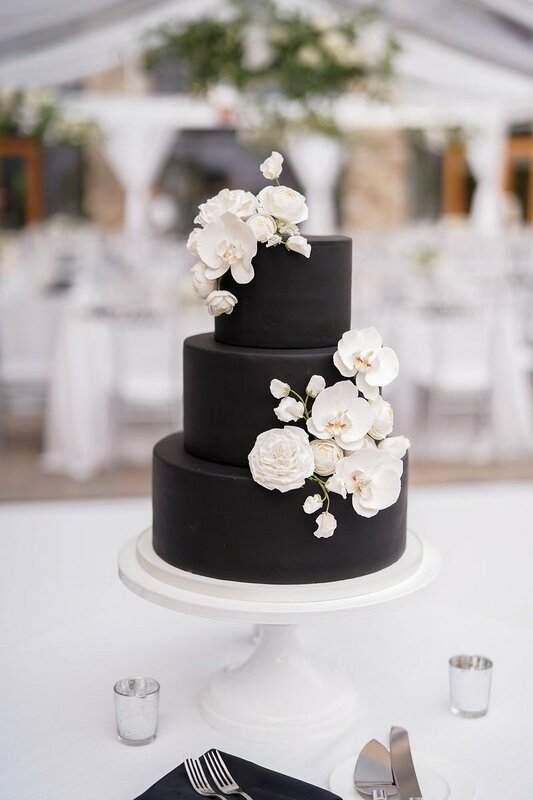 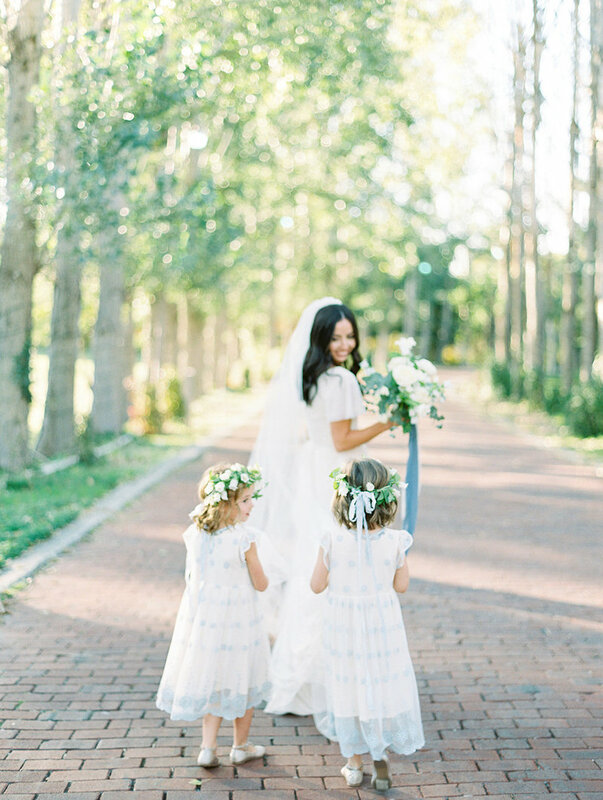 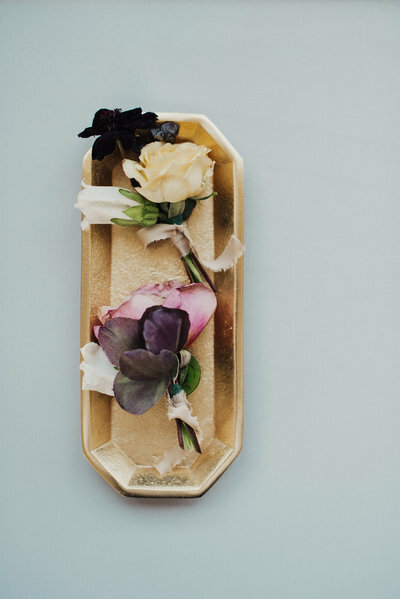 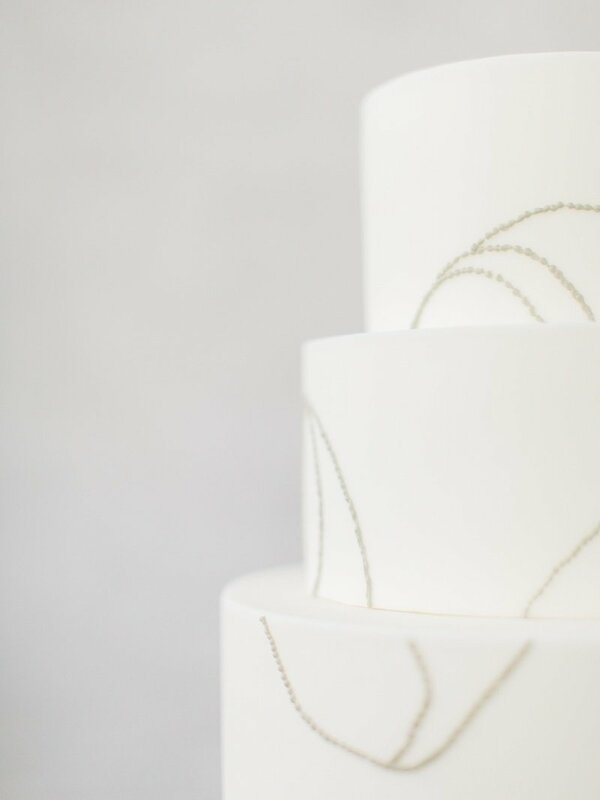 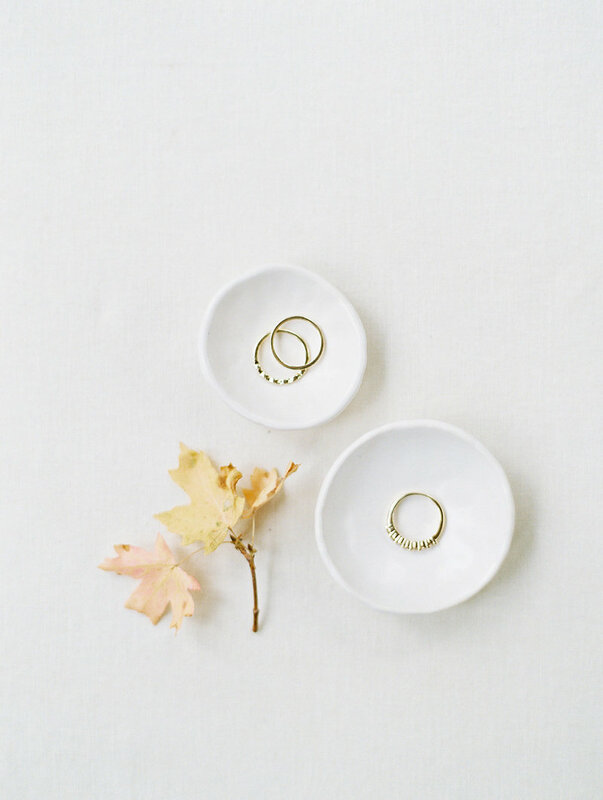 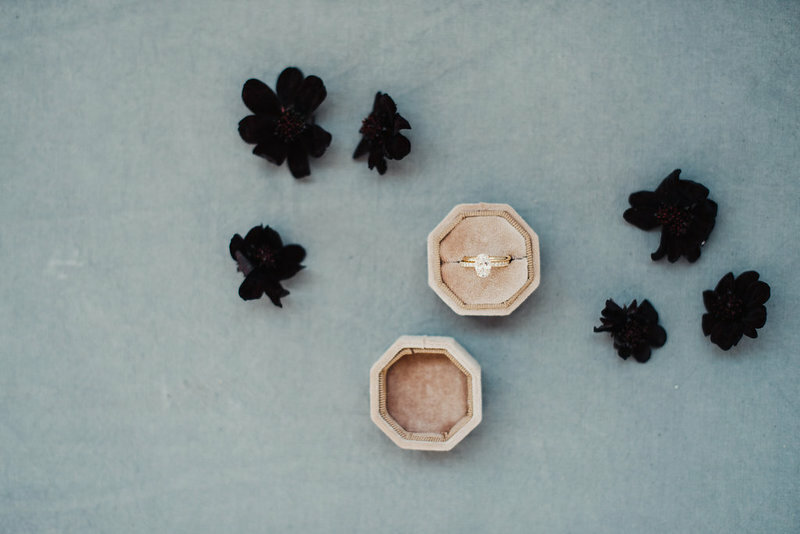 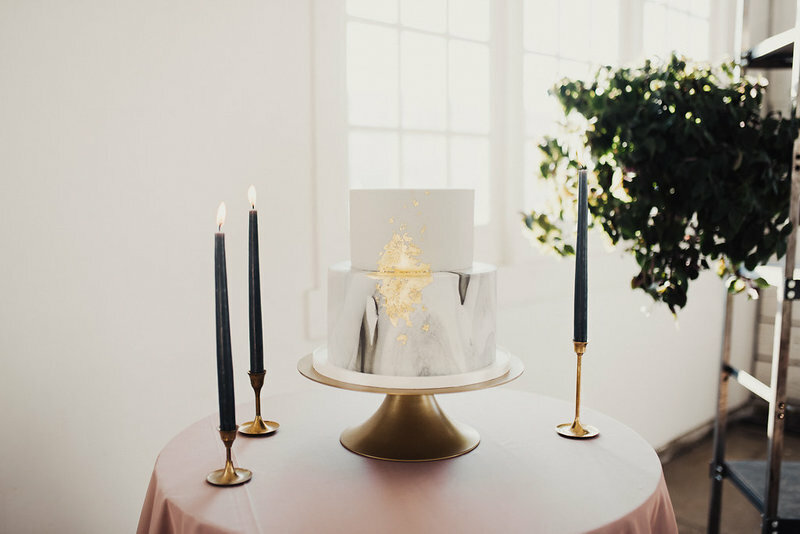 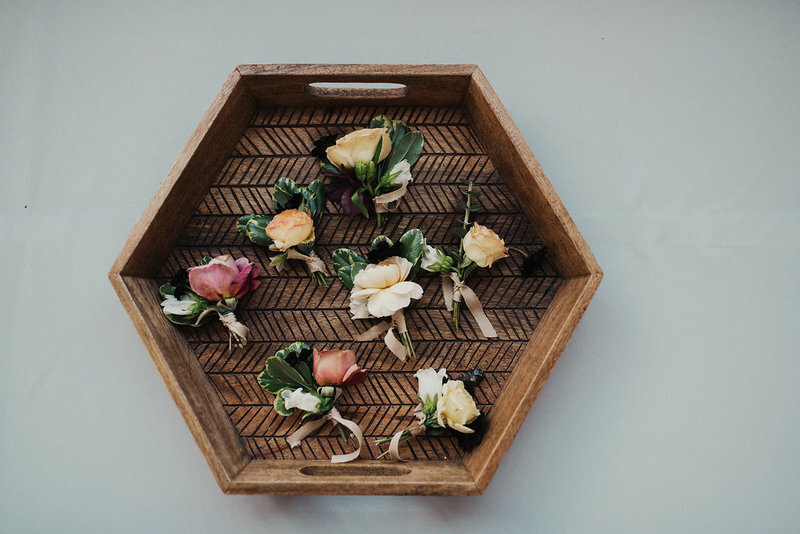 Our favorite details include the flower girl headbands and their minimalist wedding cake. 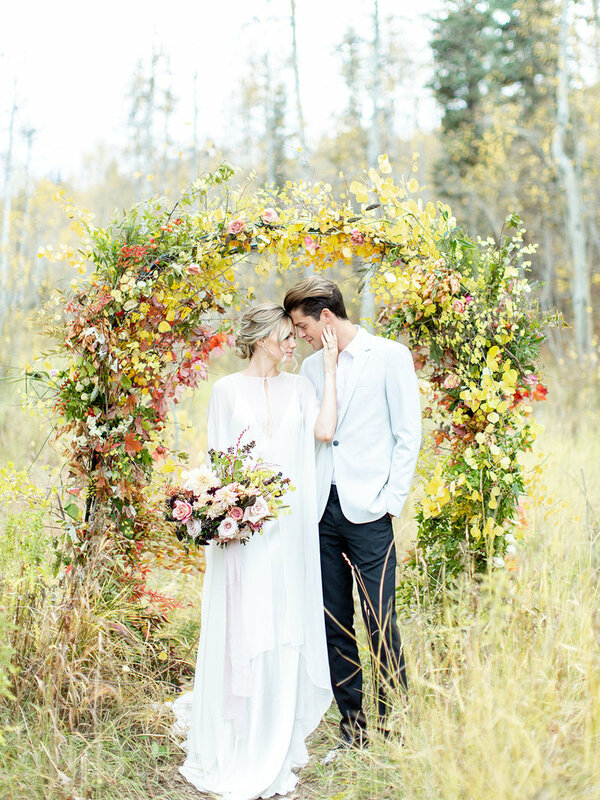 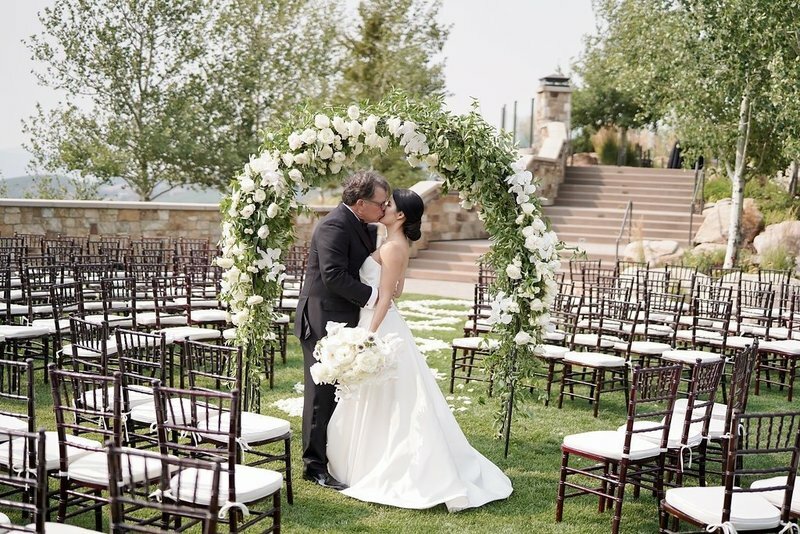 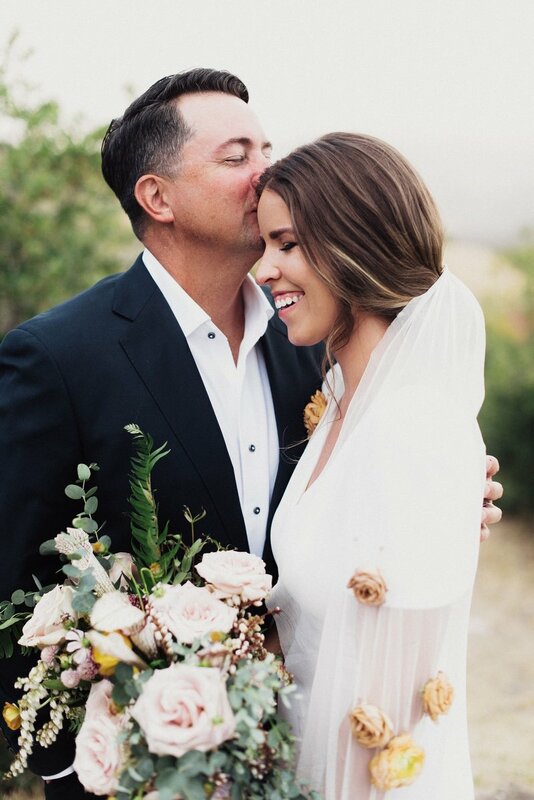 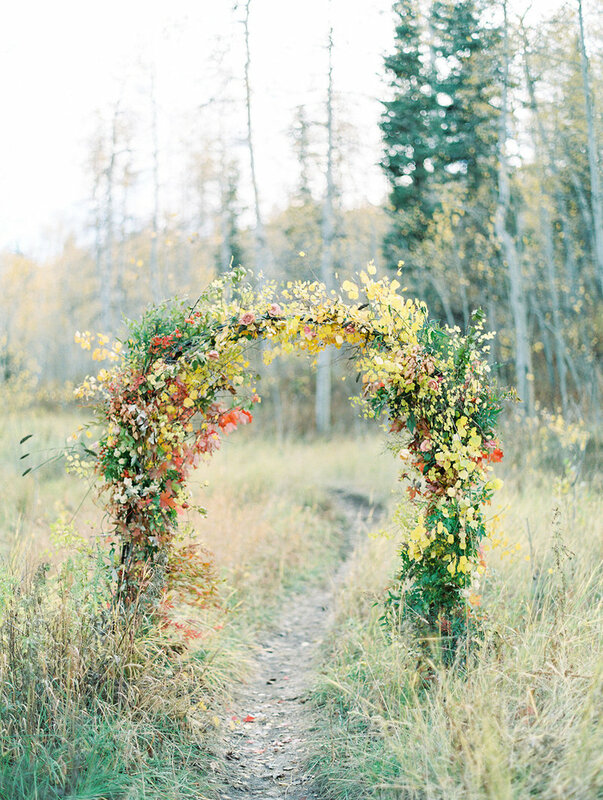 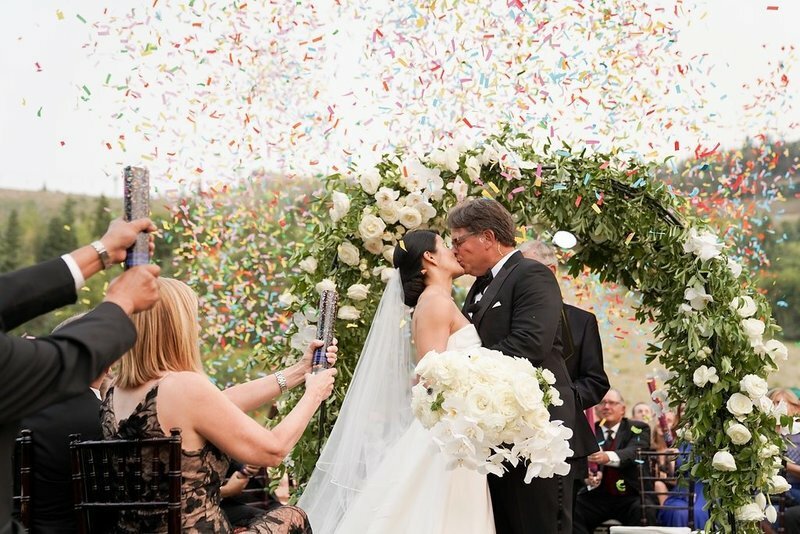 Kurt & Angelina was wed atop a mountain under an organic floral arch with 200 of their closest family and friends. 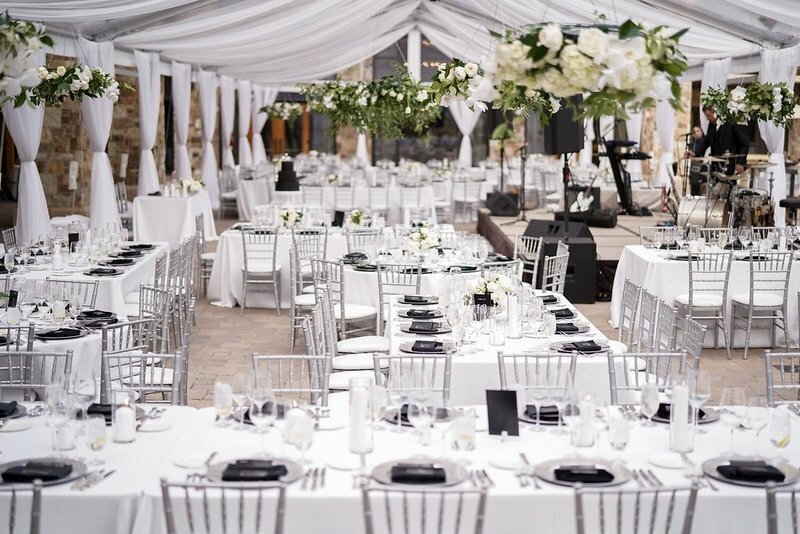 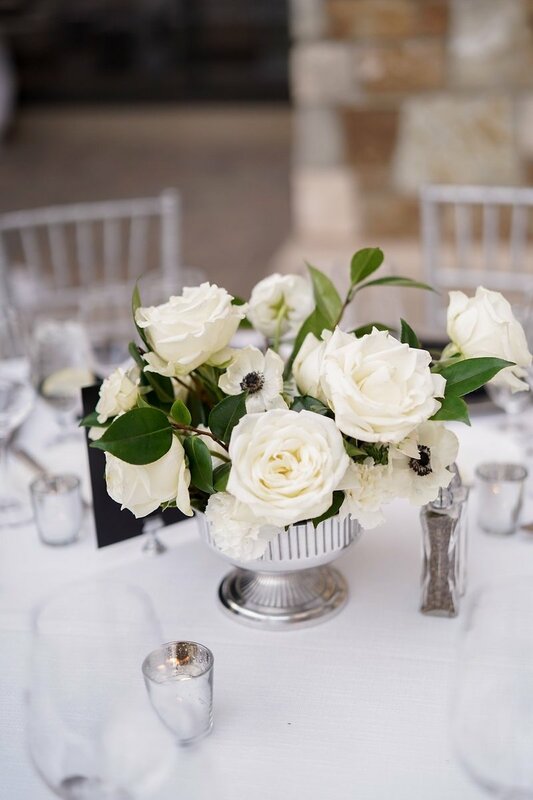 Their event was centered around a black and white design with silver accents for a modern and classic look. 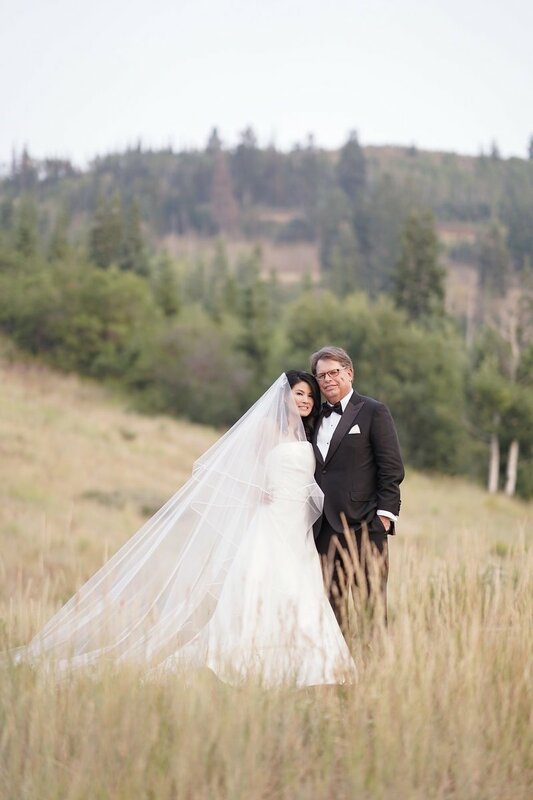 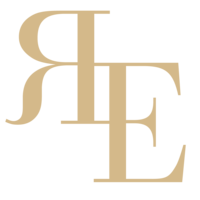 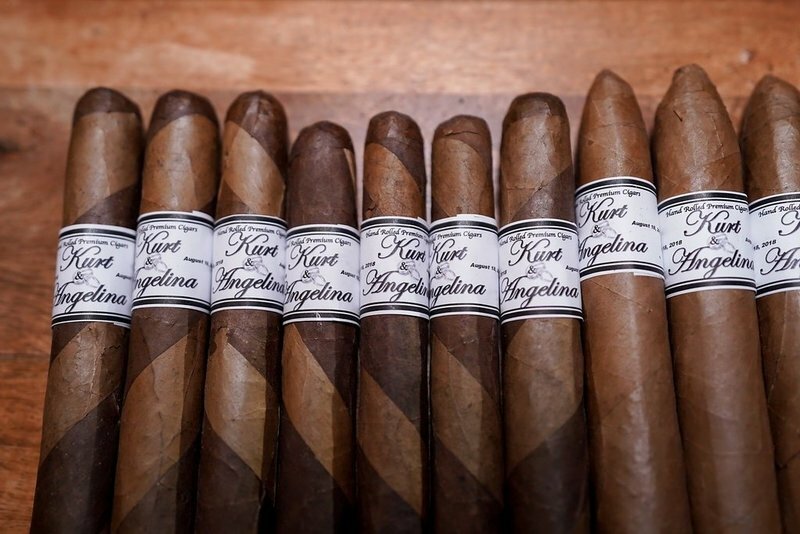 The guests enjoyed a cigar rolling station, caricature artist, and gorgeous mountain views. 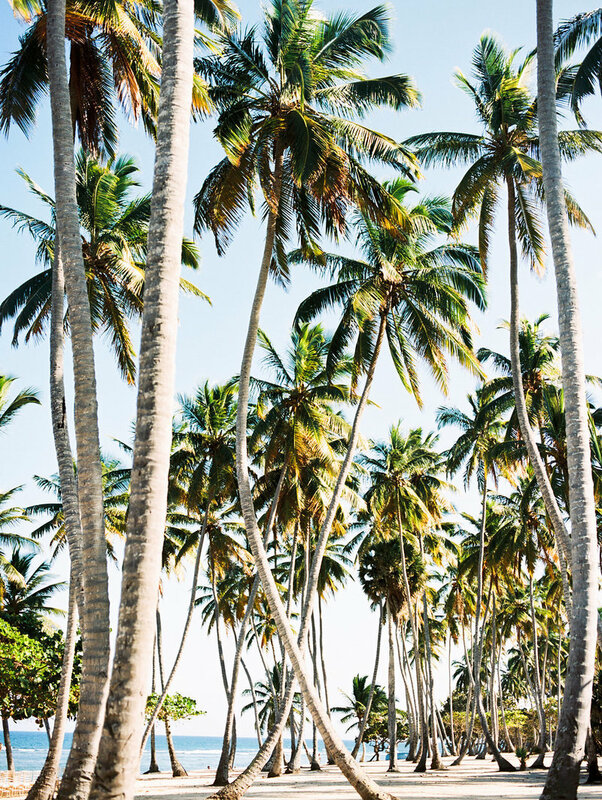 READY TO START THE EXPERIENCE?